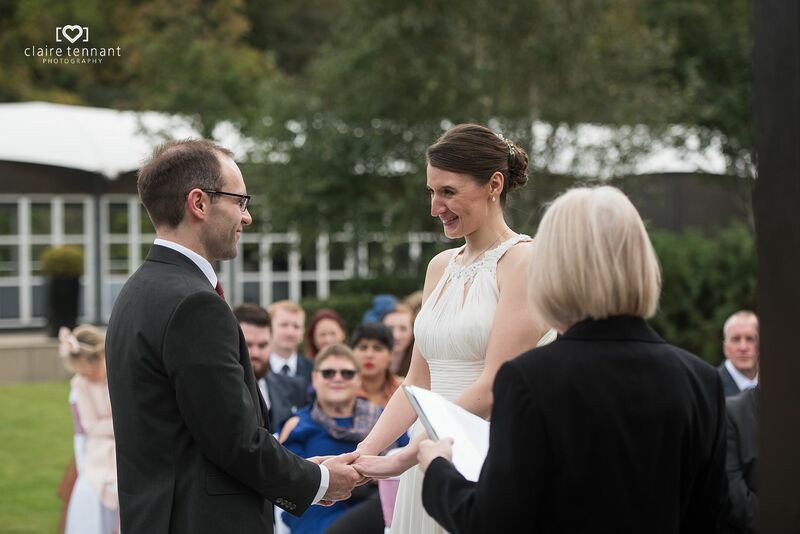 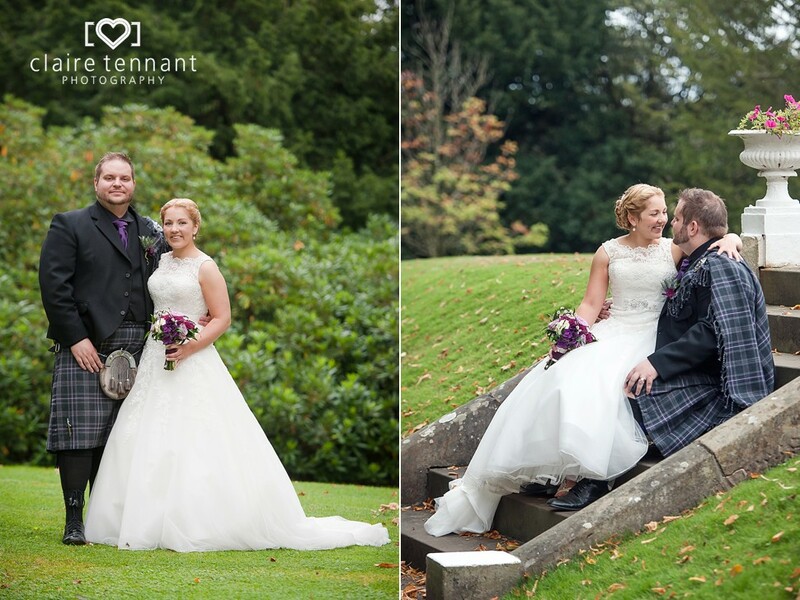 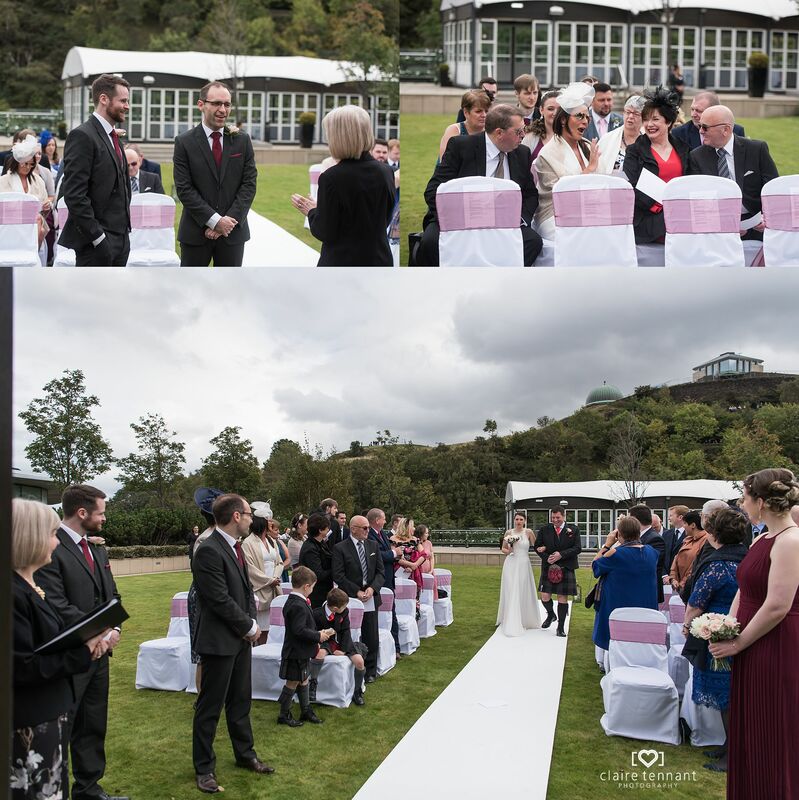 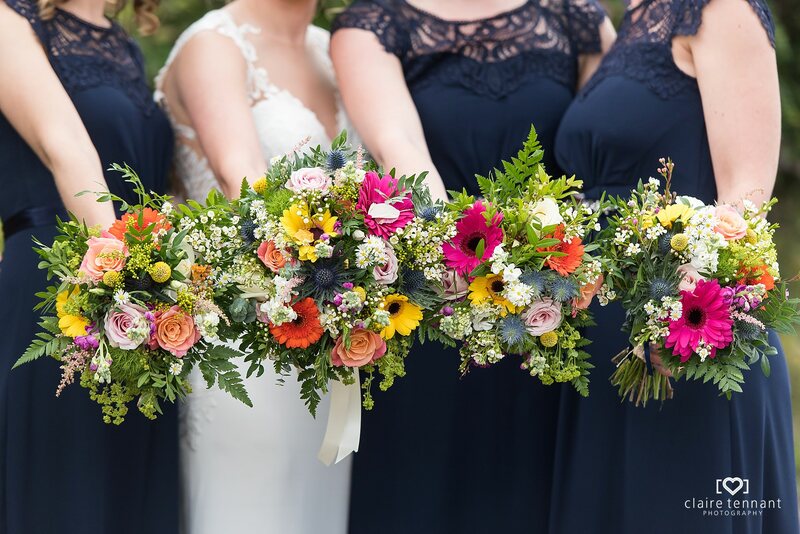 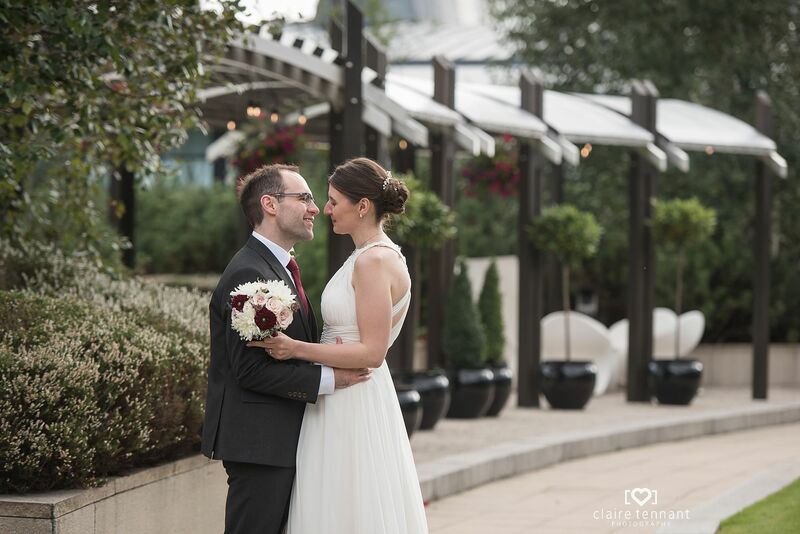 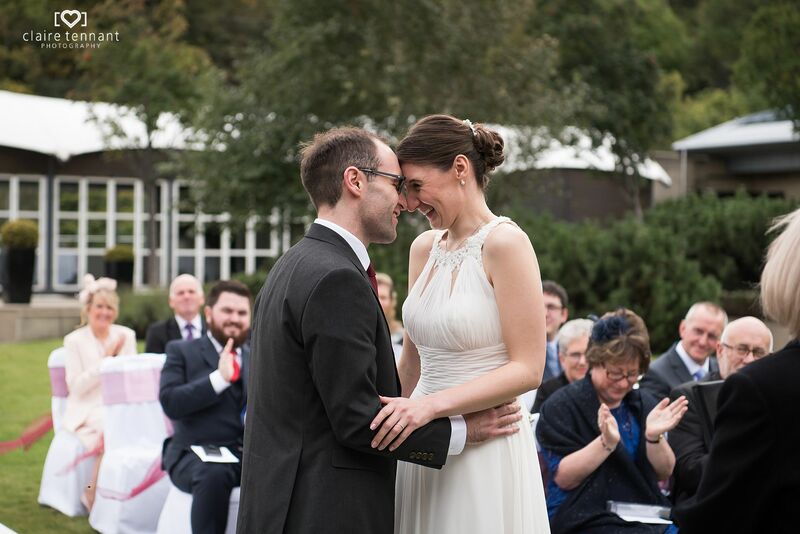 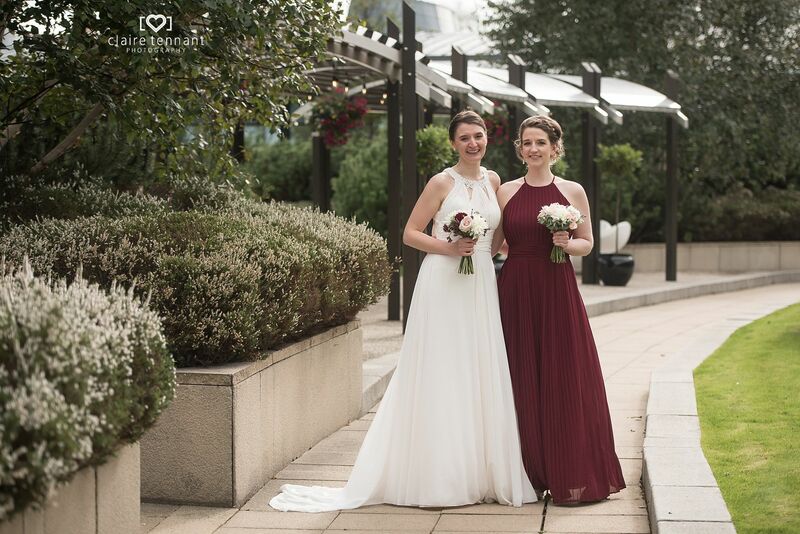 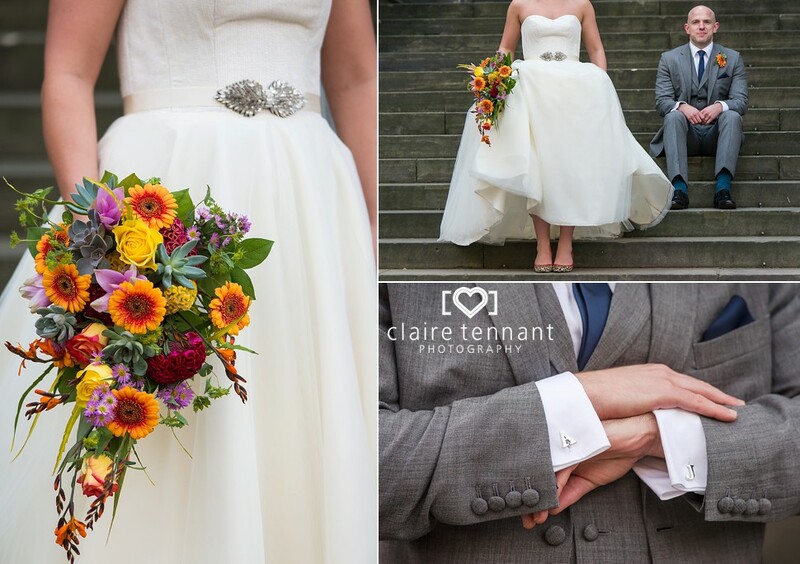 I loved photographing this romantic Autumn outdoor wedding at the Glasshouse. 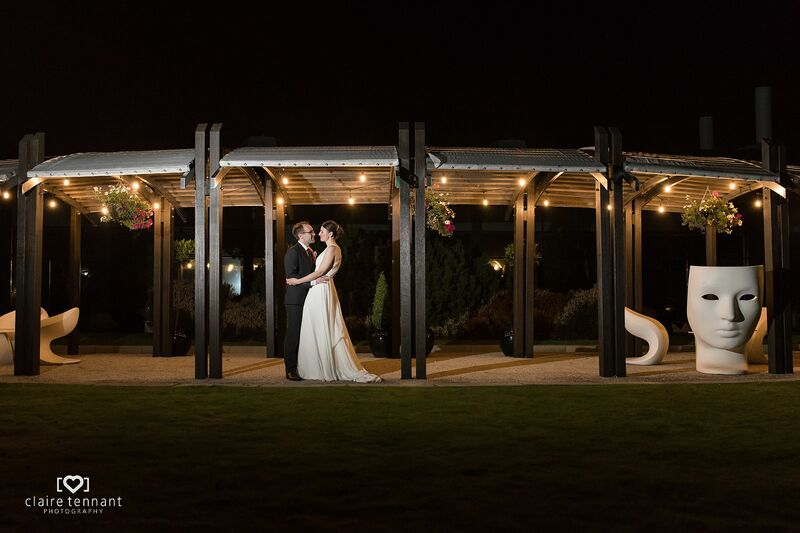 It was my second time photographing a wedding at the venue and yet again it didn’t disappoint. 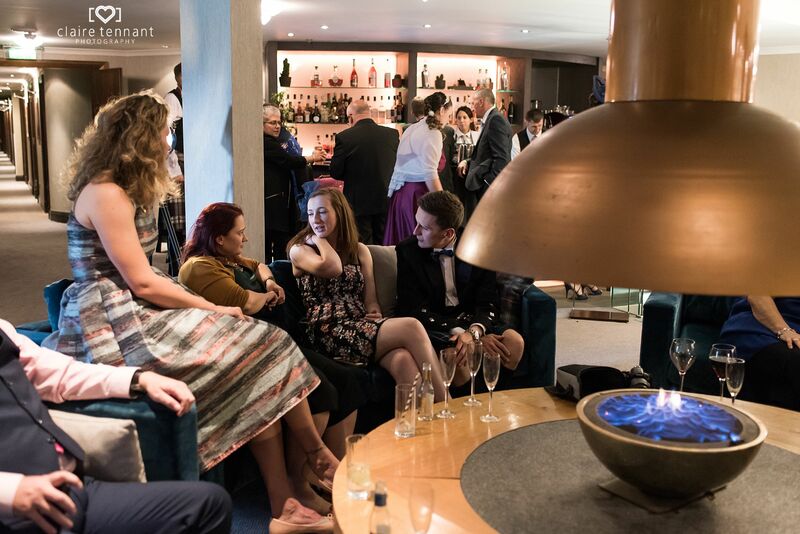 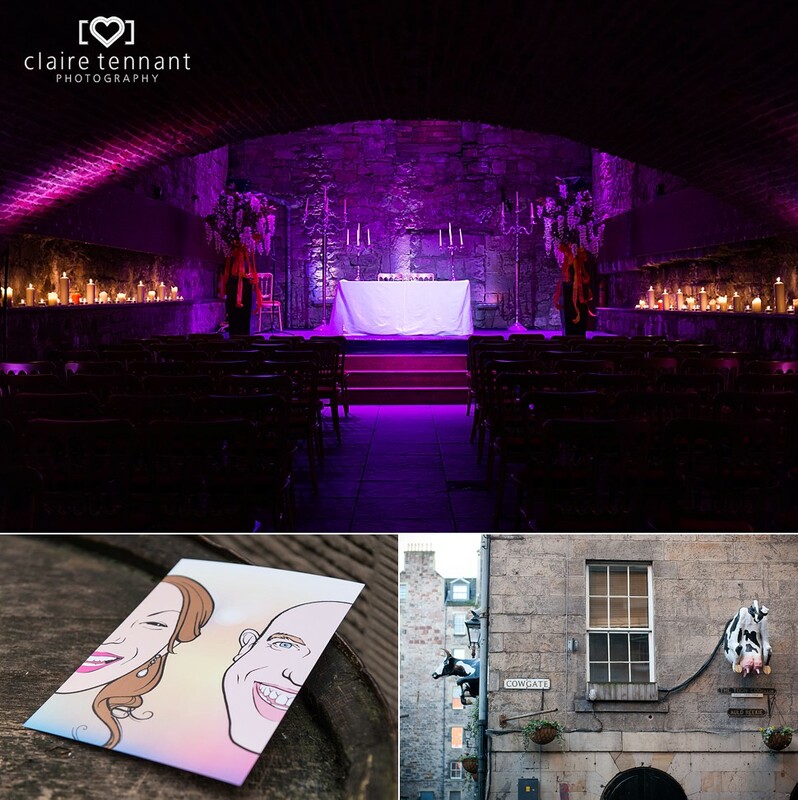 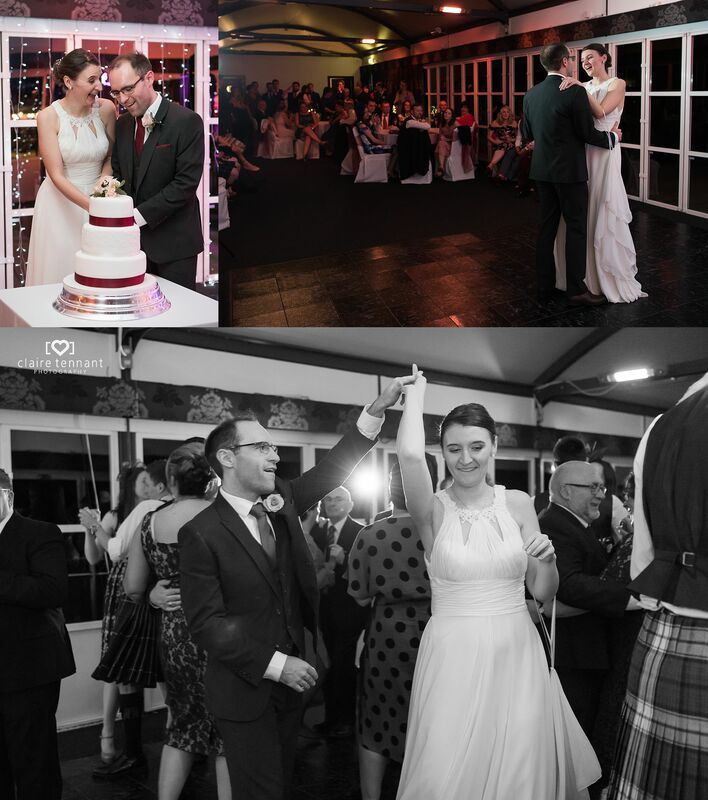 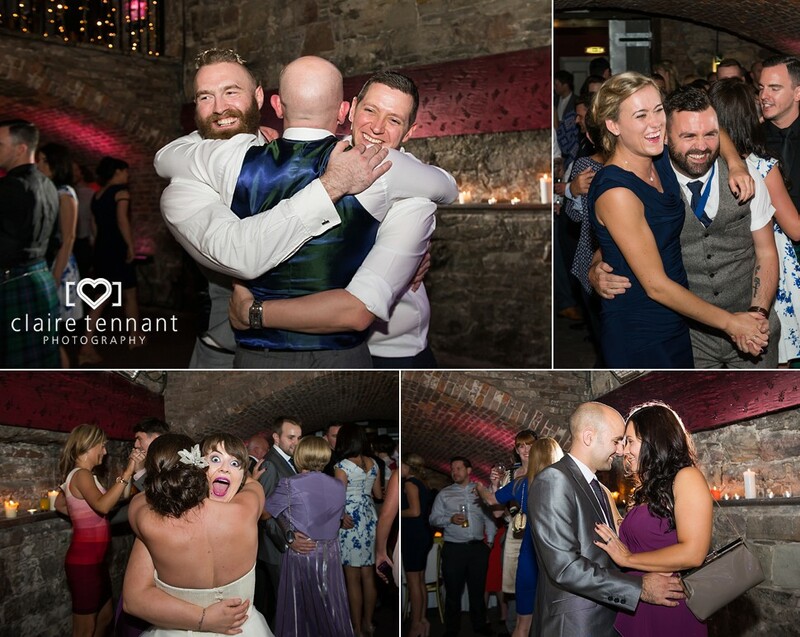 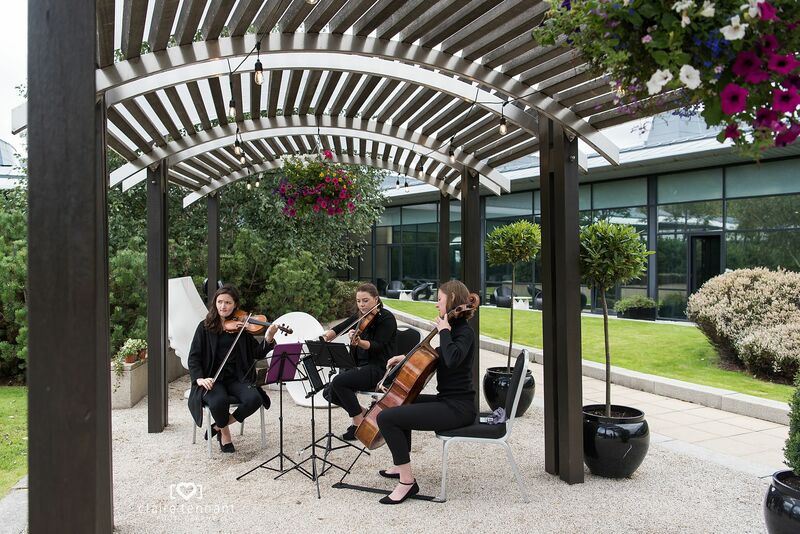 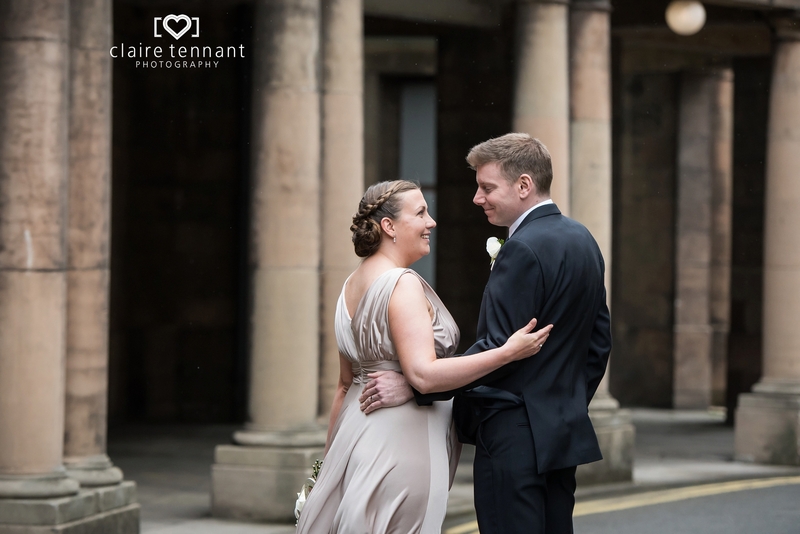 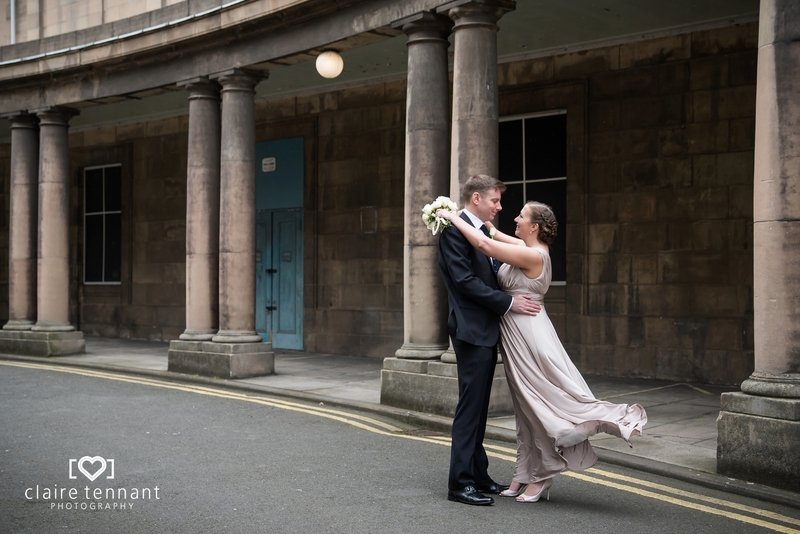 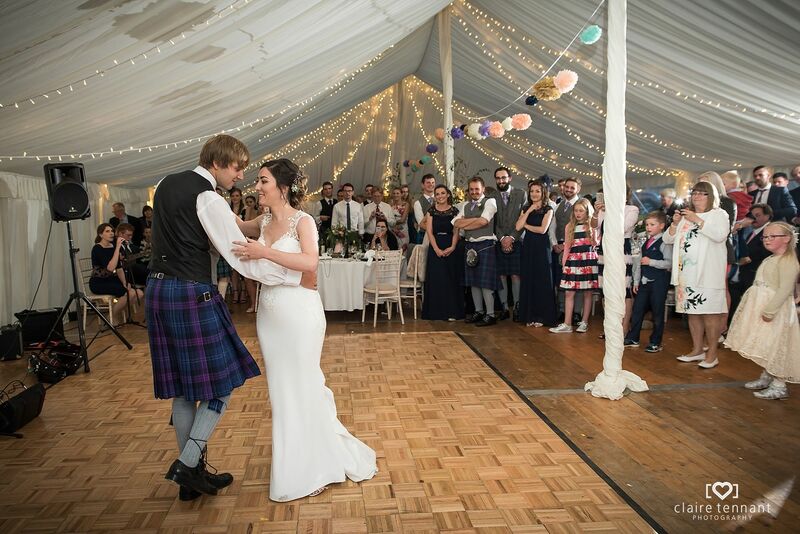 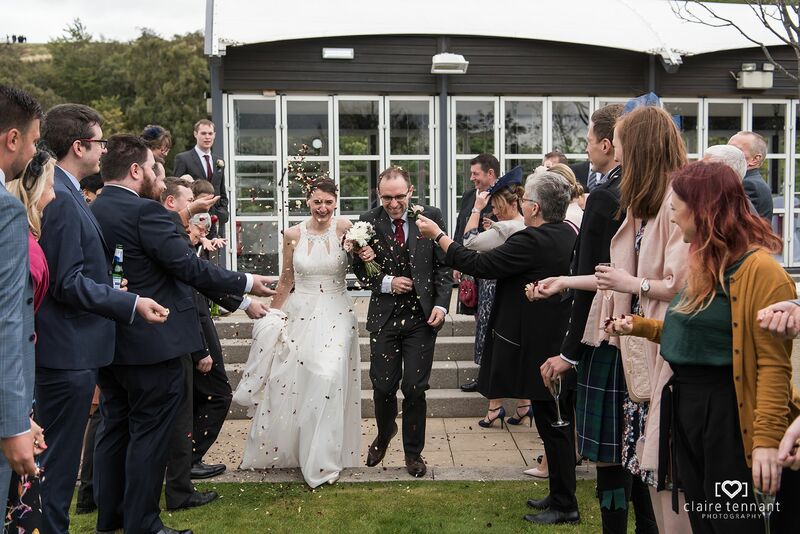 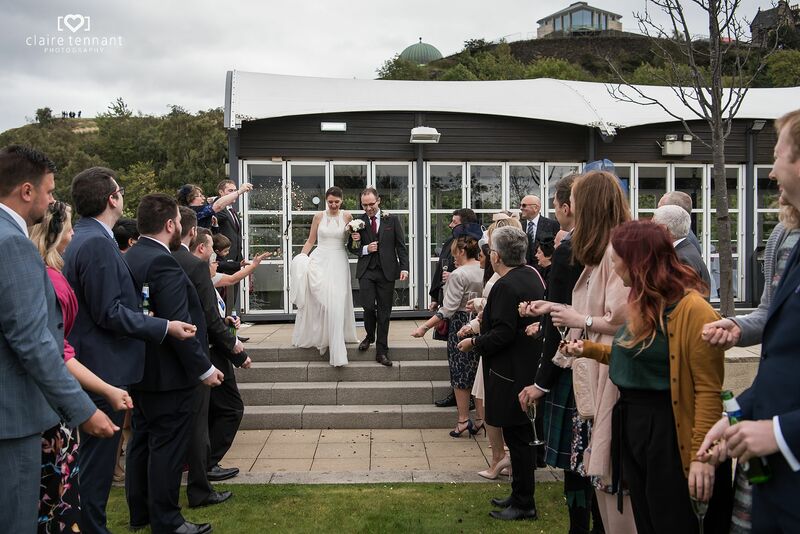 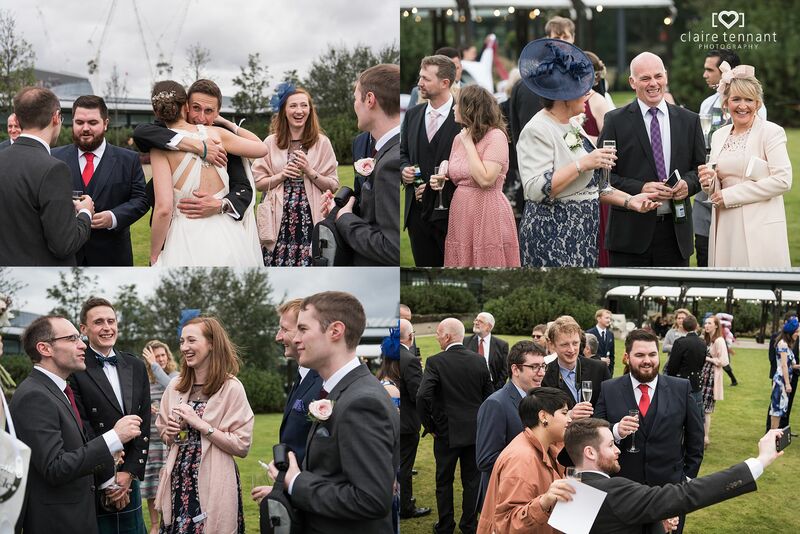 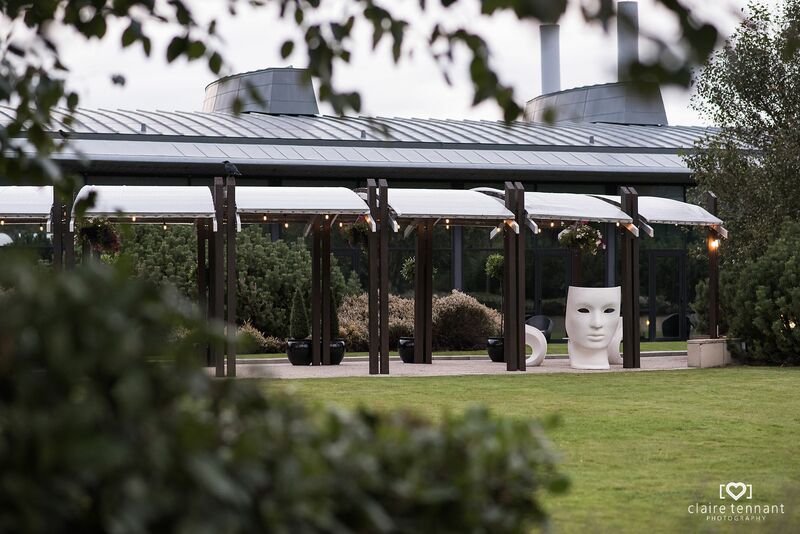 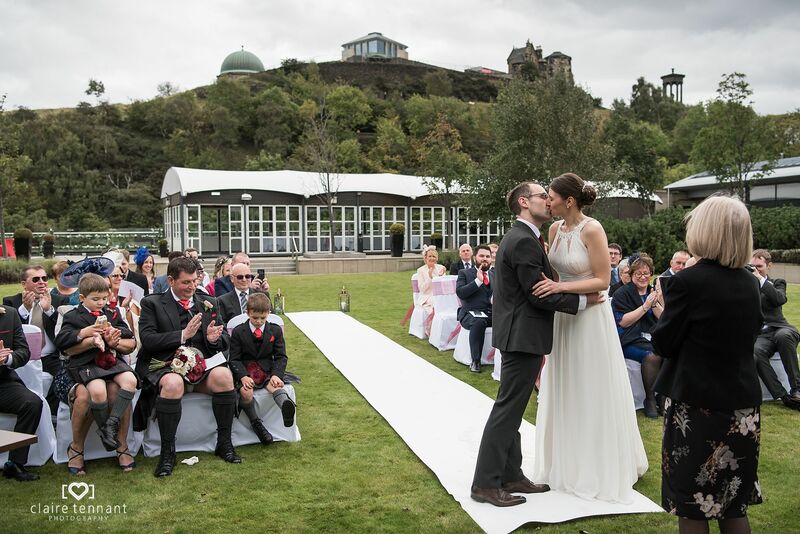 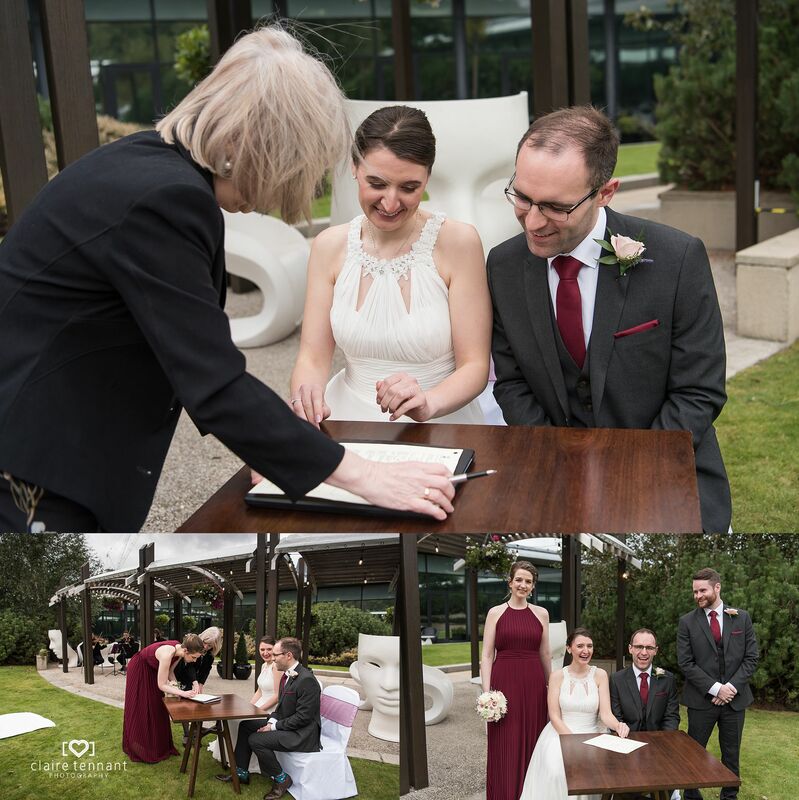 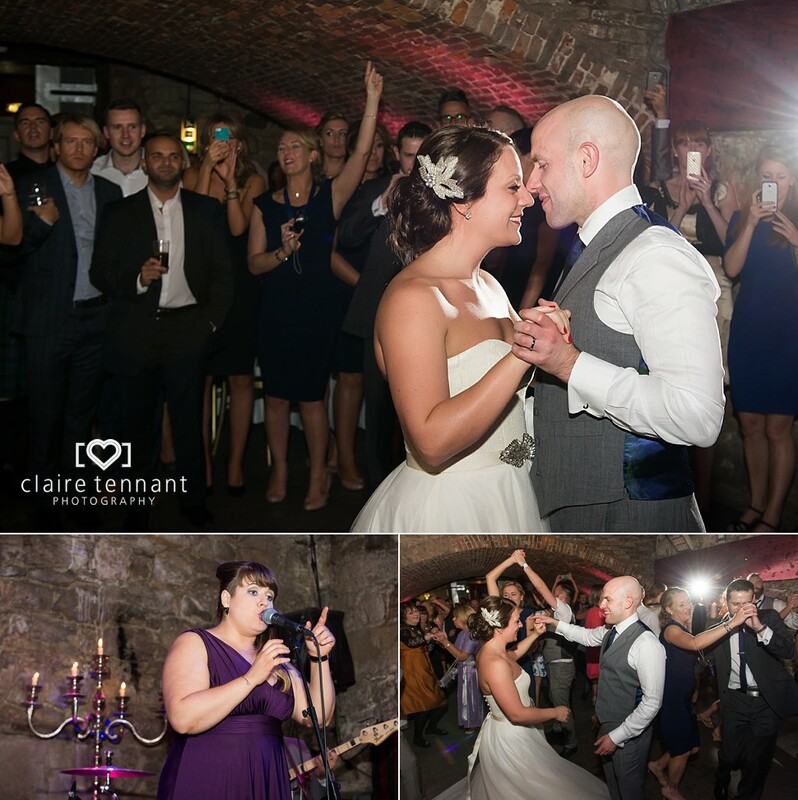 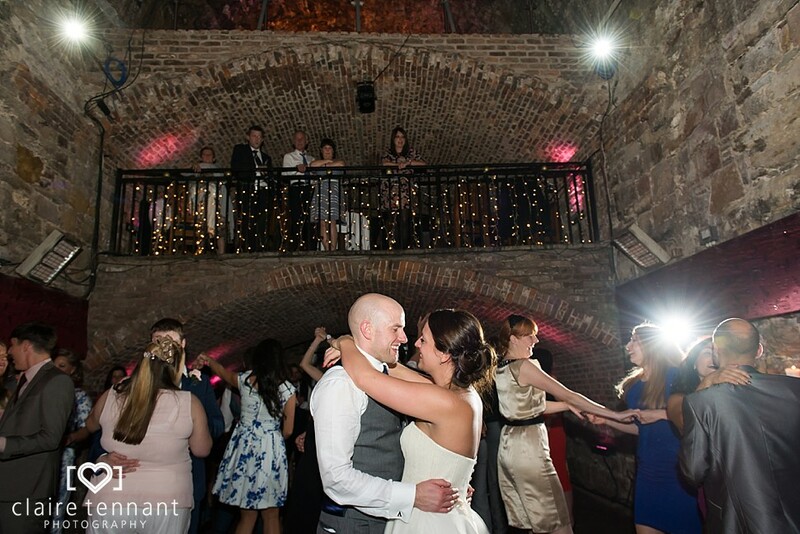 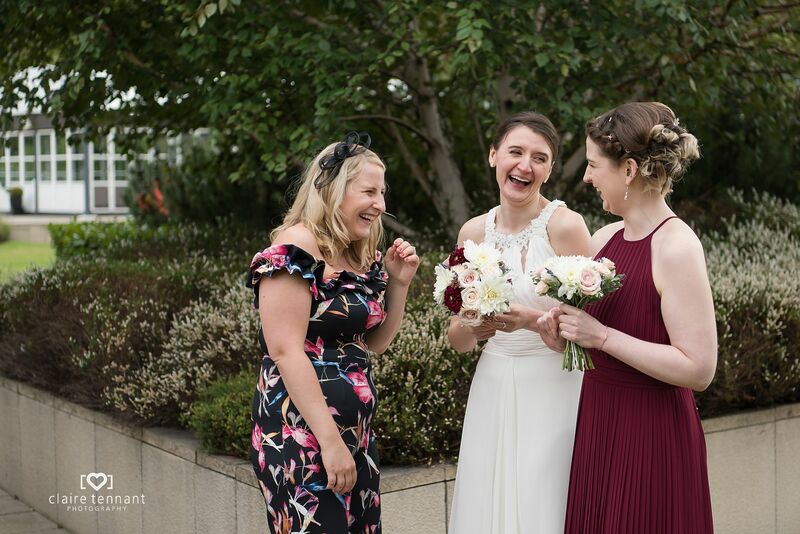 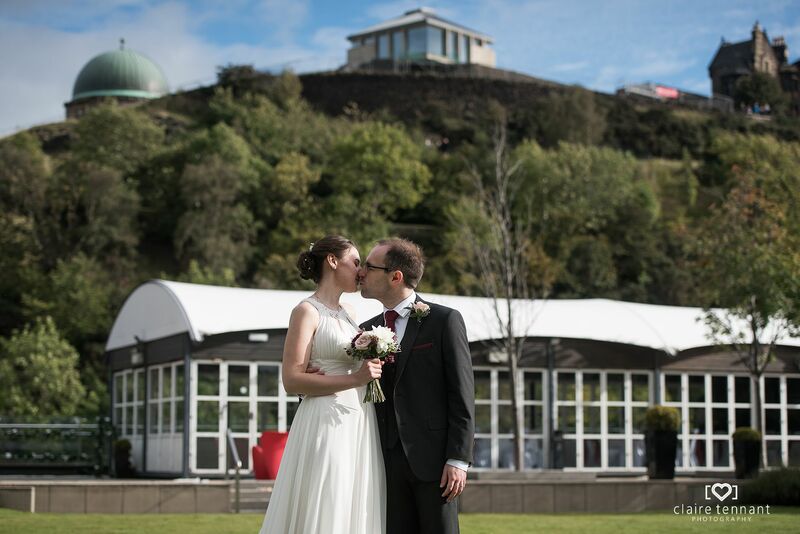 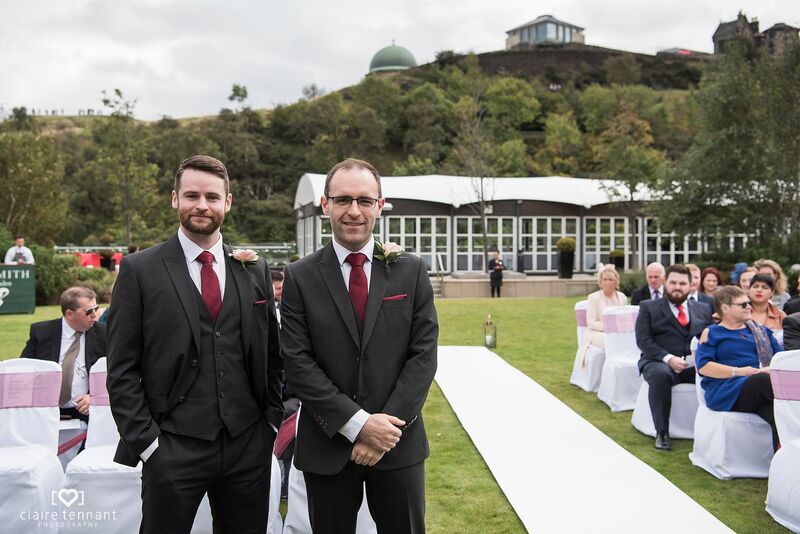 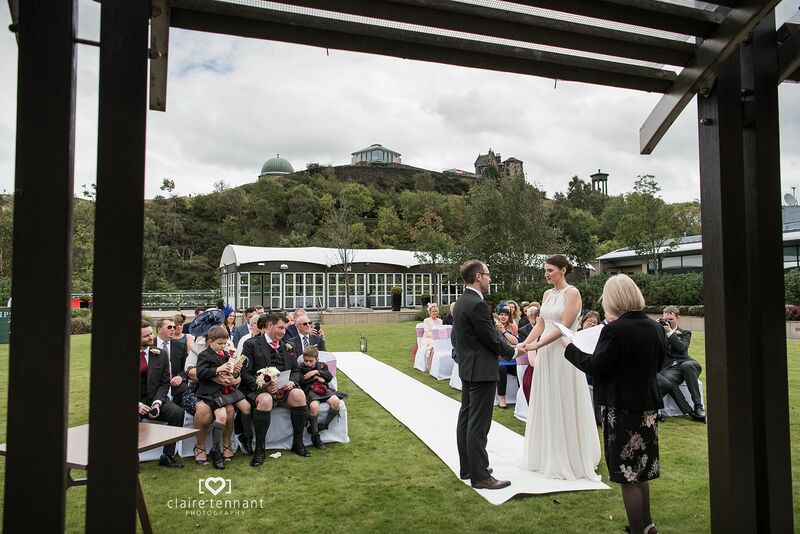 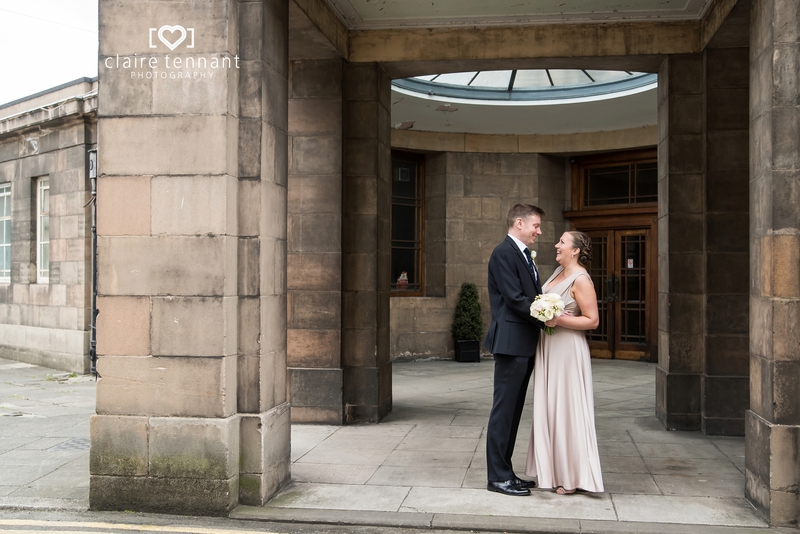 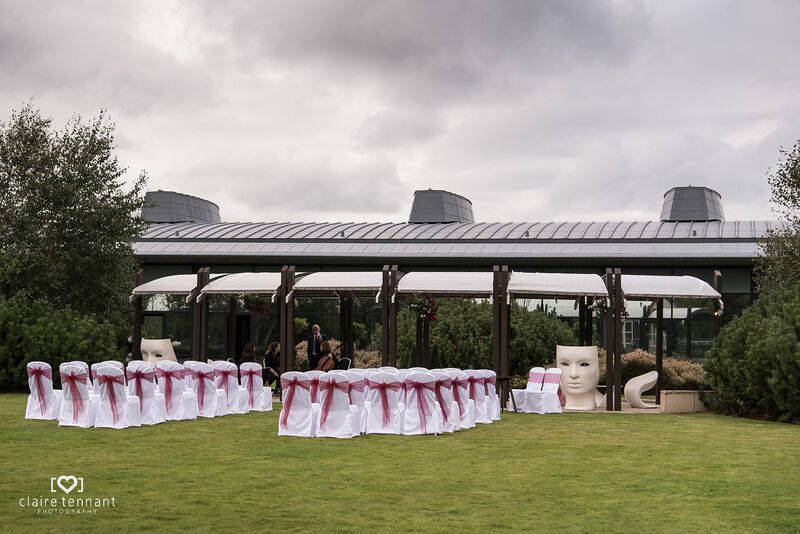 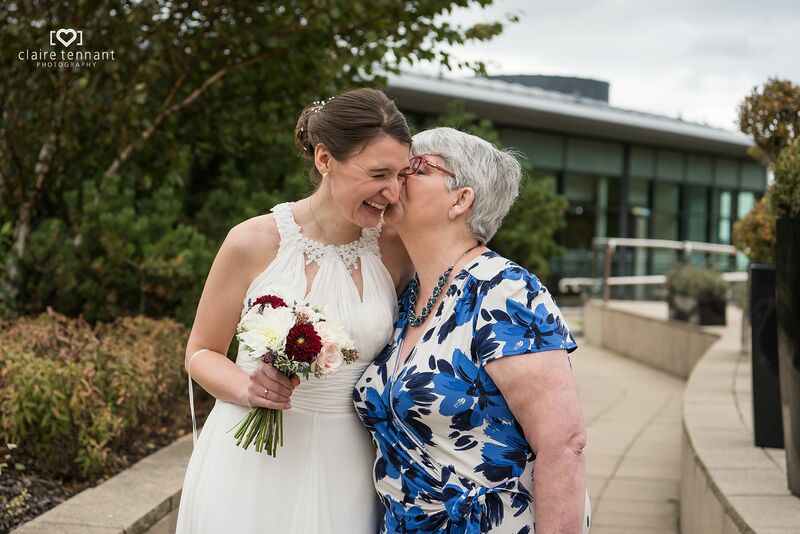 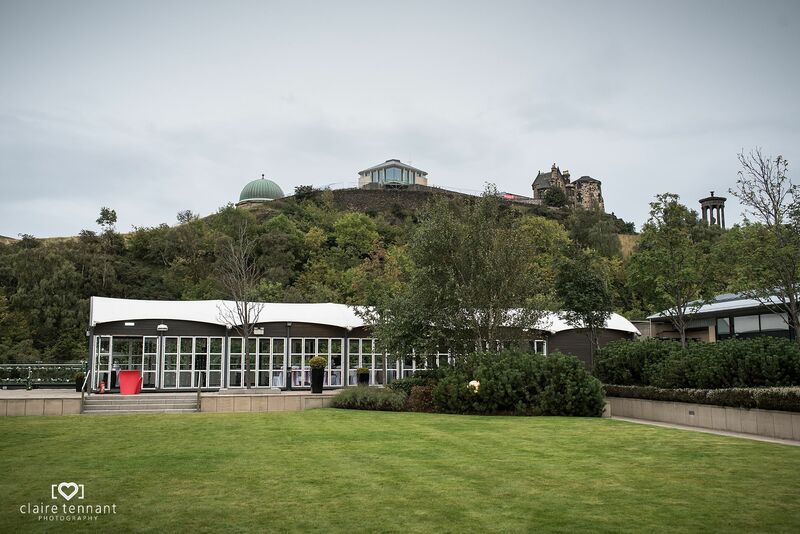 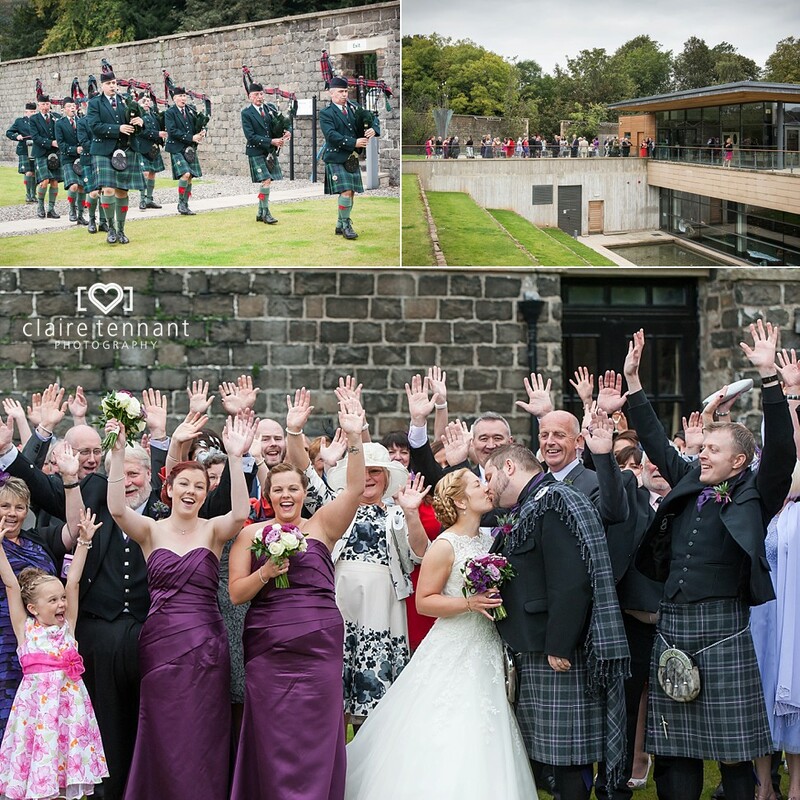 The Glasshouse is such a lovely, modern venue and although it’s in the heart of Edinburgh it almost feels like you’re away from it all with lots of greenery on the terrace and the beautiful backdrop of Calton hill. 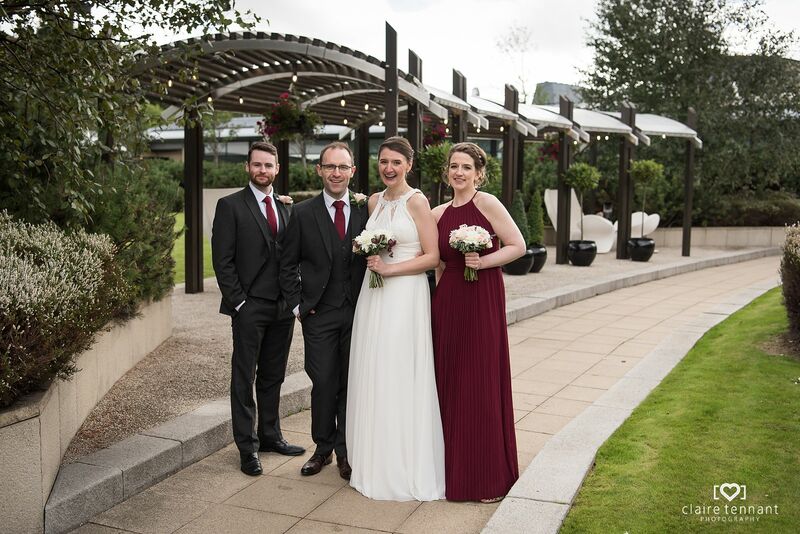 With Claire and Sean’s wedding being in mid-September I don’t think any of us really expected to be able to hold the ceremony outside. 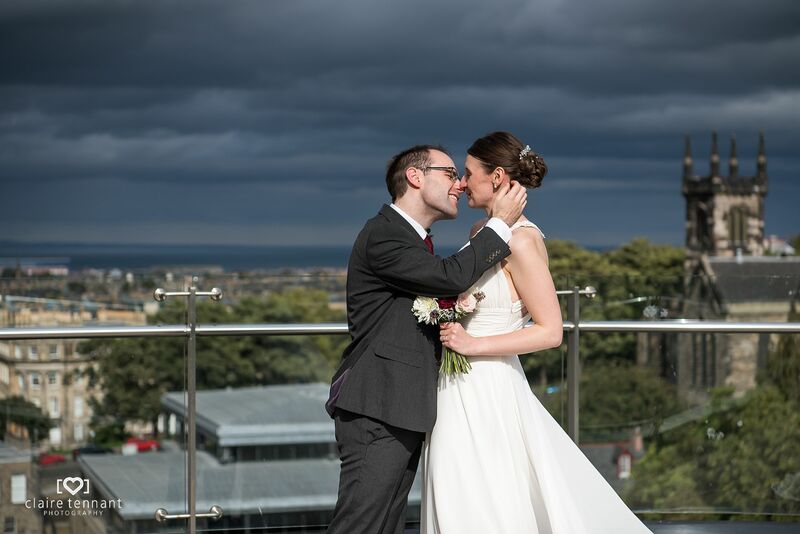 They were really lucky that on the day it was mild for the time of year. 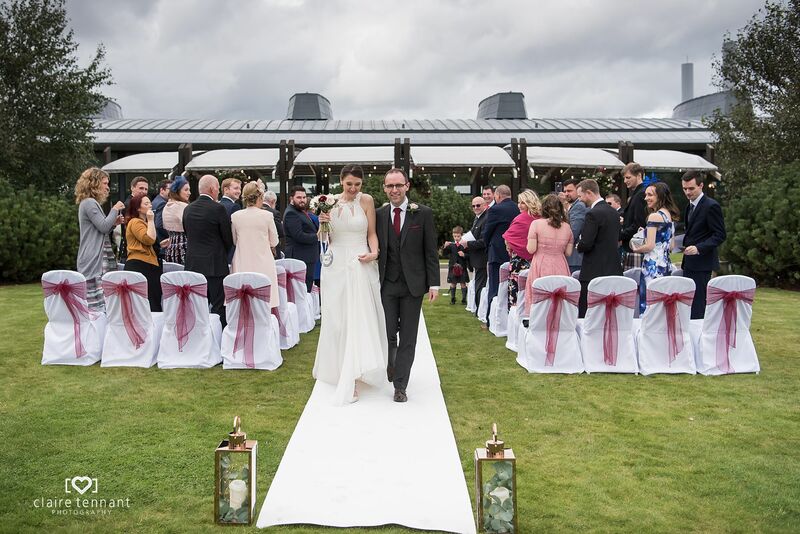 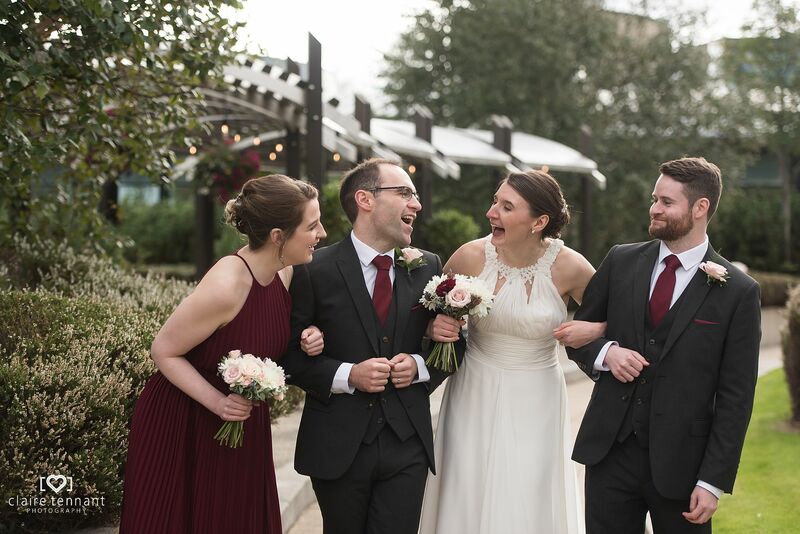 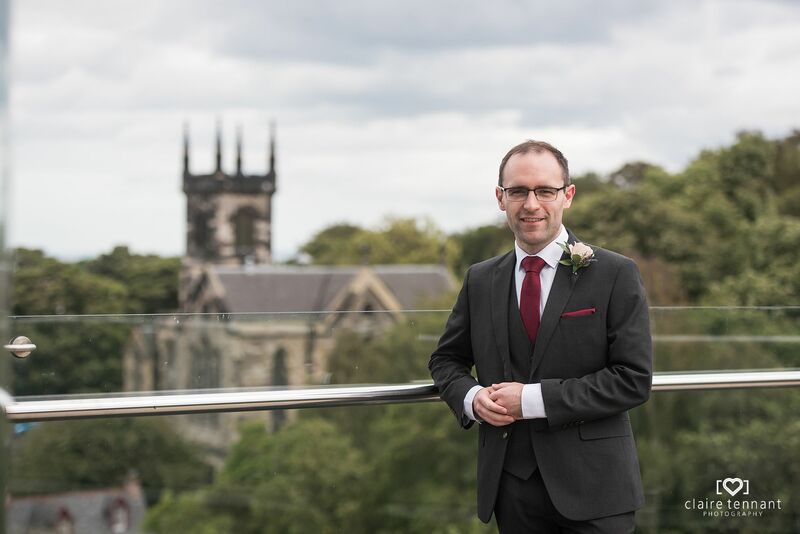 The prospect of an outdoor ceremony made me a very happy photographer as the terrace is a stunning ceremony setting and I always feel being outdoors adds to the atmosphere. 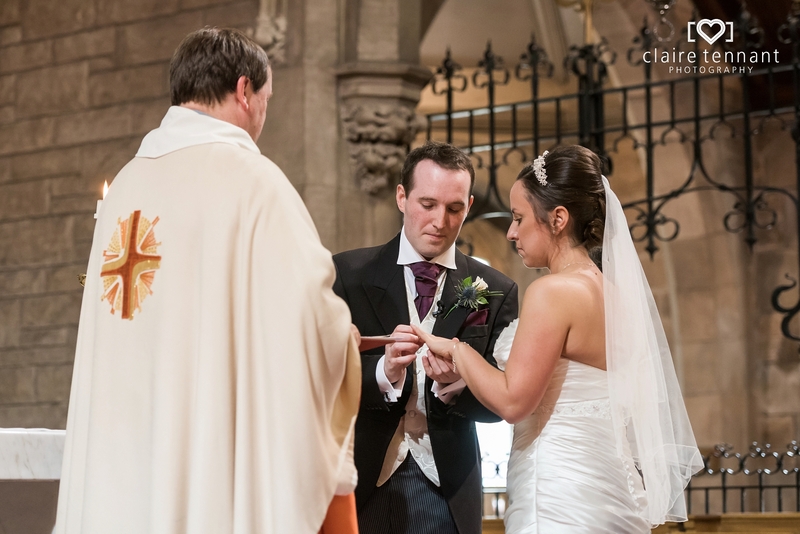 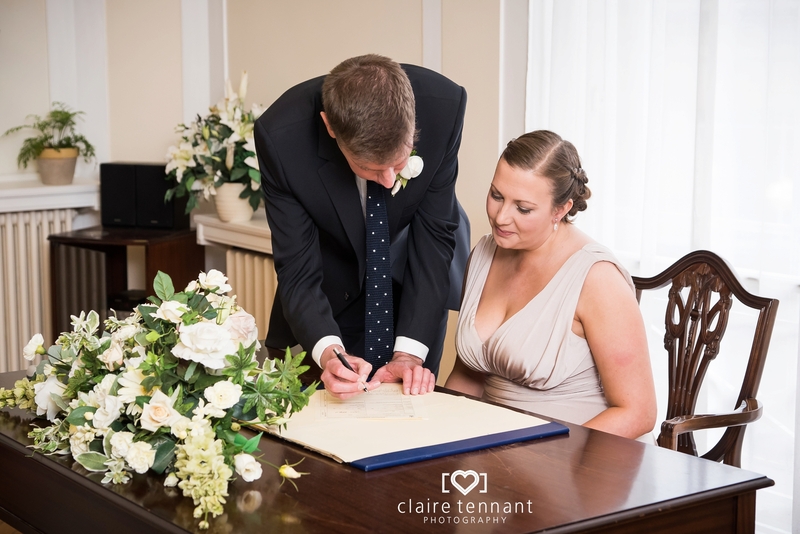 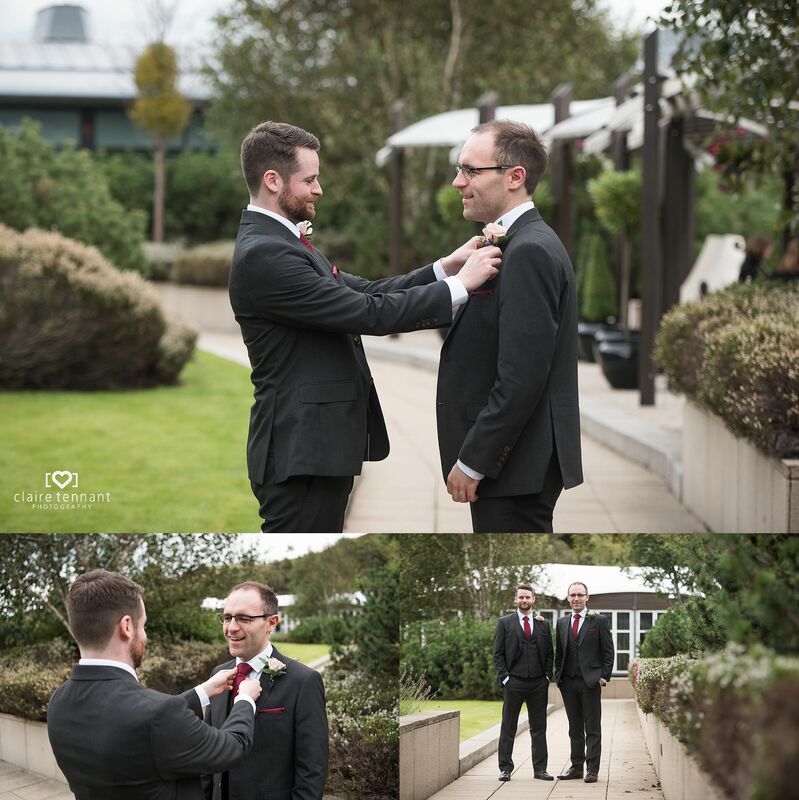 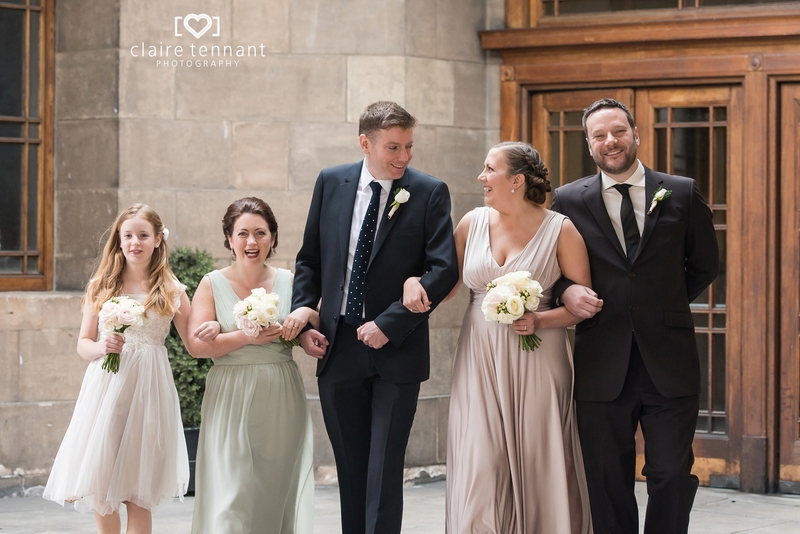 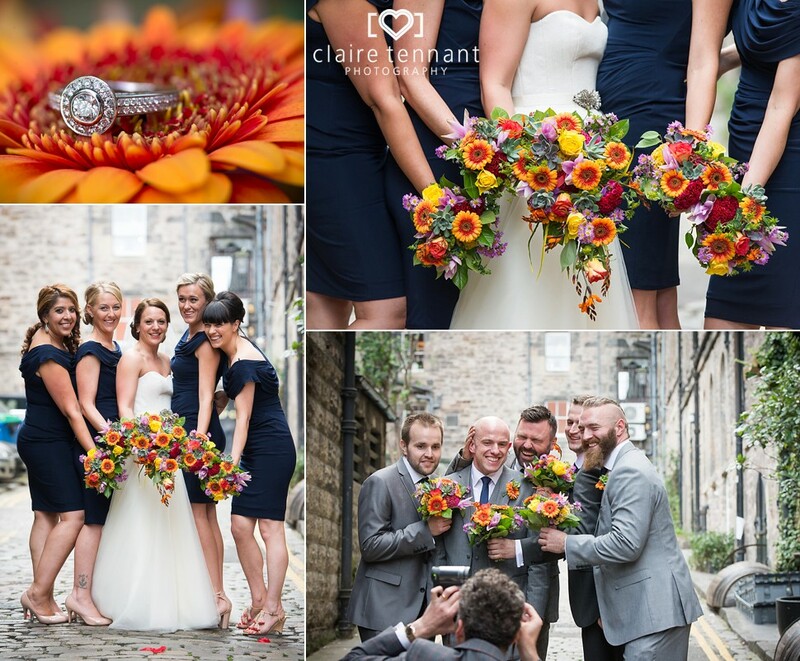 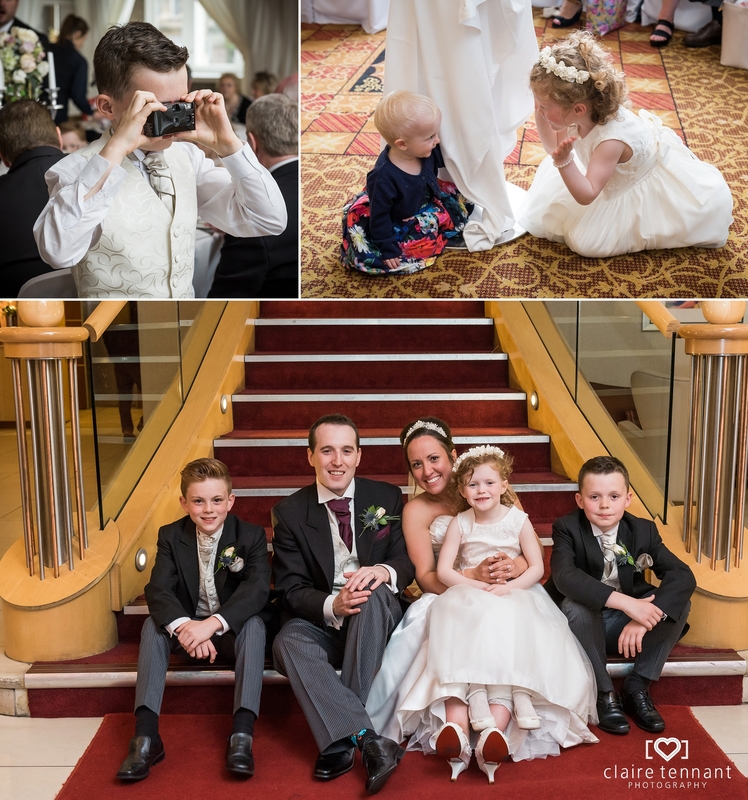 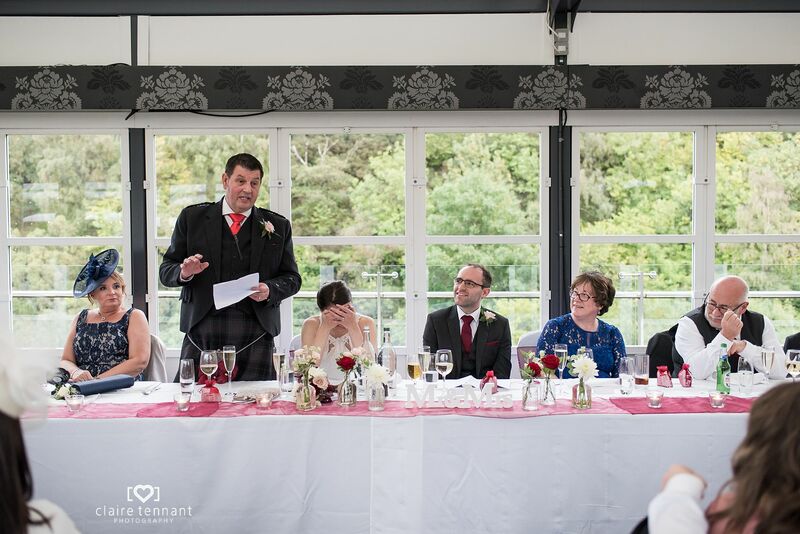 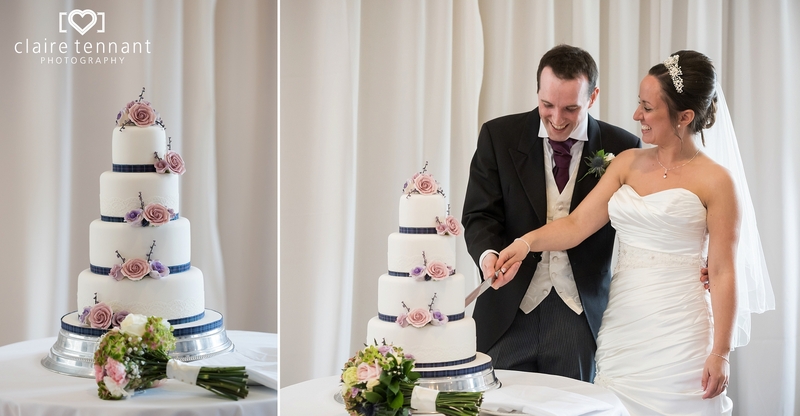 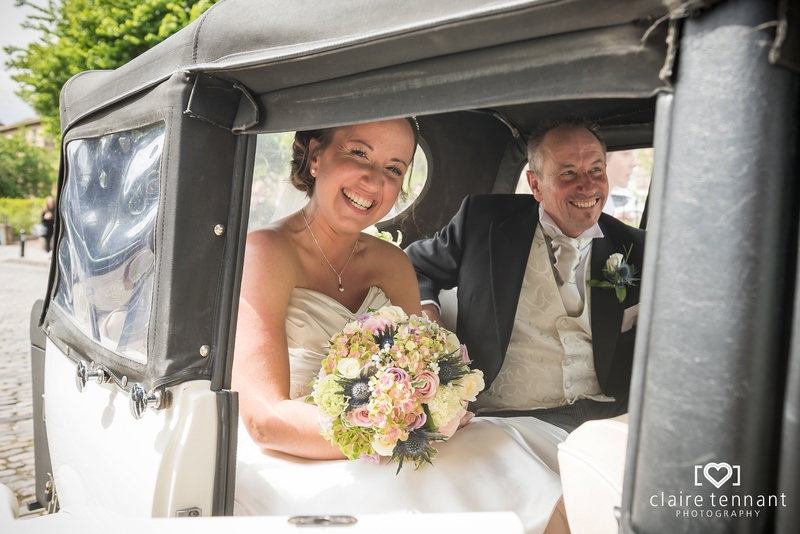 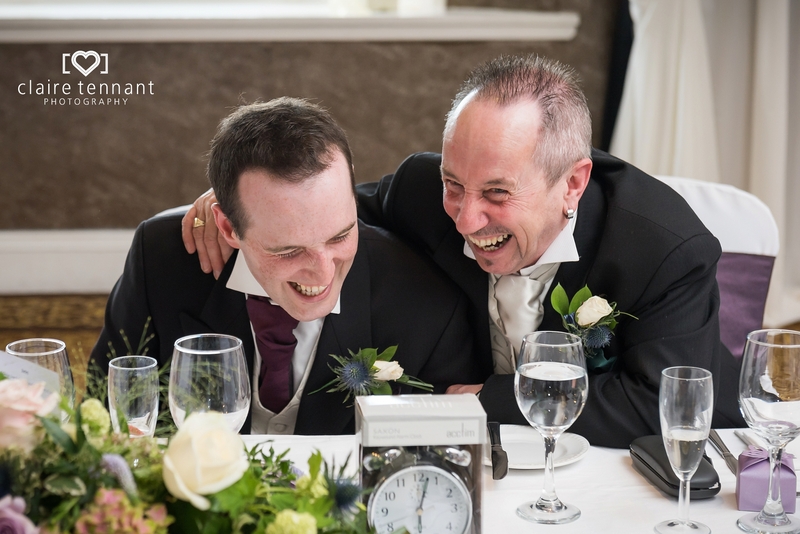 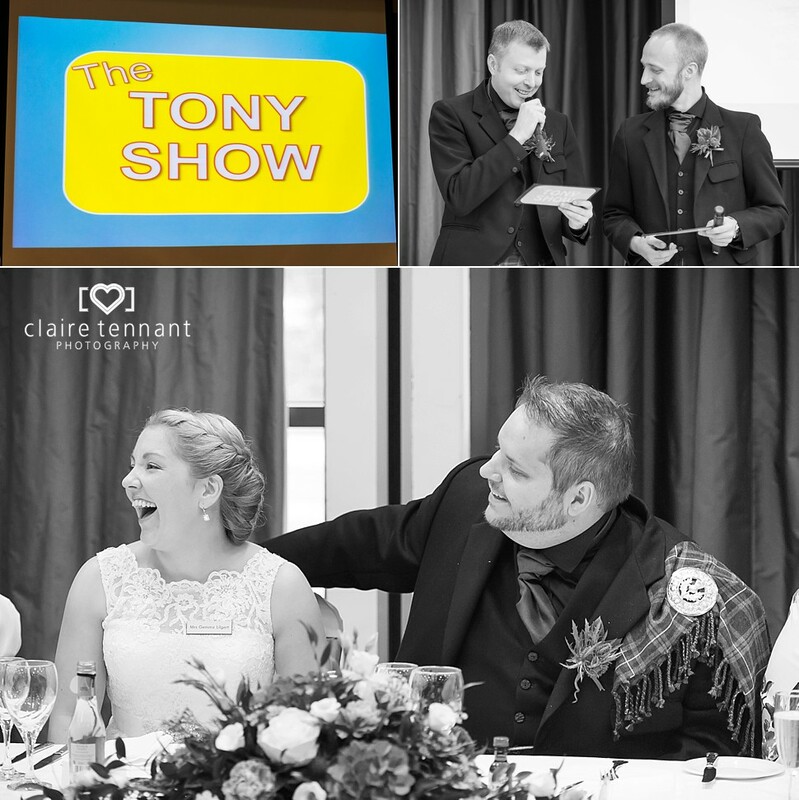 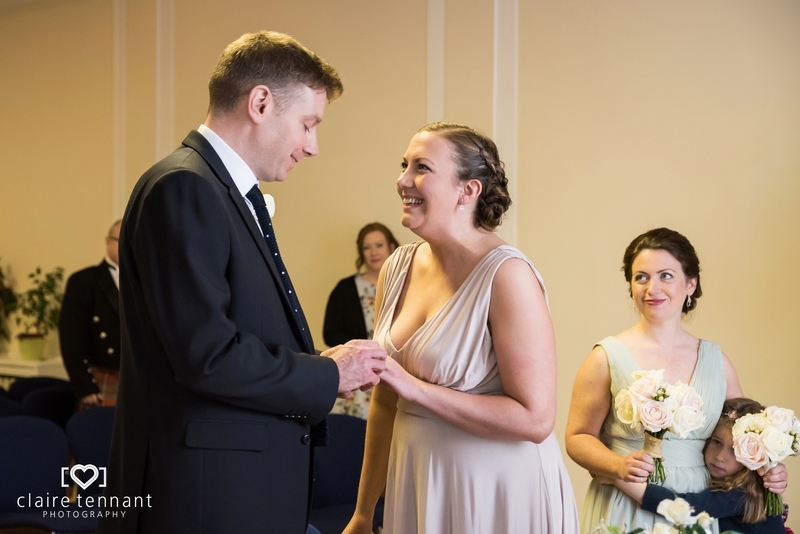 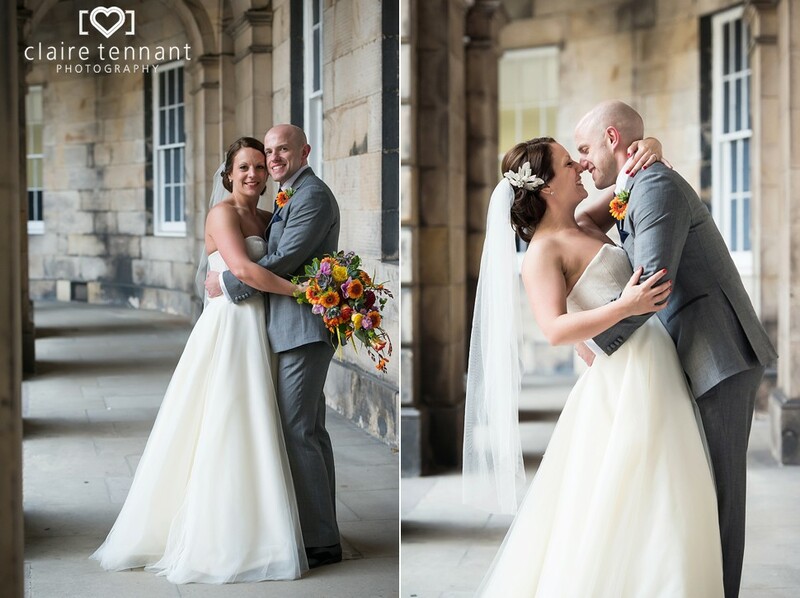 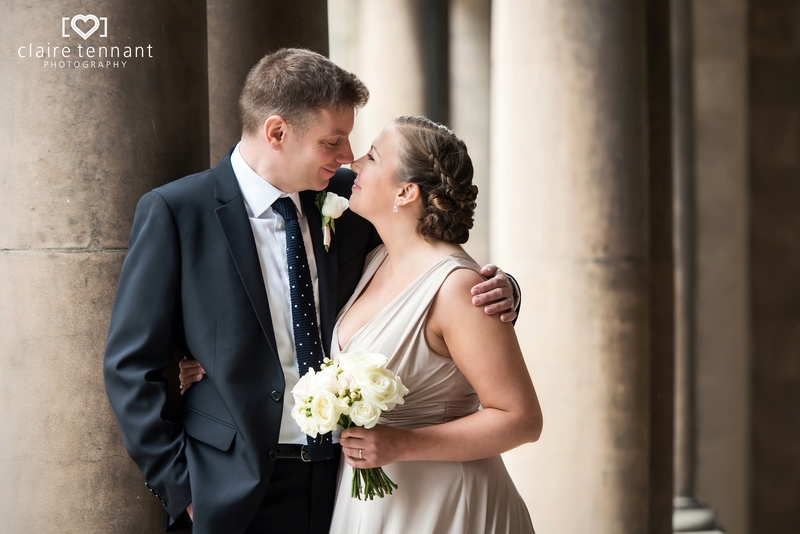 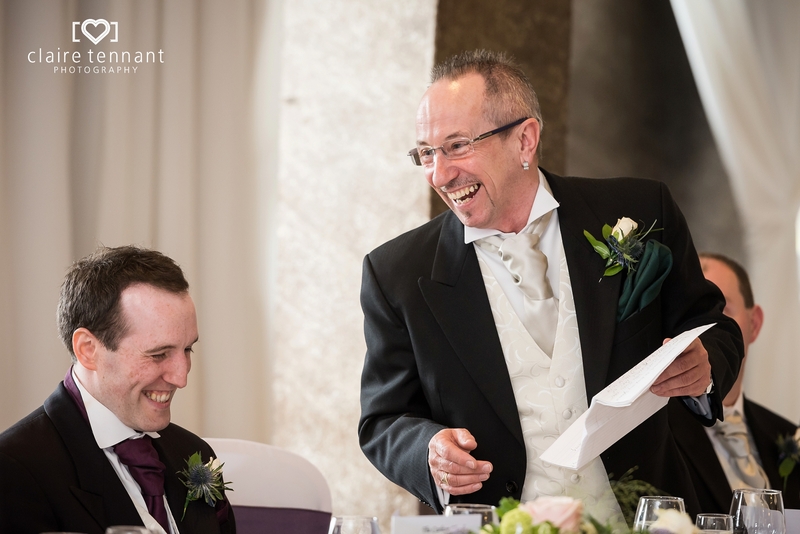 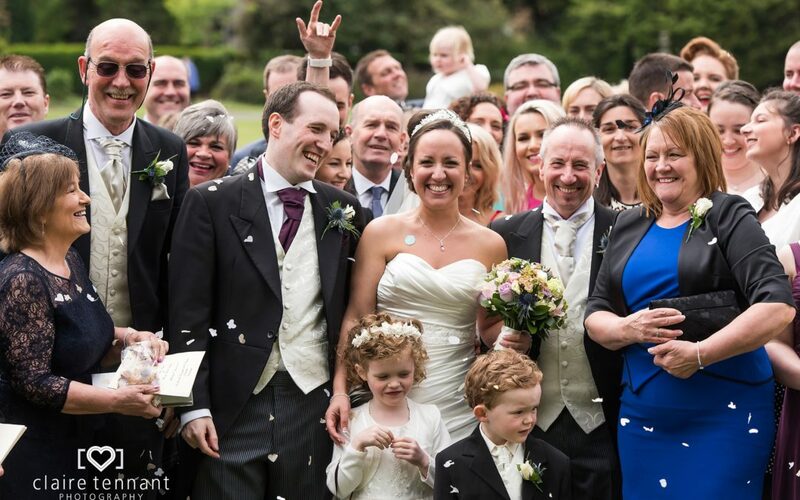 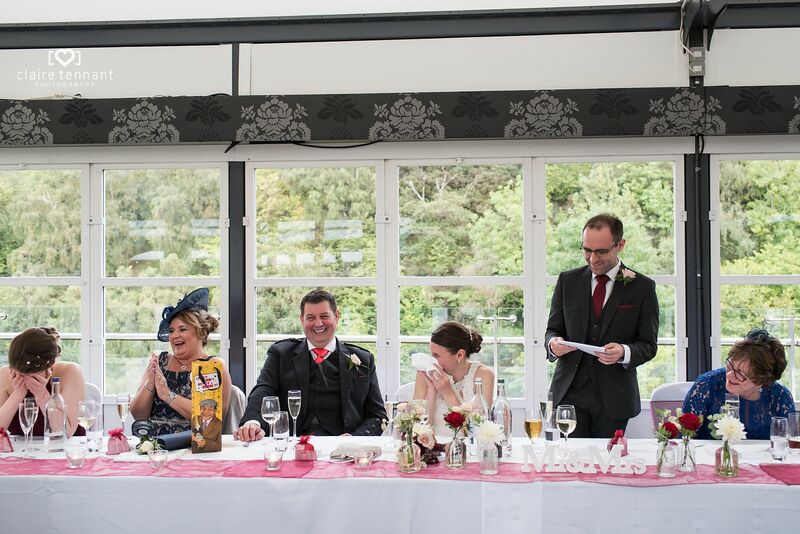 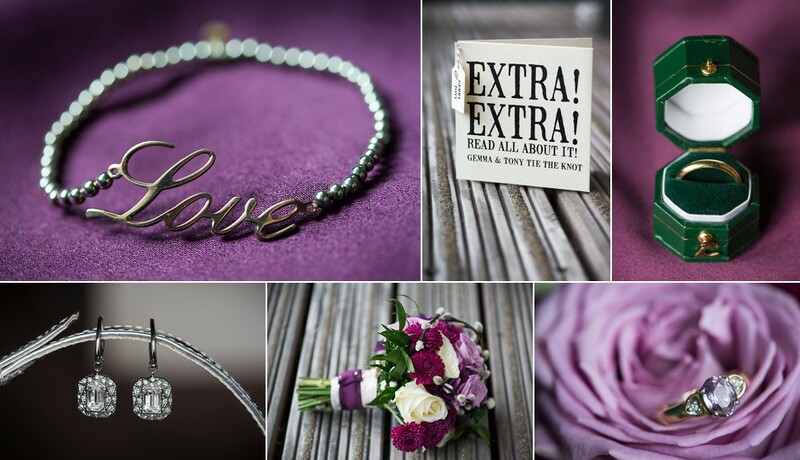 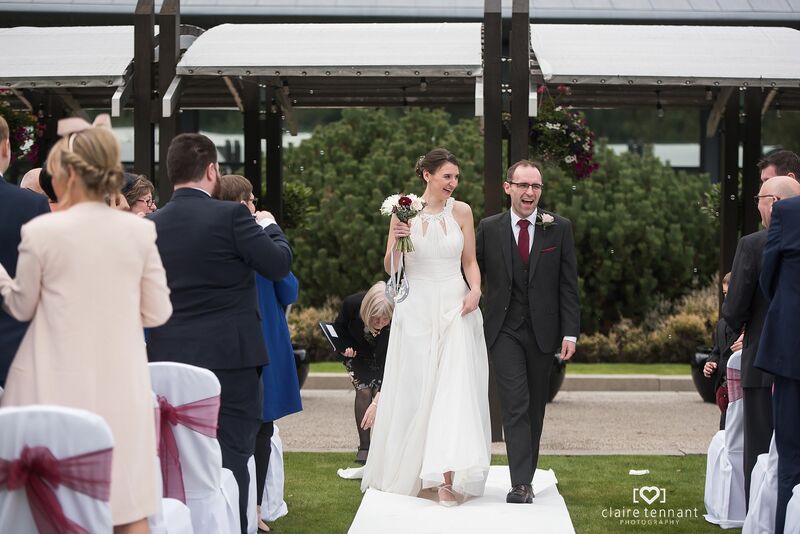 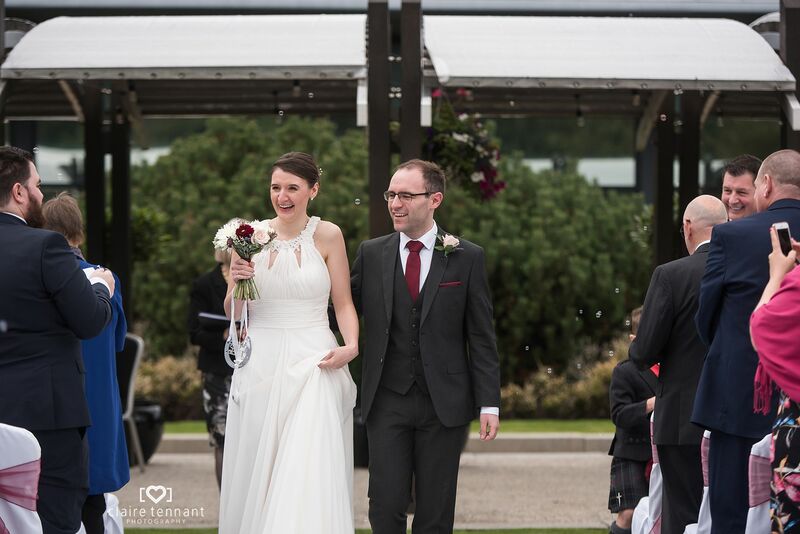 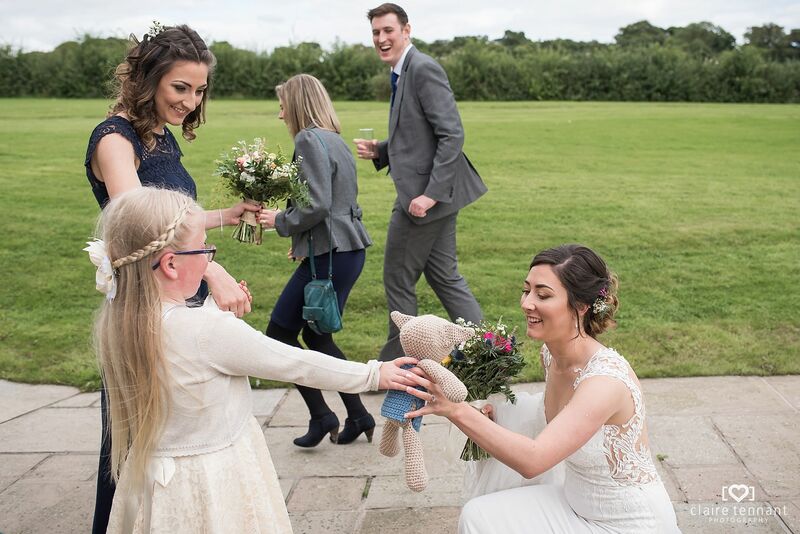 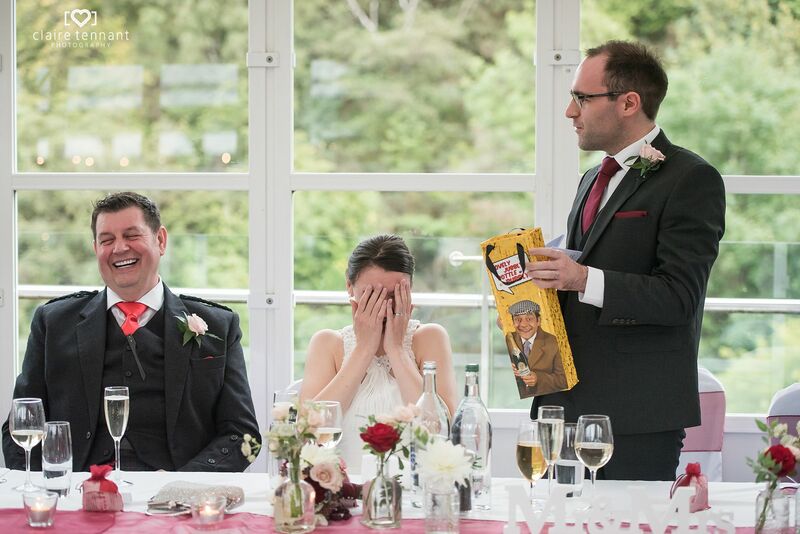 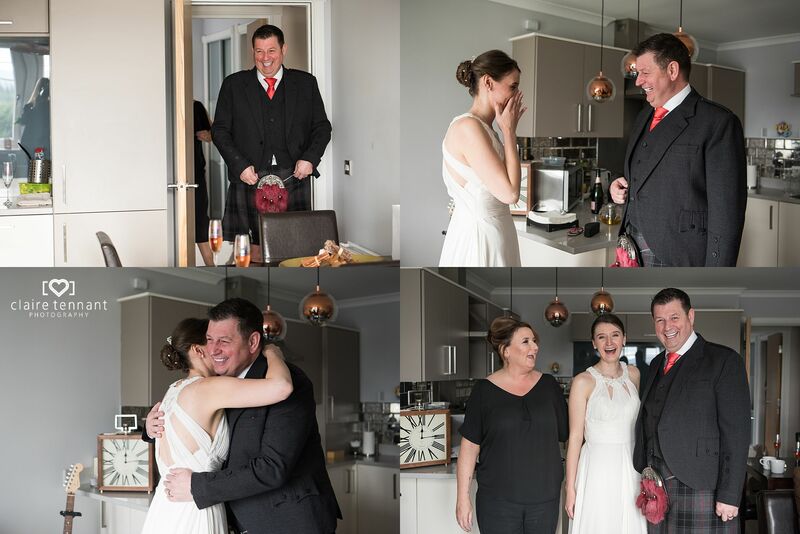 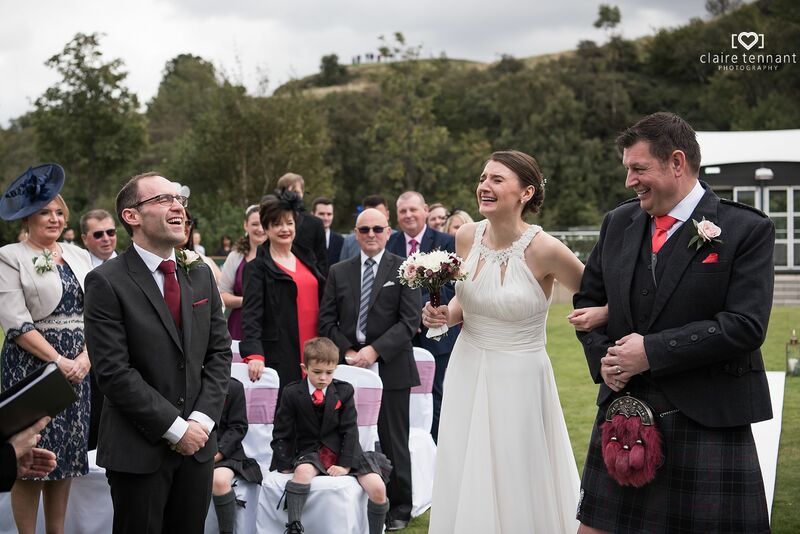 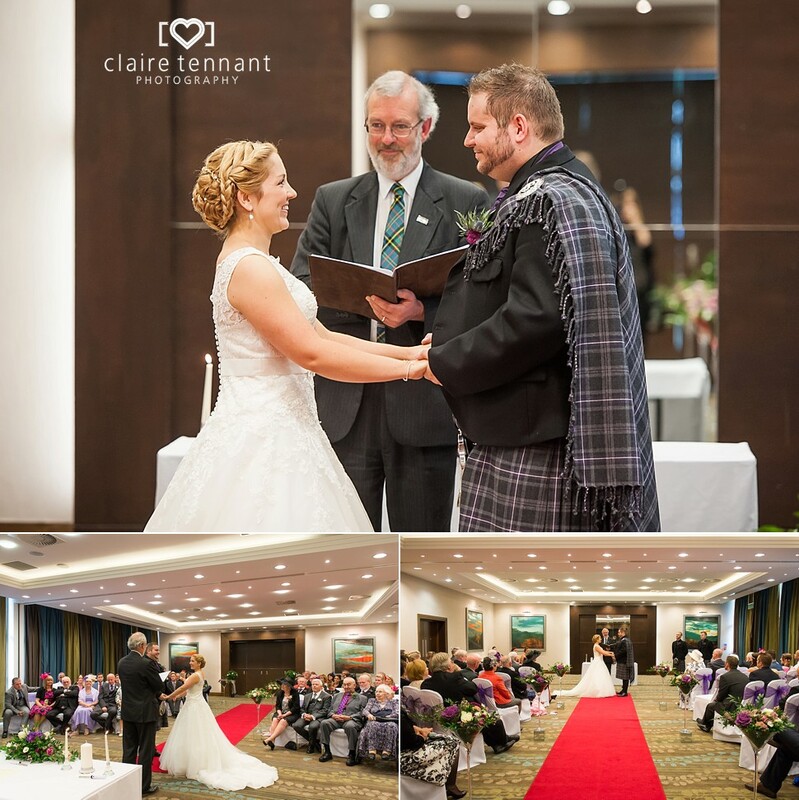 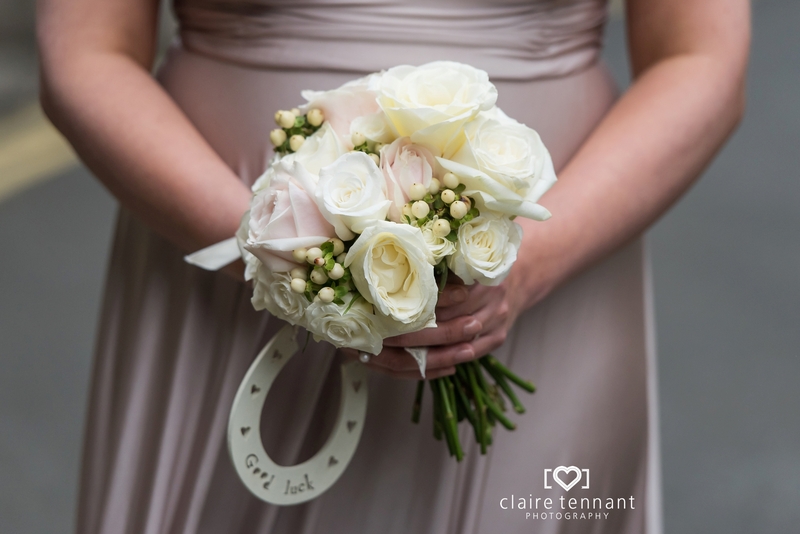 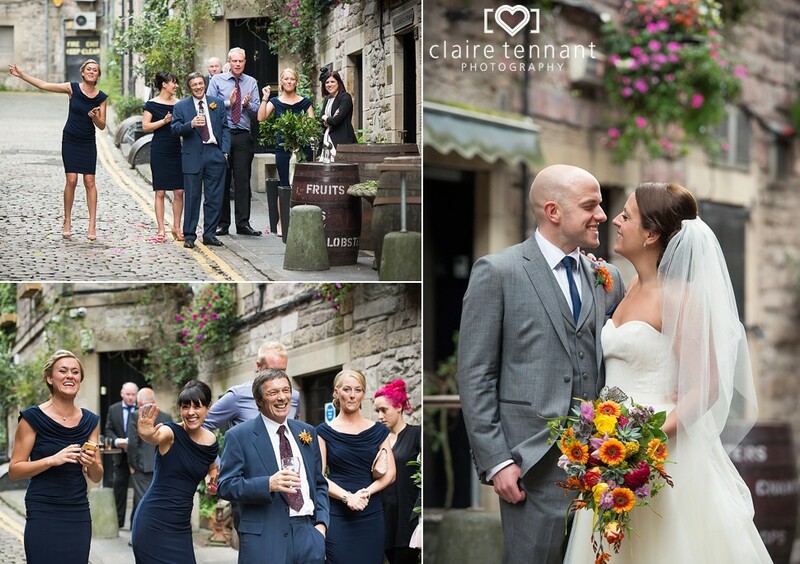 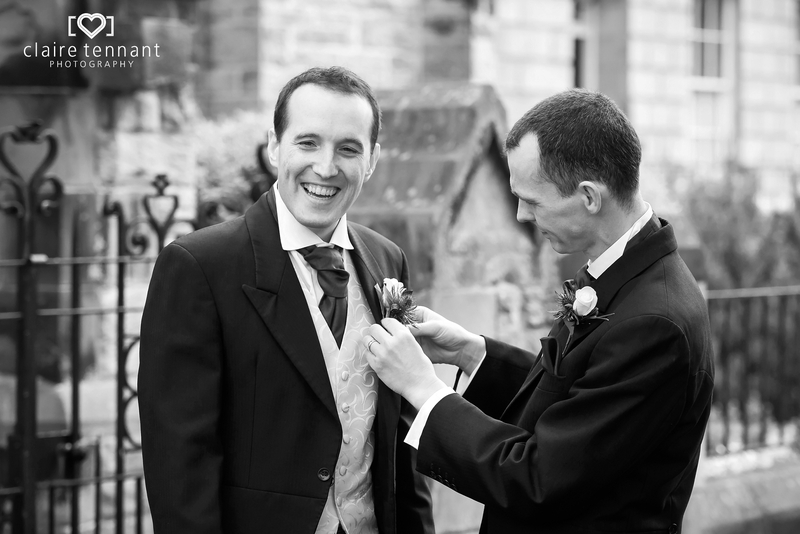 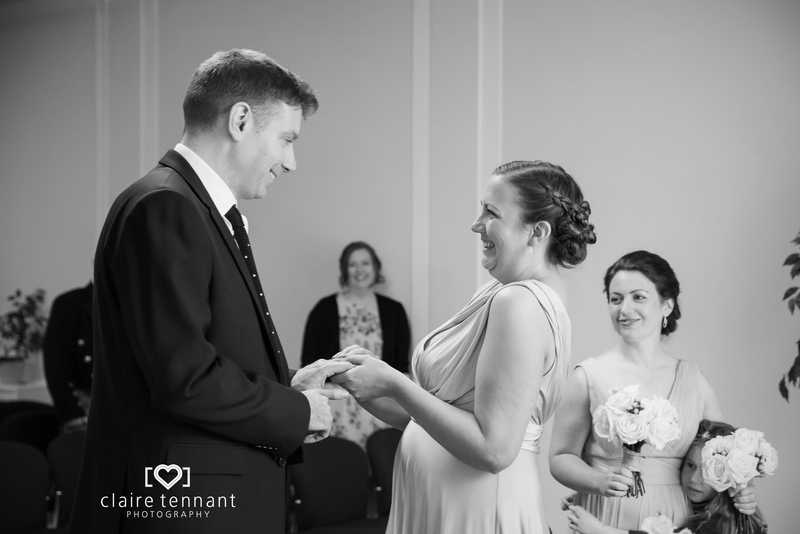 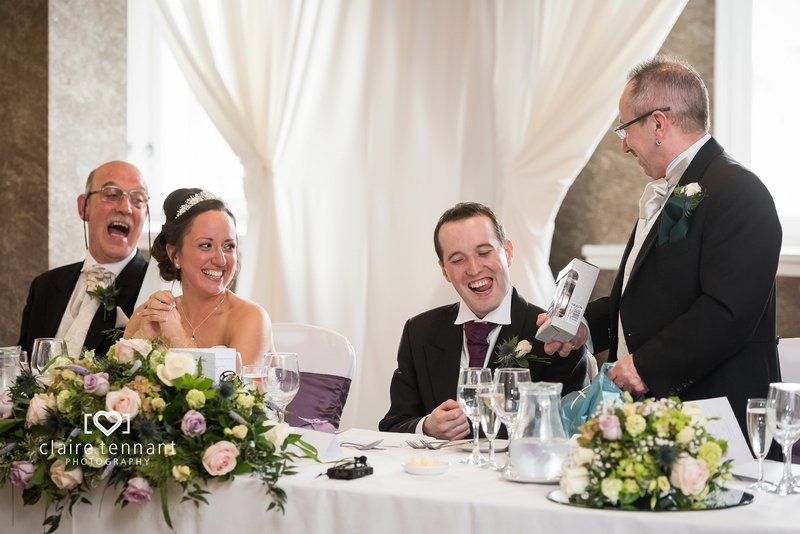 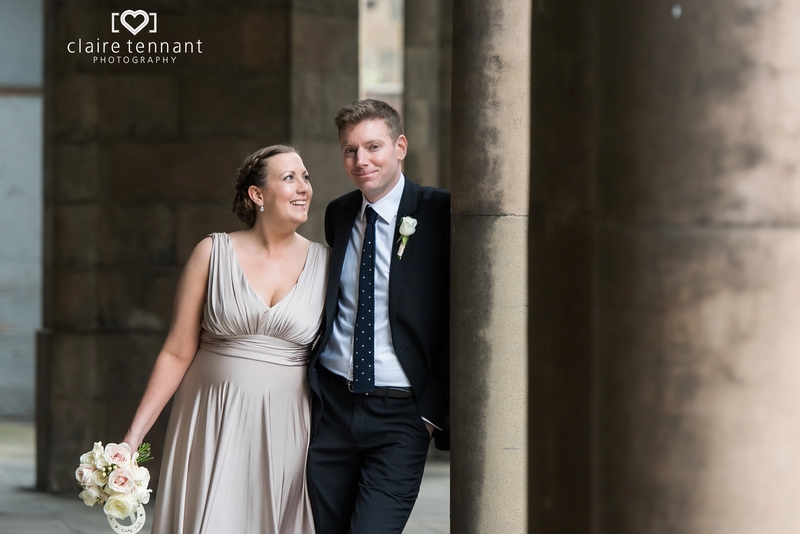 Claire and Sean had a lovely personalised Civil Ceremony full of laughter and emotion. 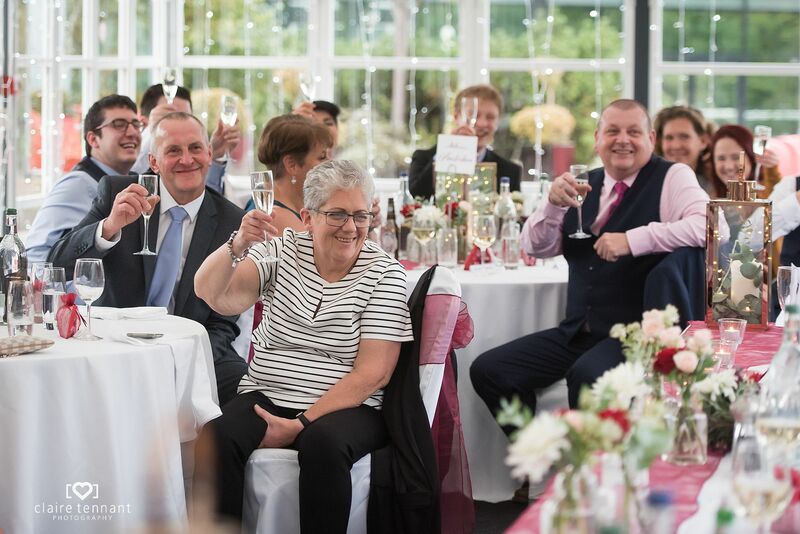 Soon it was time for the official group photos and the guests enjoyed relaxing with a celebratory drink in hand and lovely background music by Arta String Quartet in the background. 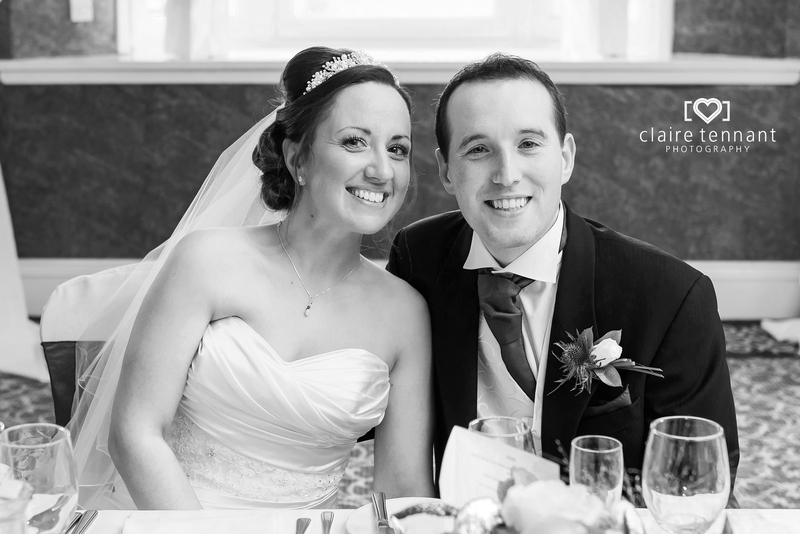 Claire and Sean were so friendly on the run up to the day that I knew I was going to have a great time with them. 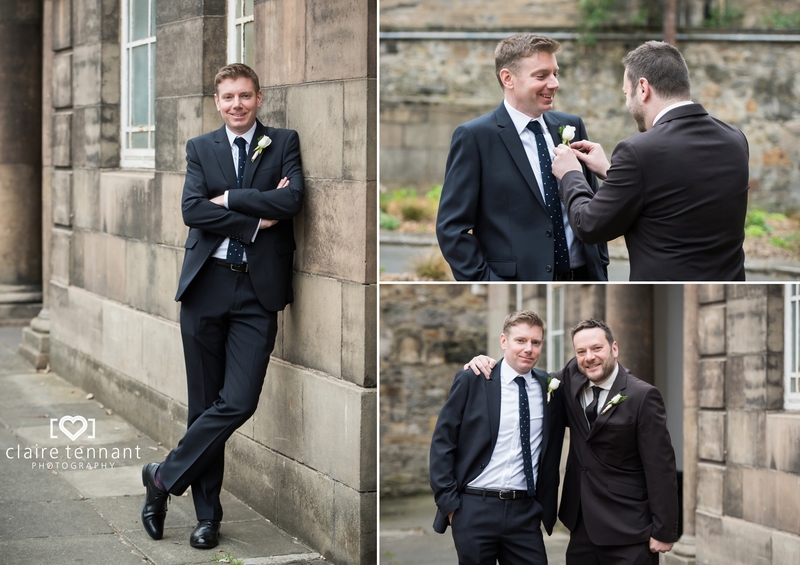 The wedding day itself was relaxed with lots of fun, candid moments to capture. 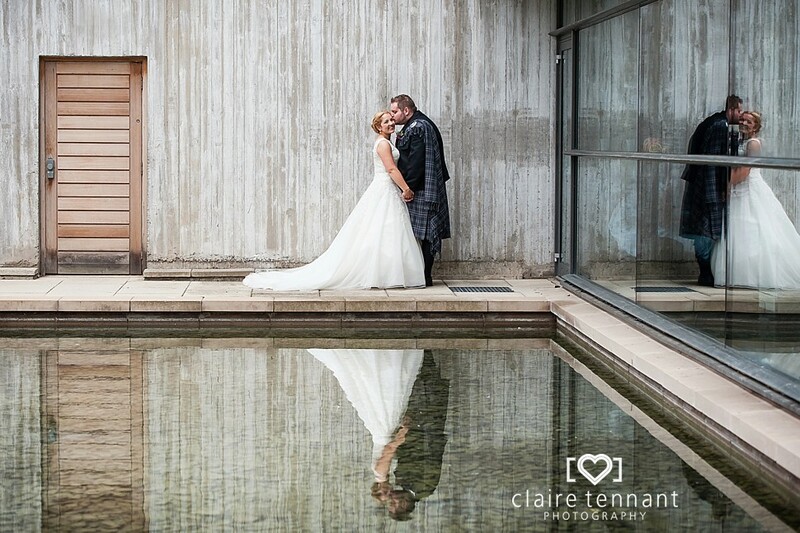 There are so many great spots on the terrace and inside for photos that it’s easy to capture an excellent variety of photos. 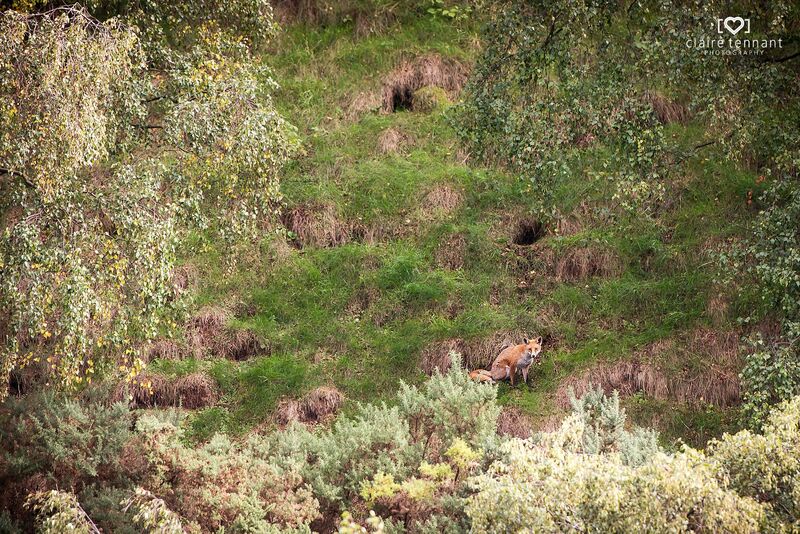 As I was taking the romantic couple photos we spotted some local wildlife…foxes on Calton Hill (see the photo below)! 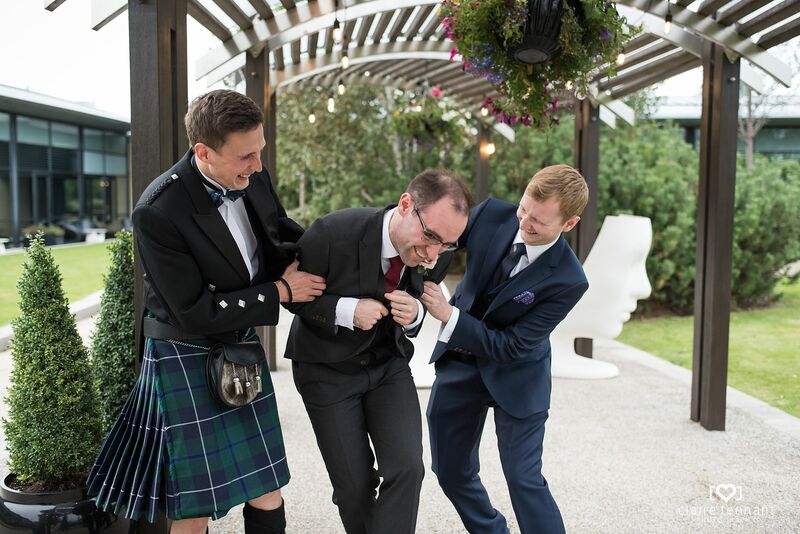 That was a first for me! 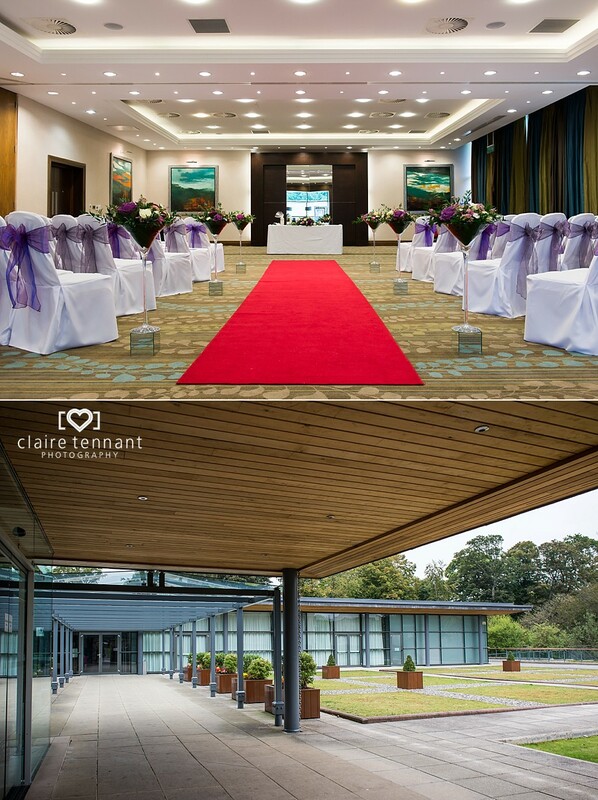 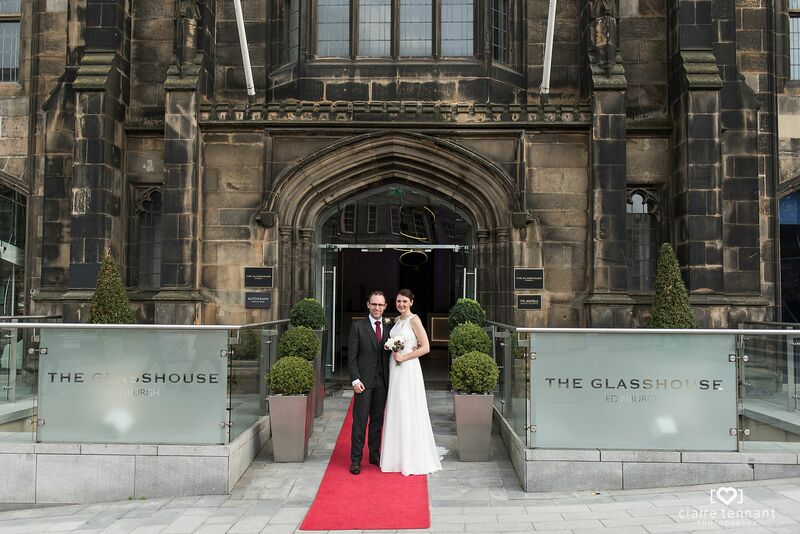 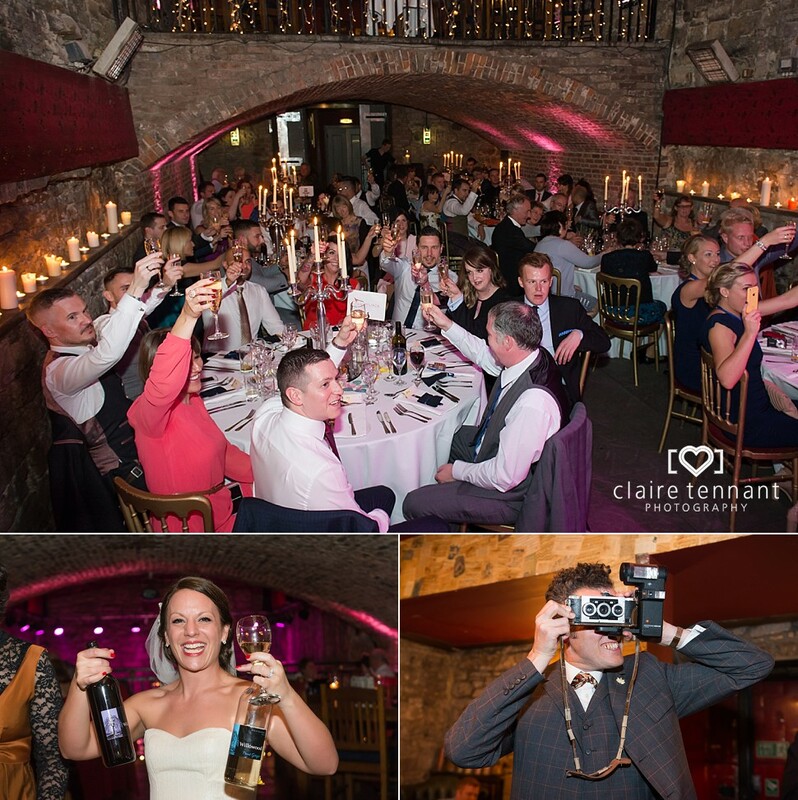 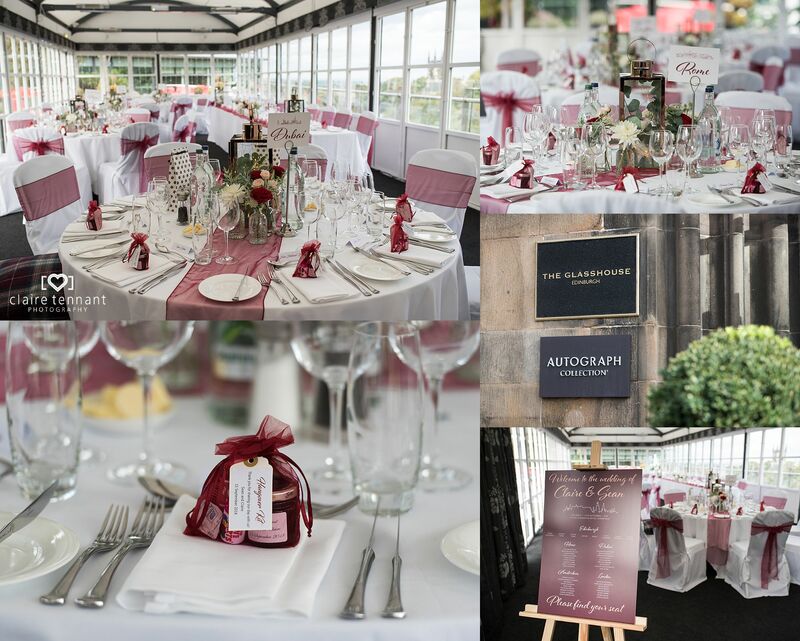 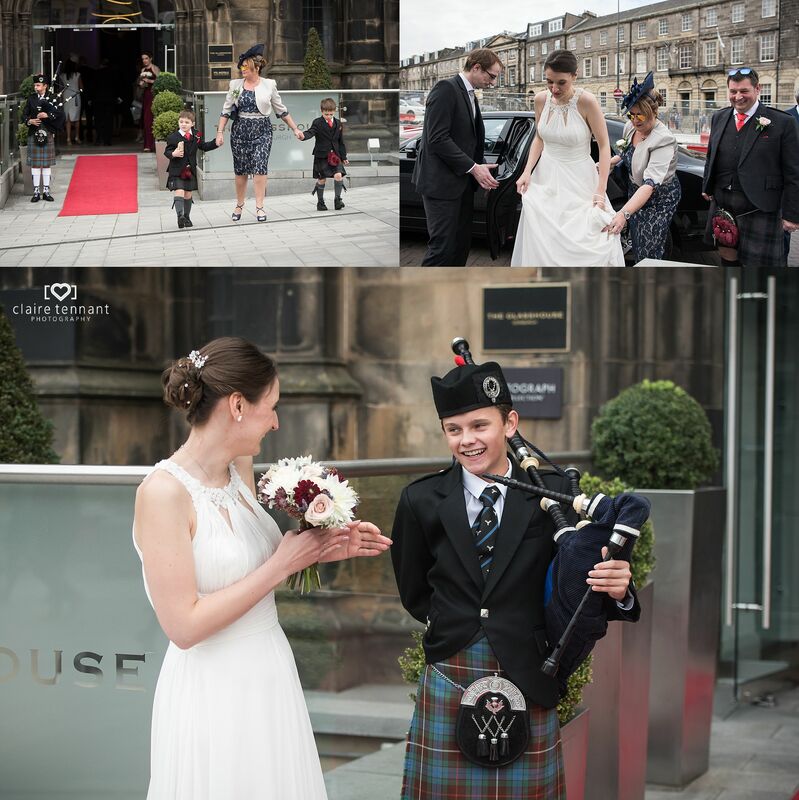 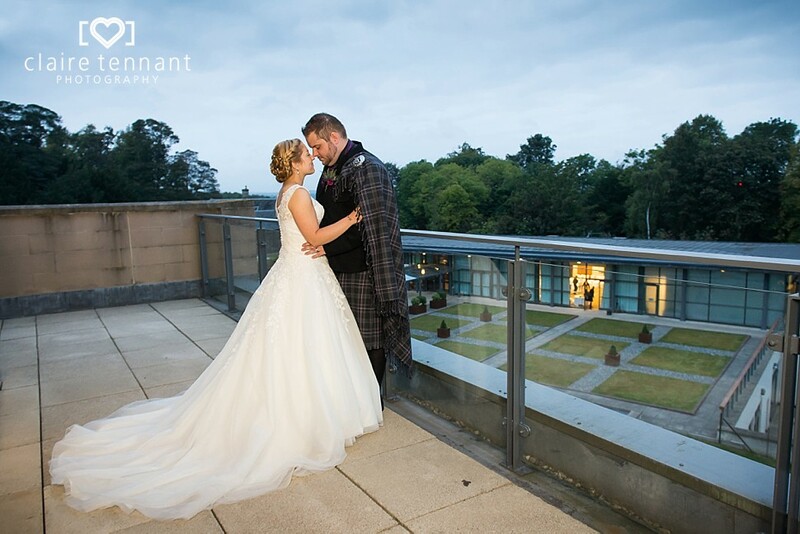 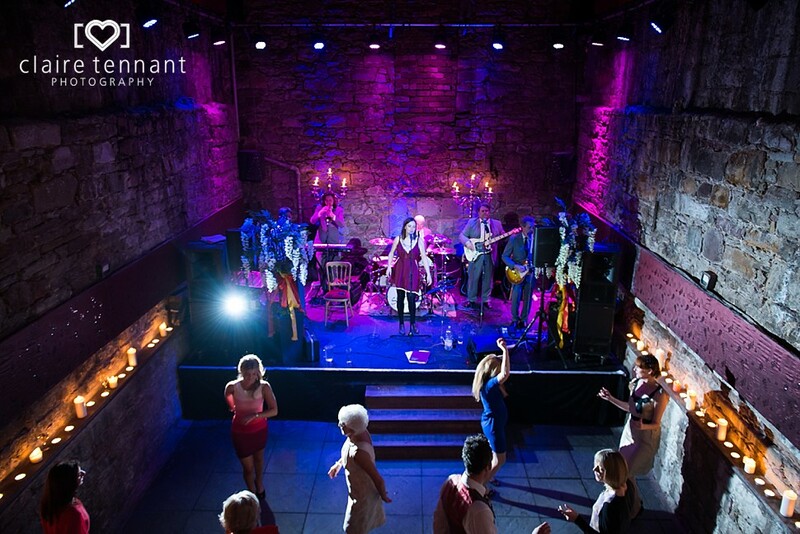 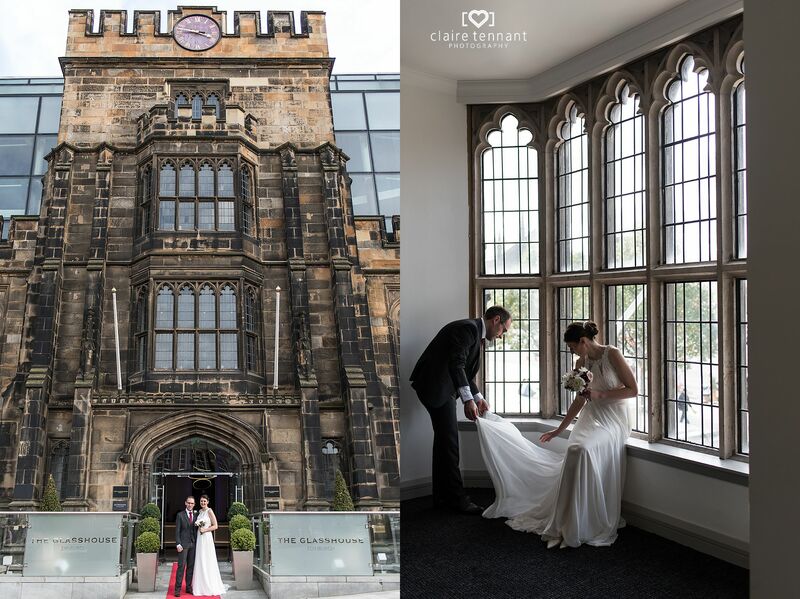 If you’re looking for ideas for a great honeymoon venue in Edinburgh, The Glasshouse would be perfect! 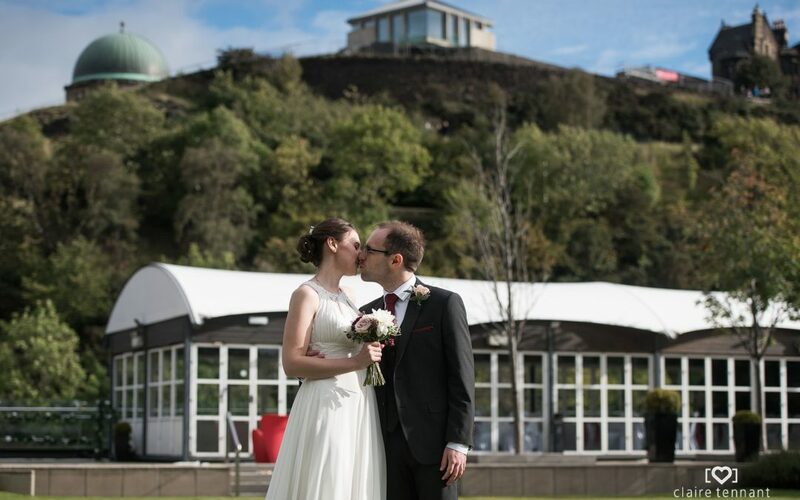 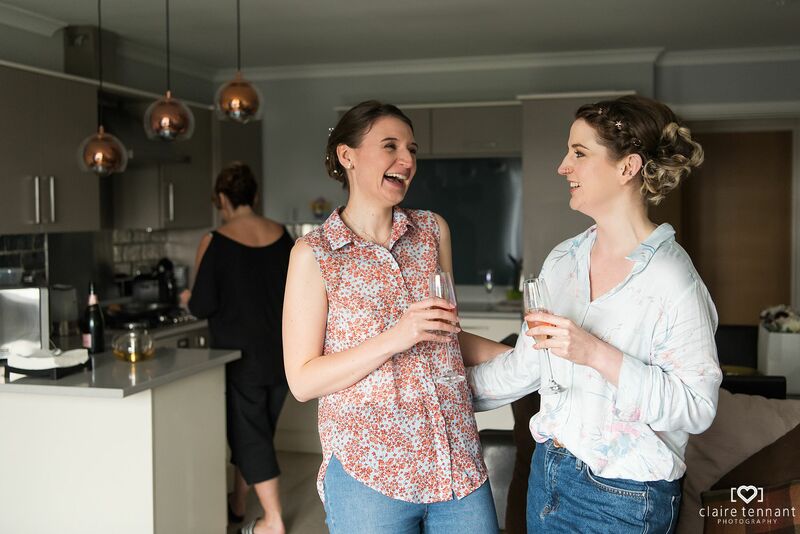 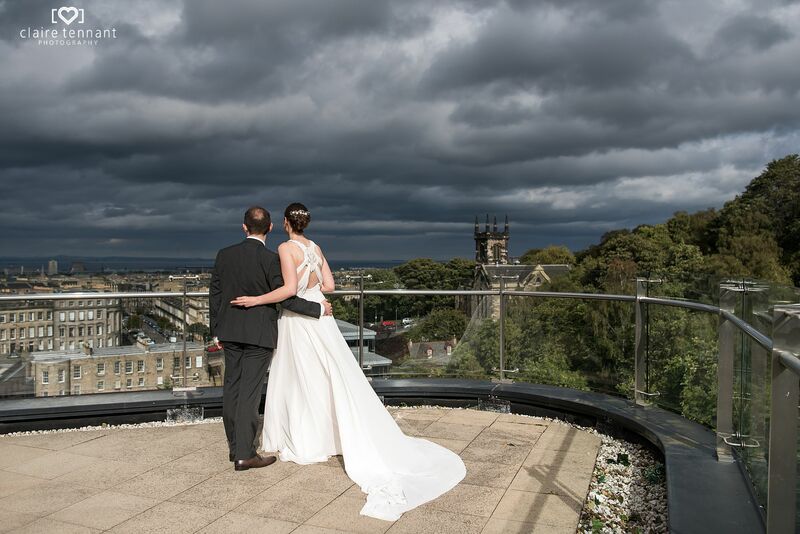 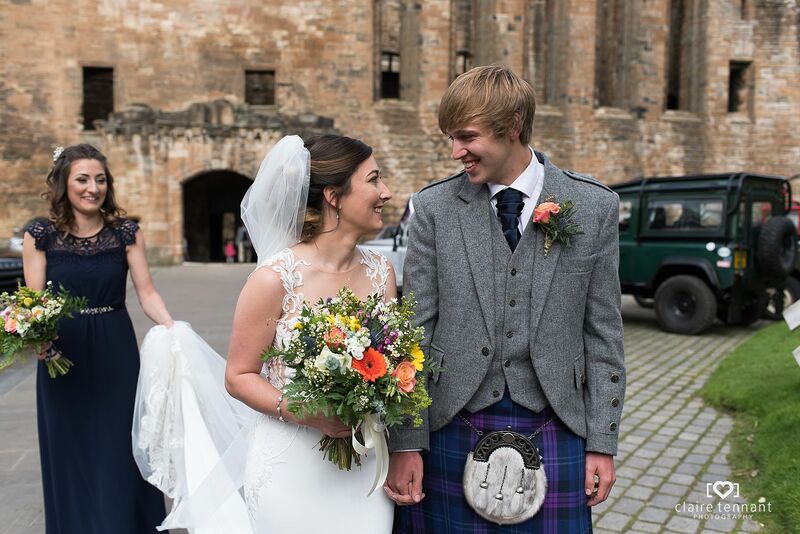 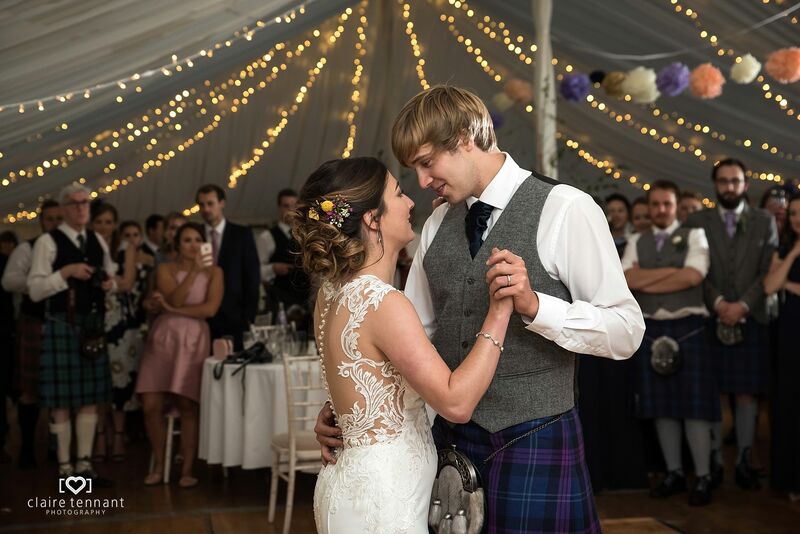 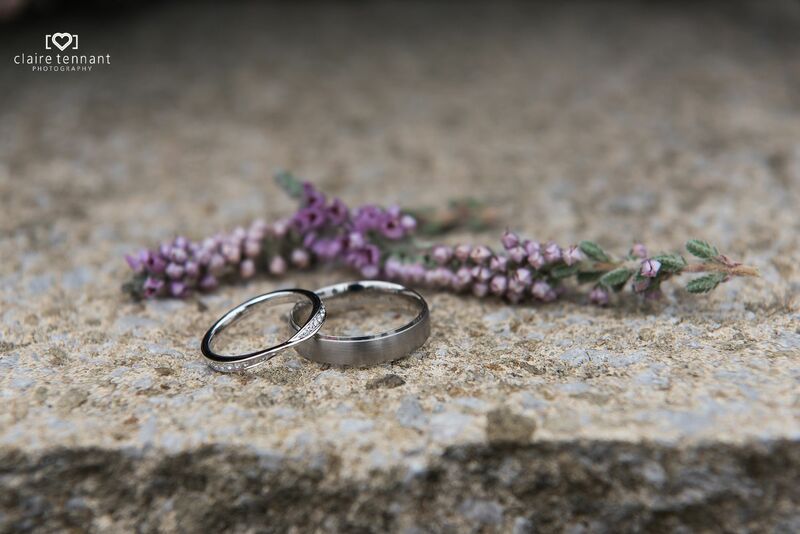 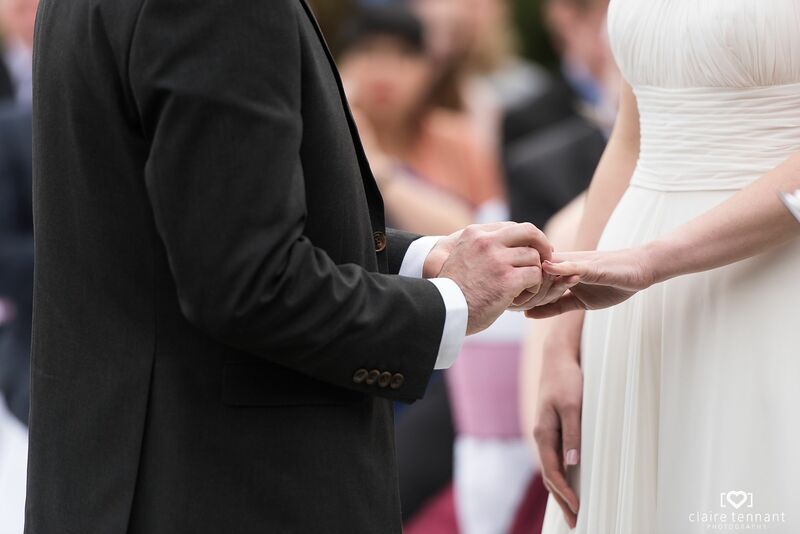 With it’s idyllic setting and picturesque views from it’s elevated position, it’s the perfect getaway for couples who’ve got married elsewhere in the UK and looking to enjoy everything Edinburgh has to offer. 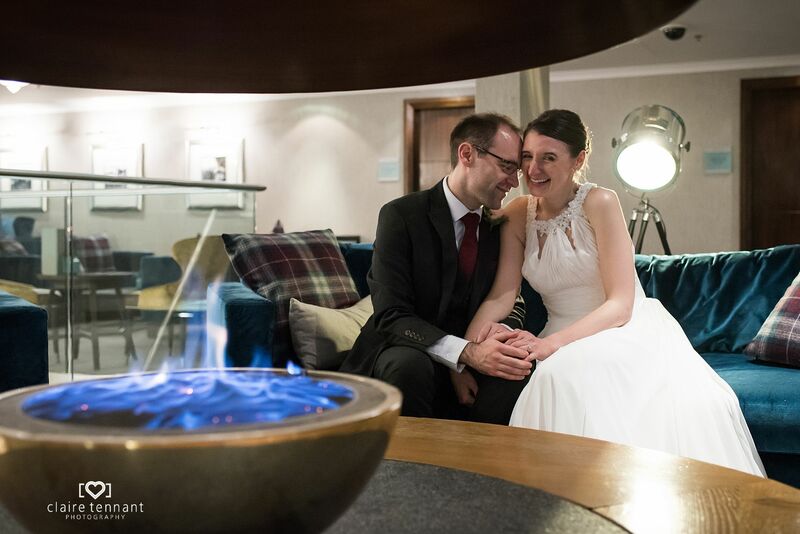 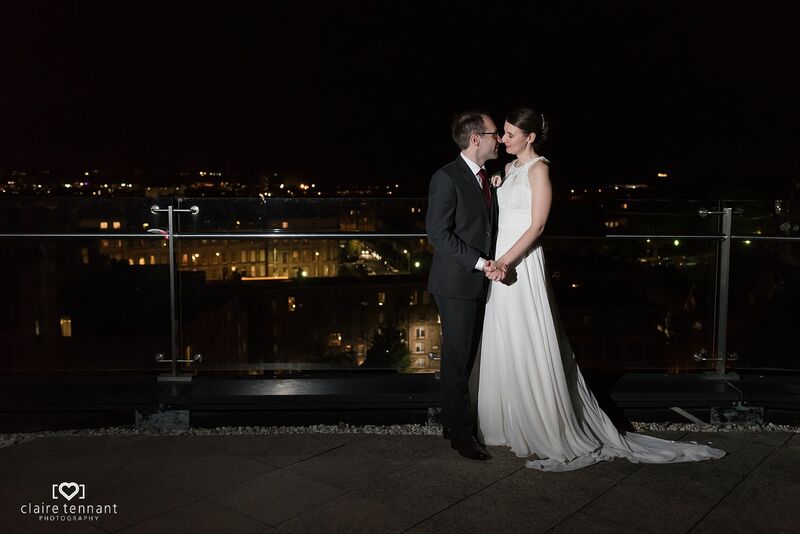 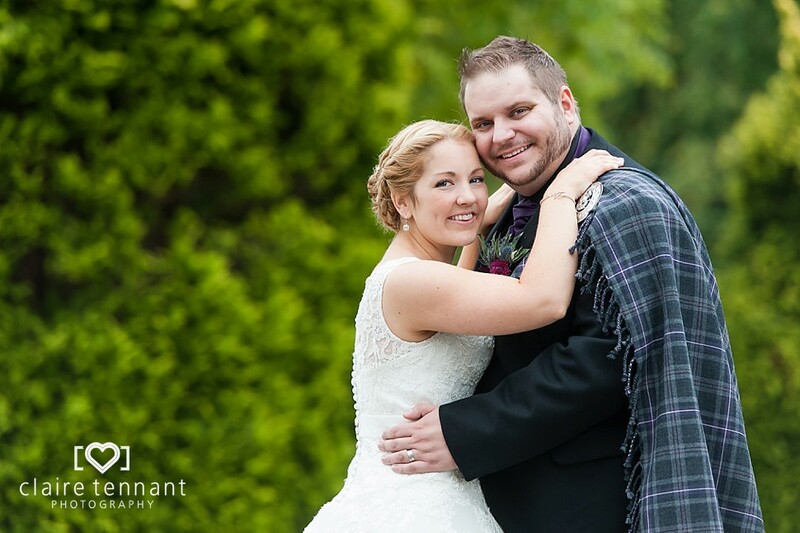 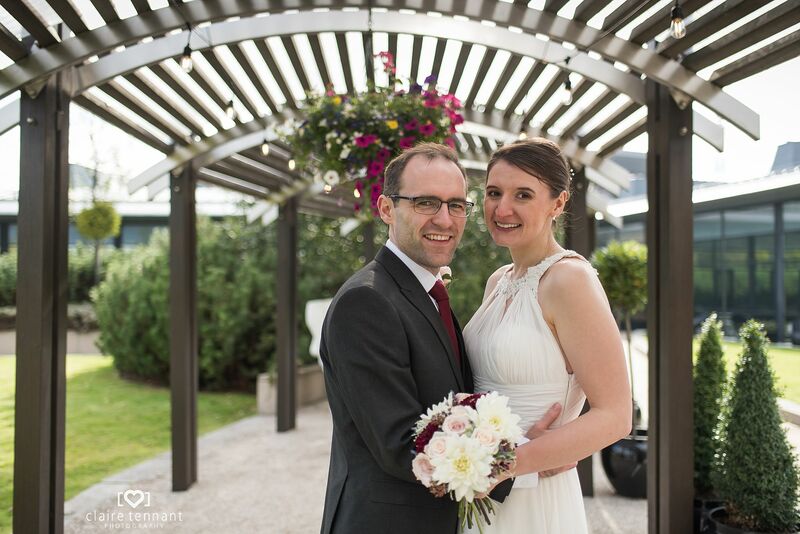 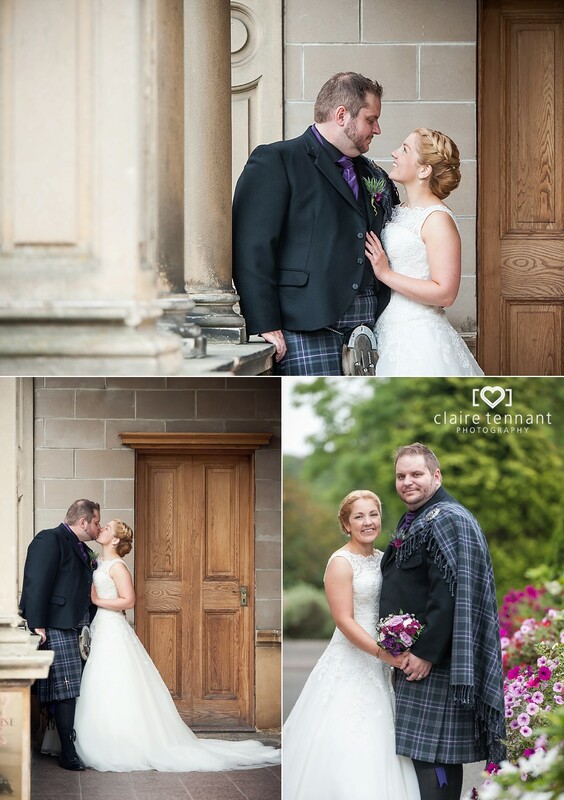 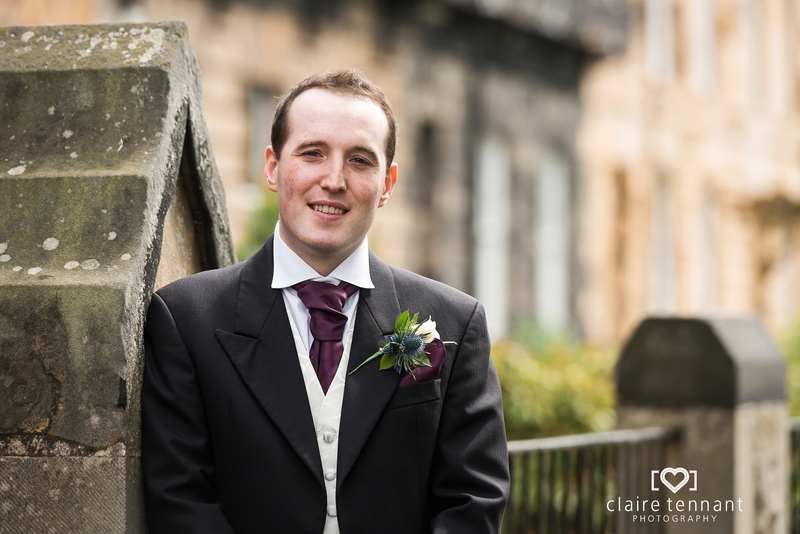 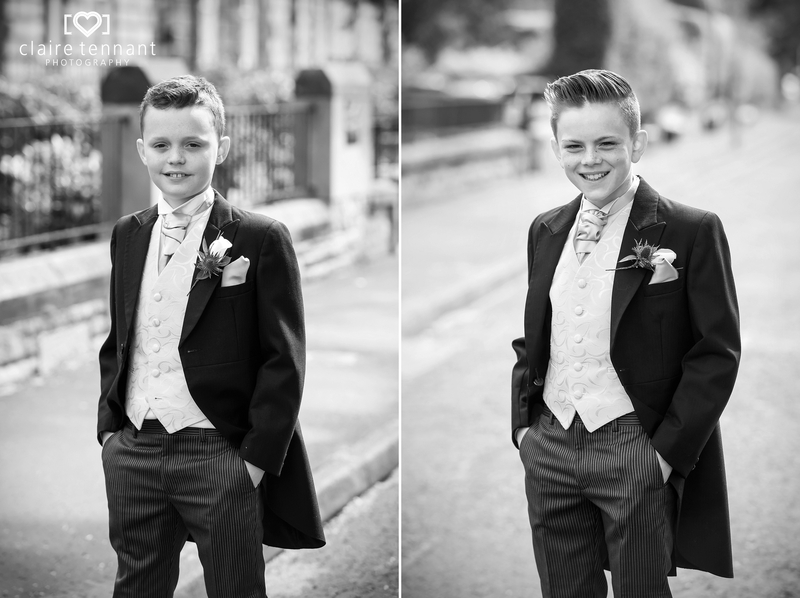 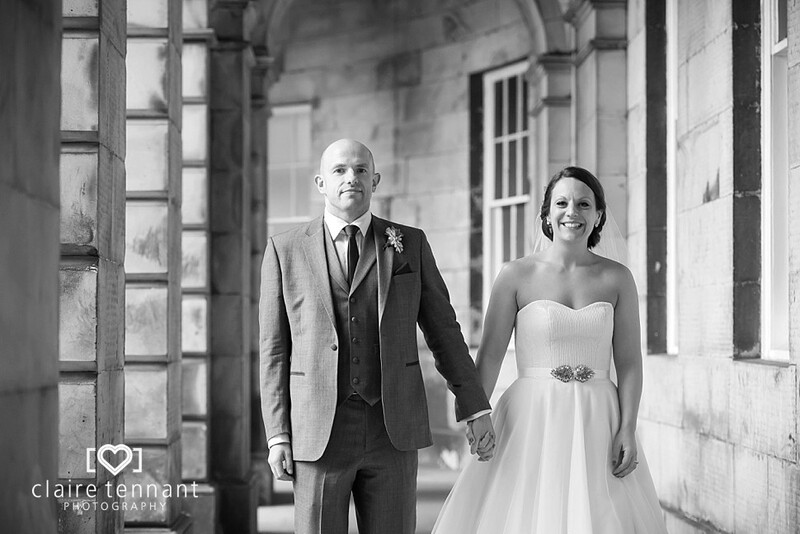 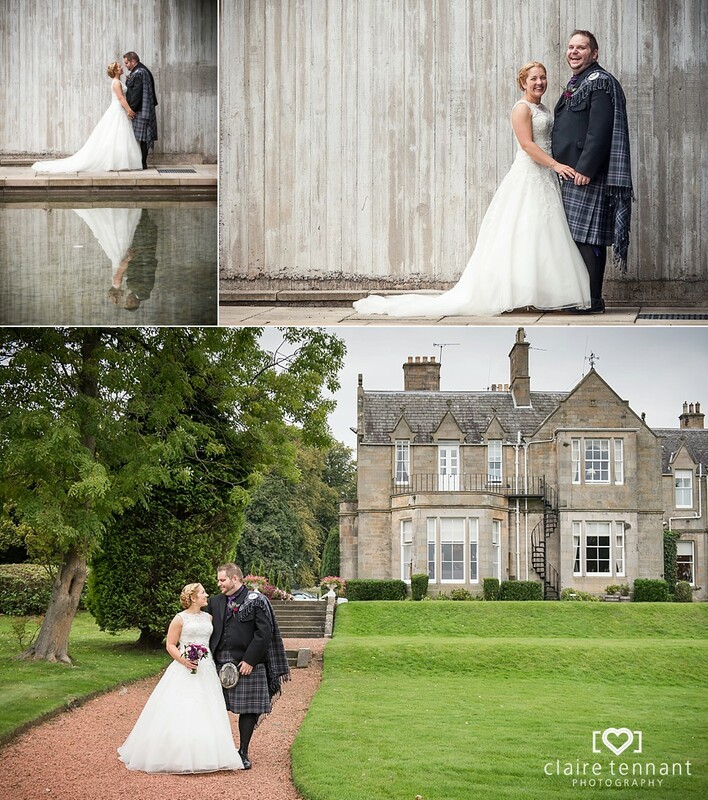 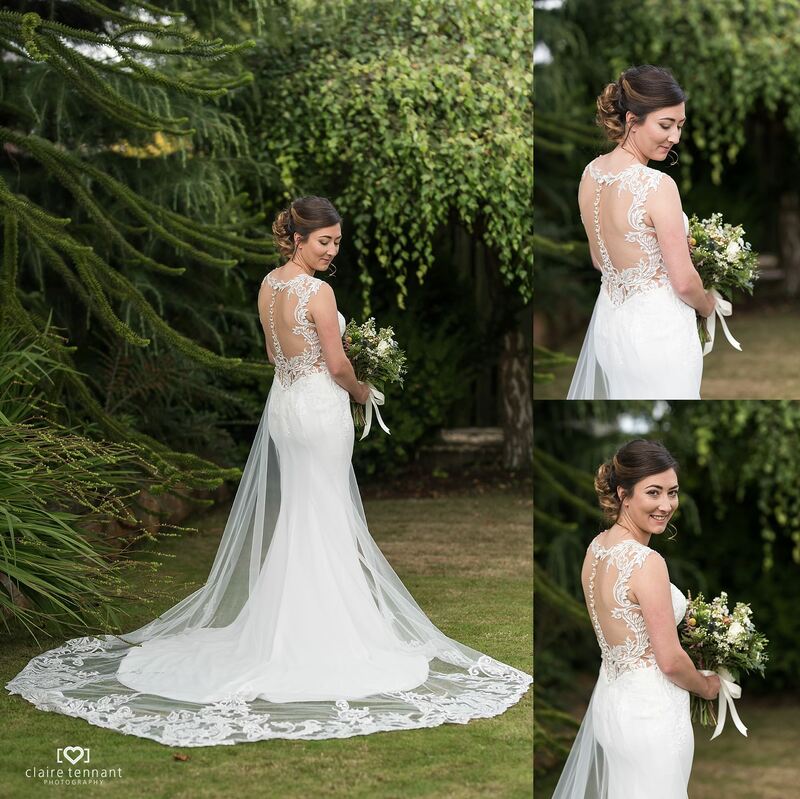 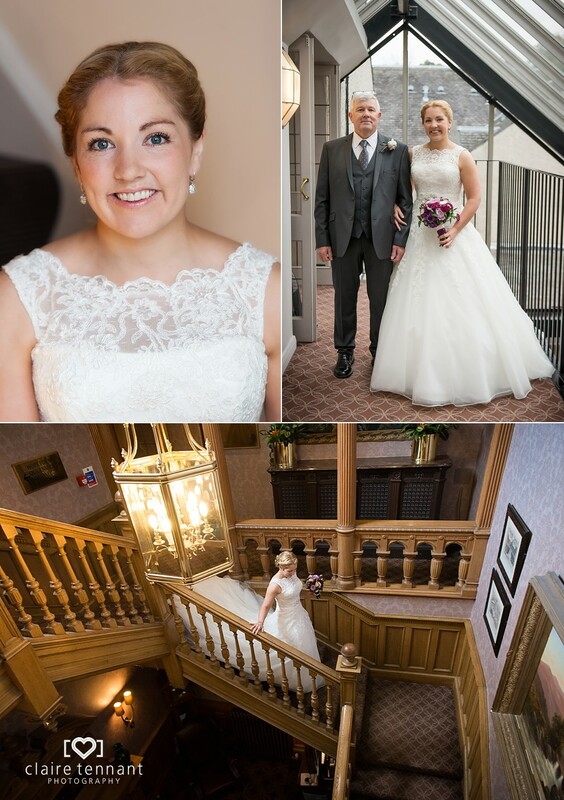 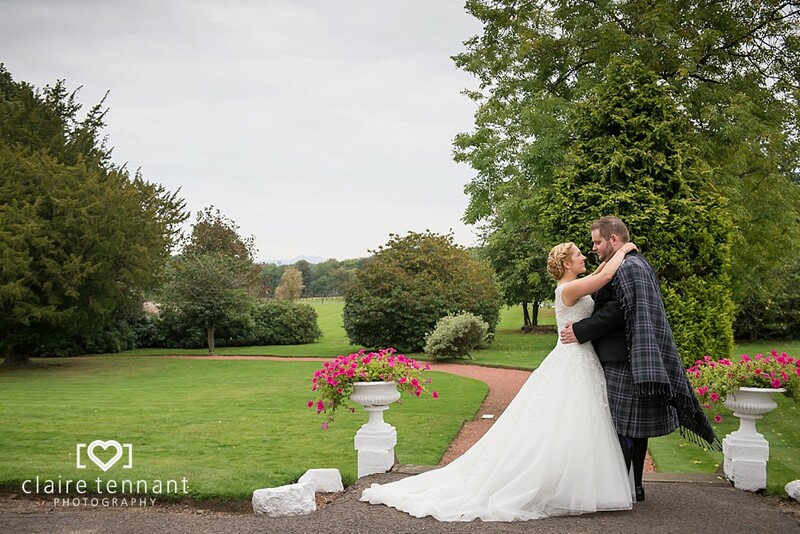 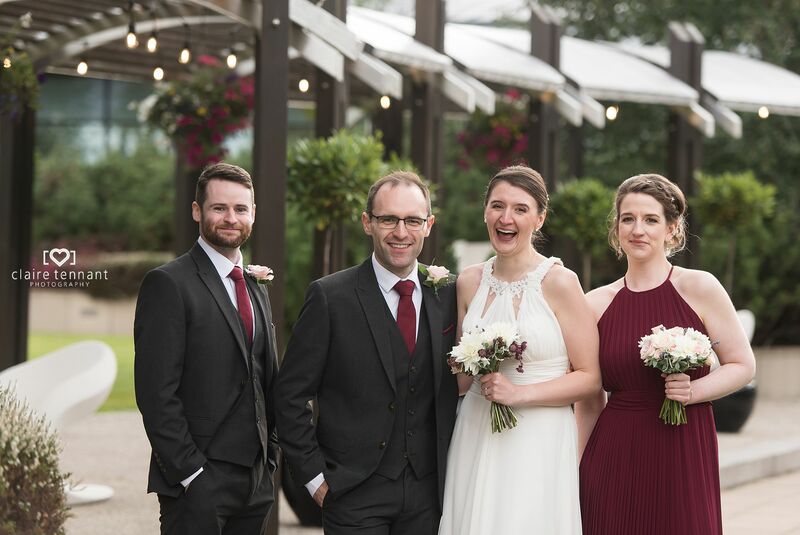 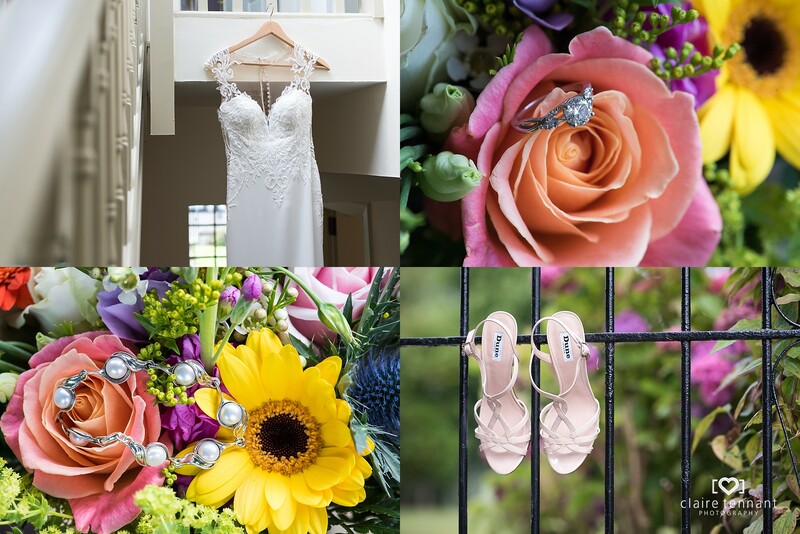 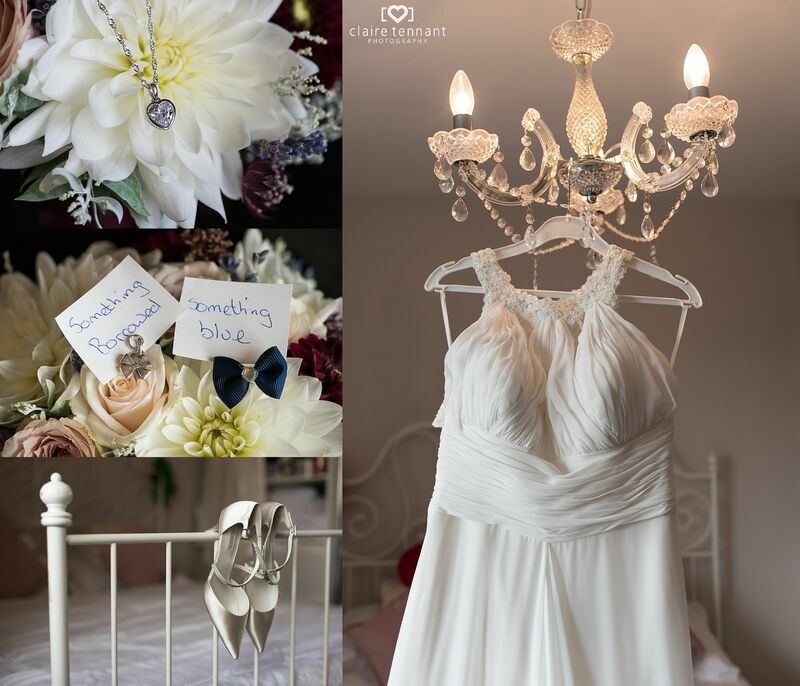 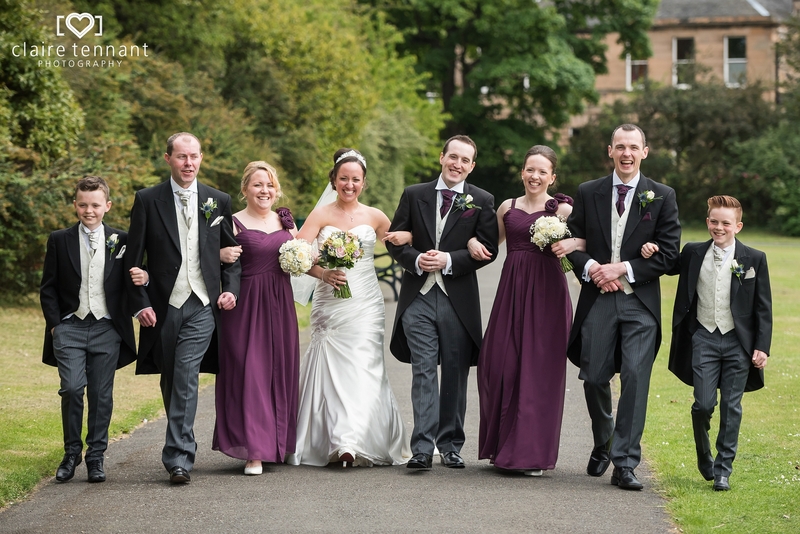 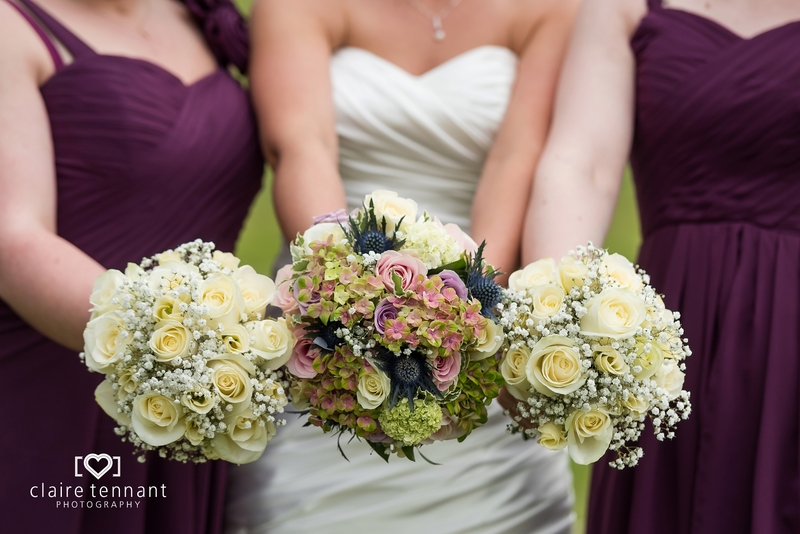 It was a pleasure to be Catriona and Richard’s photographer on their big day. 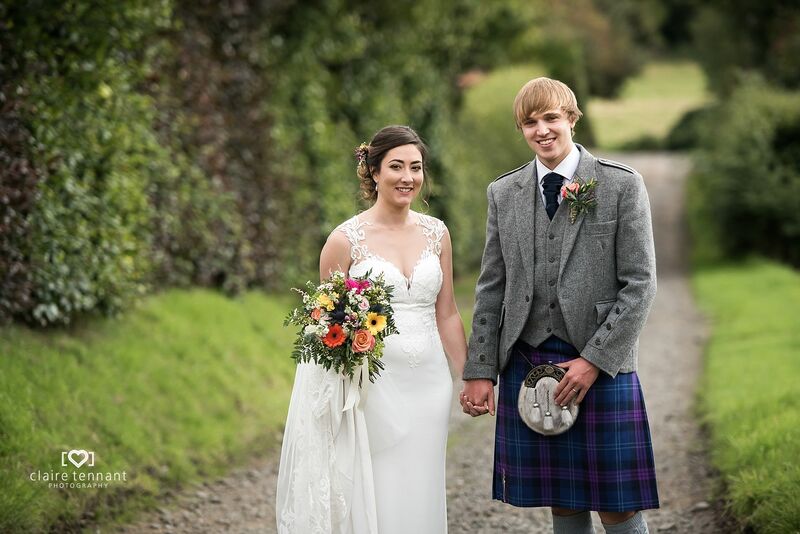 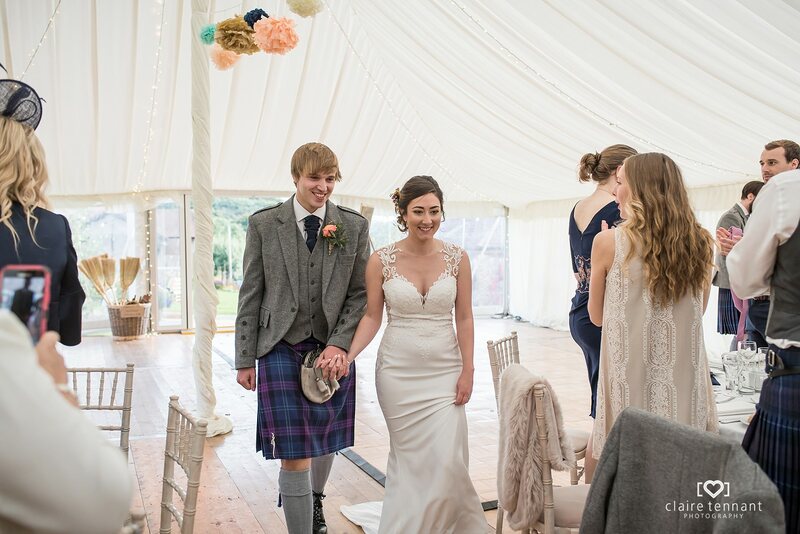 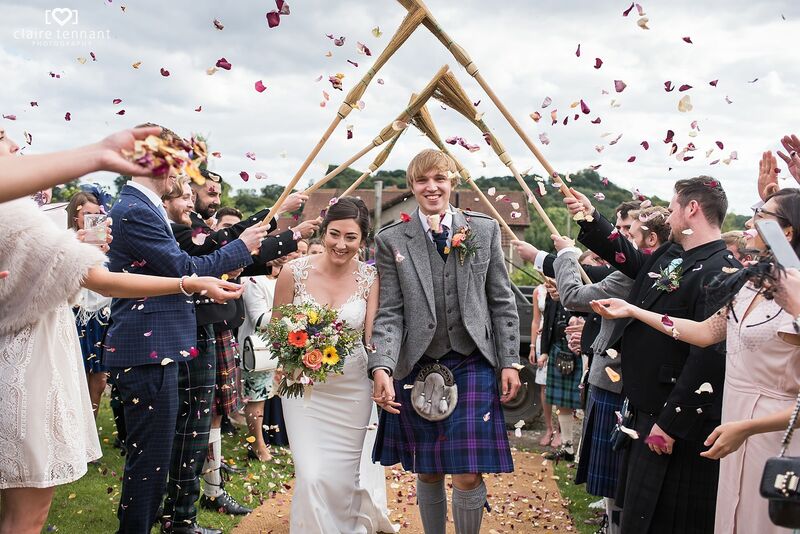 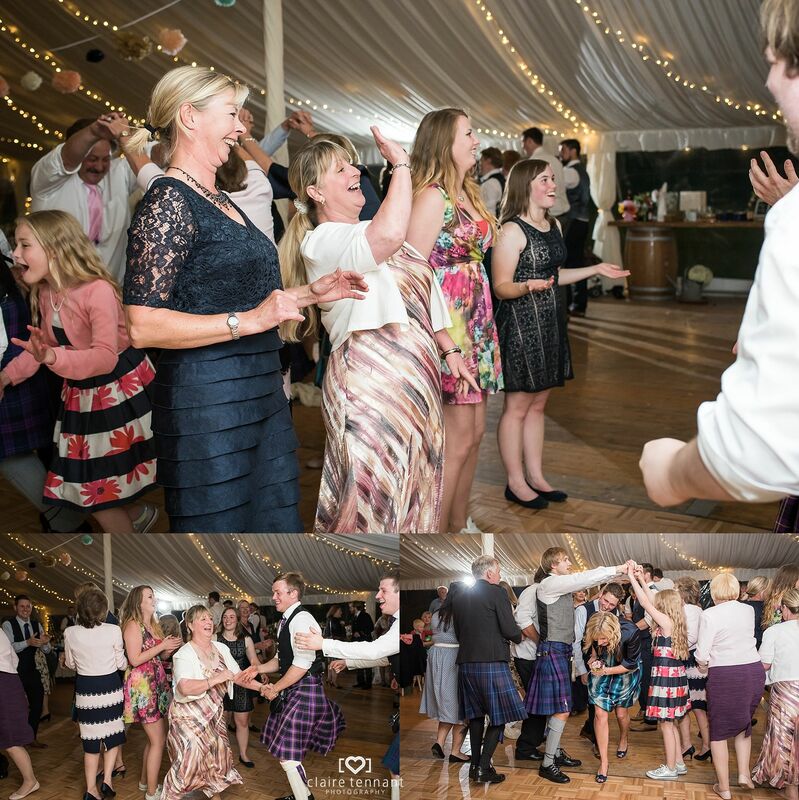 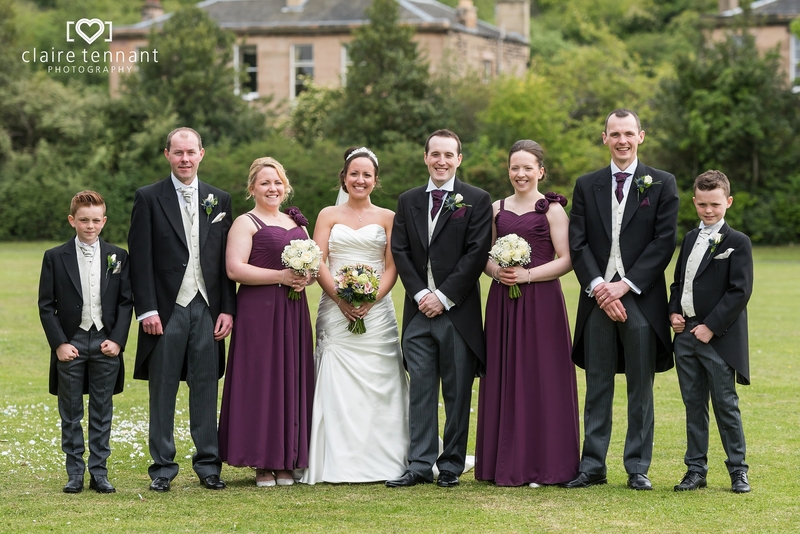 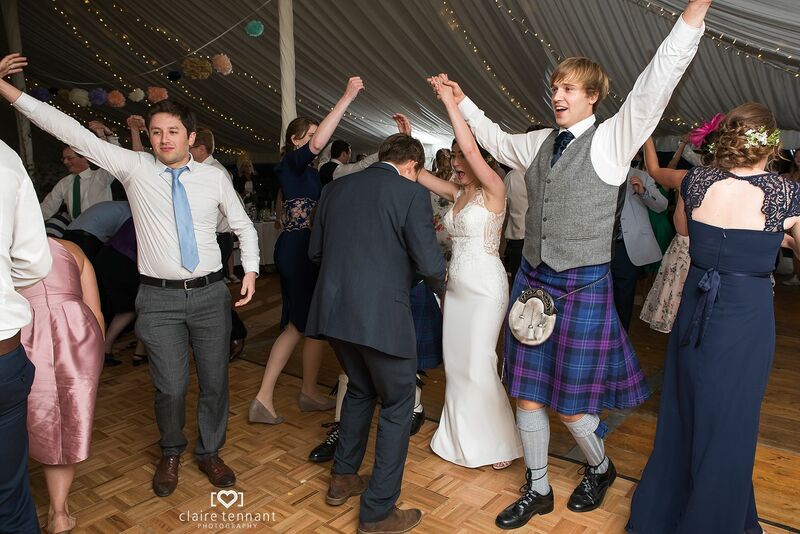 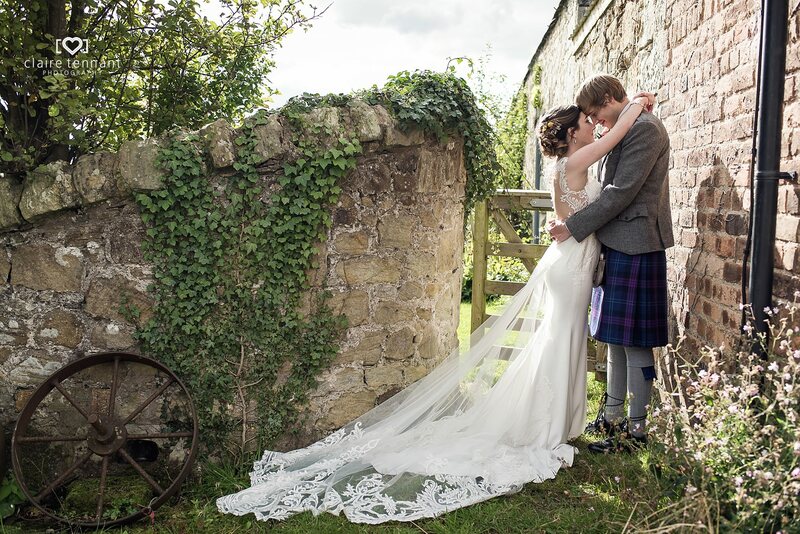 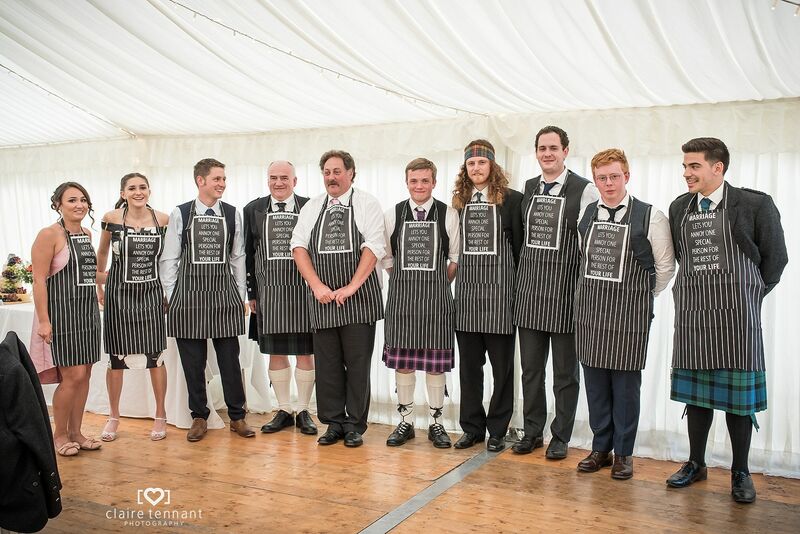 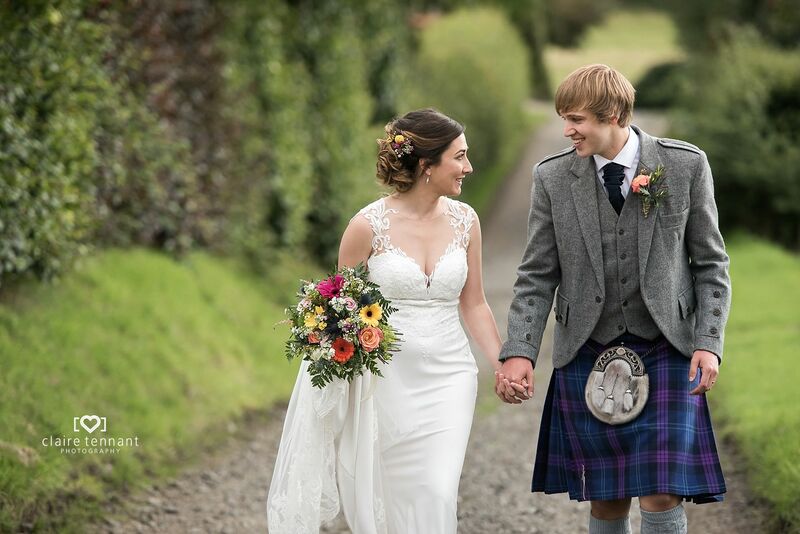 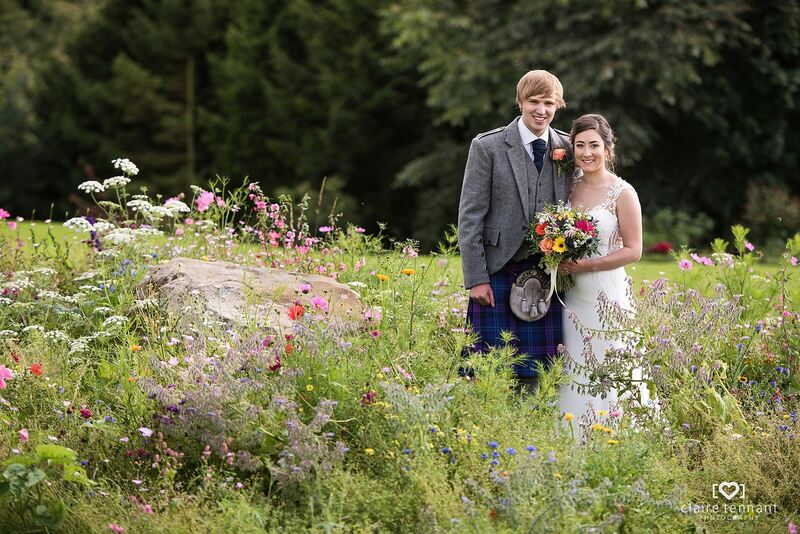 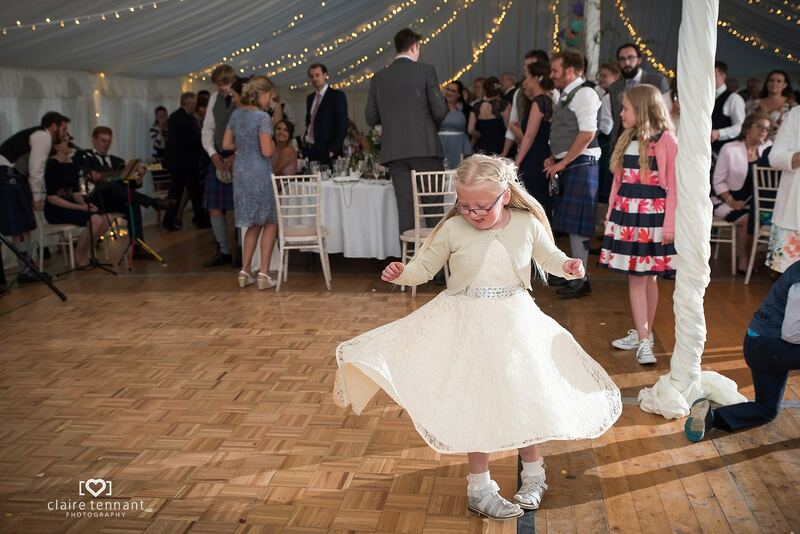 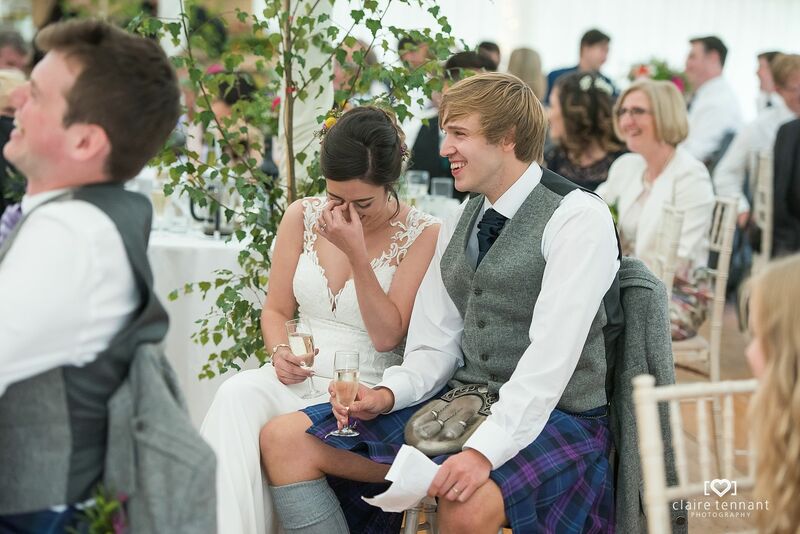 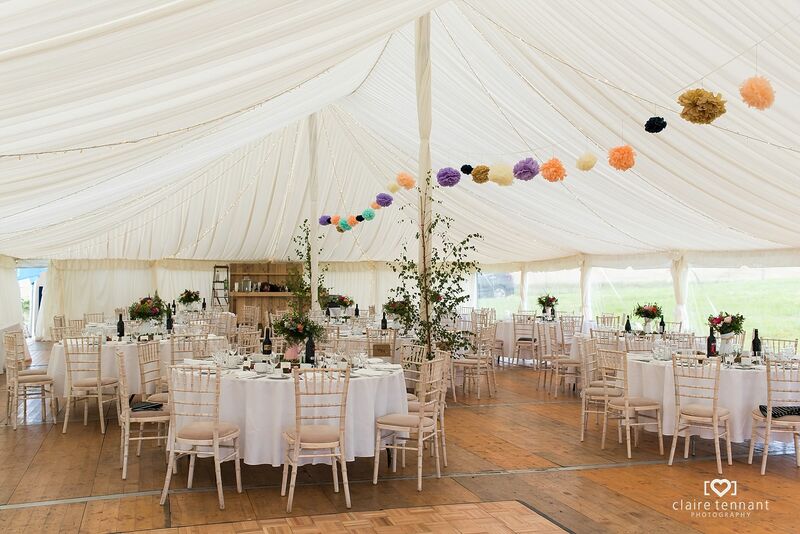 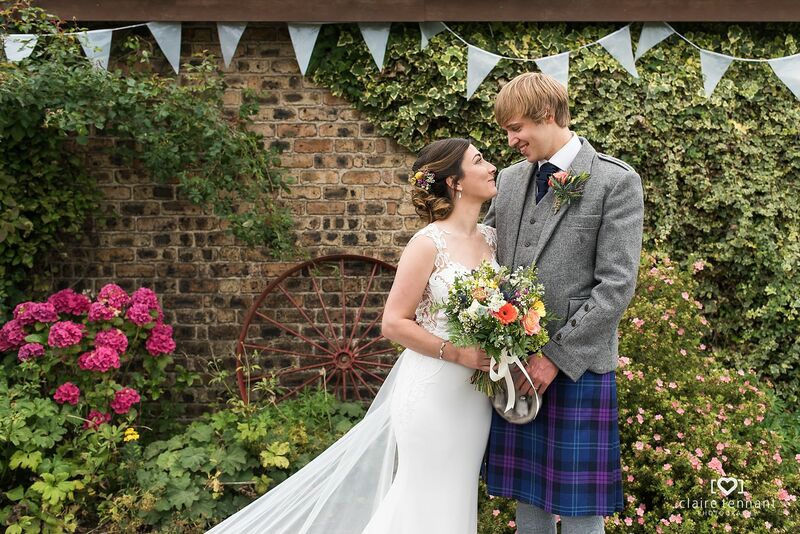 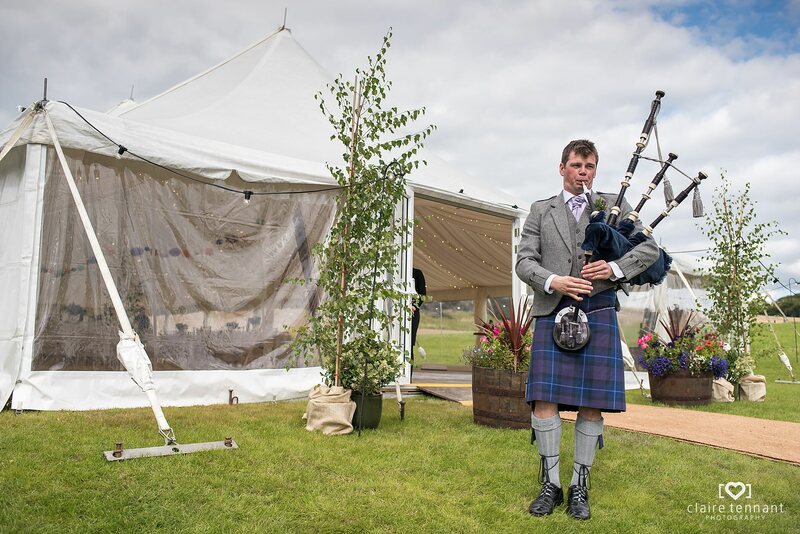 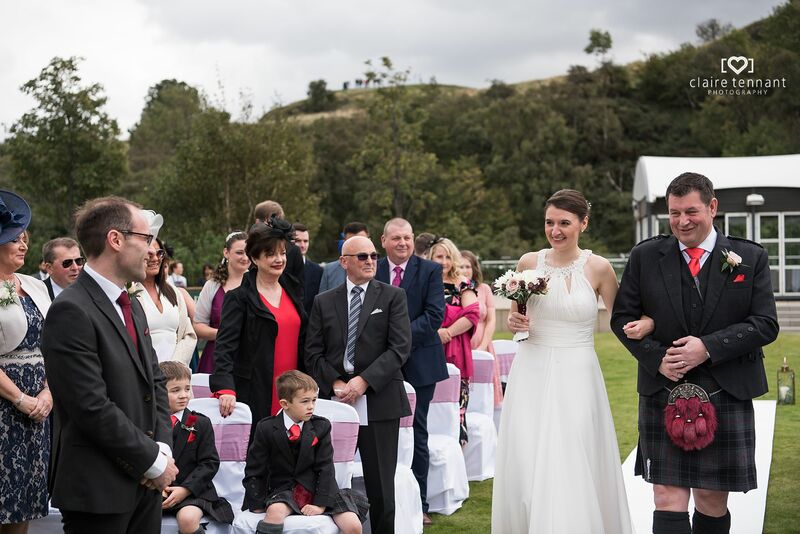 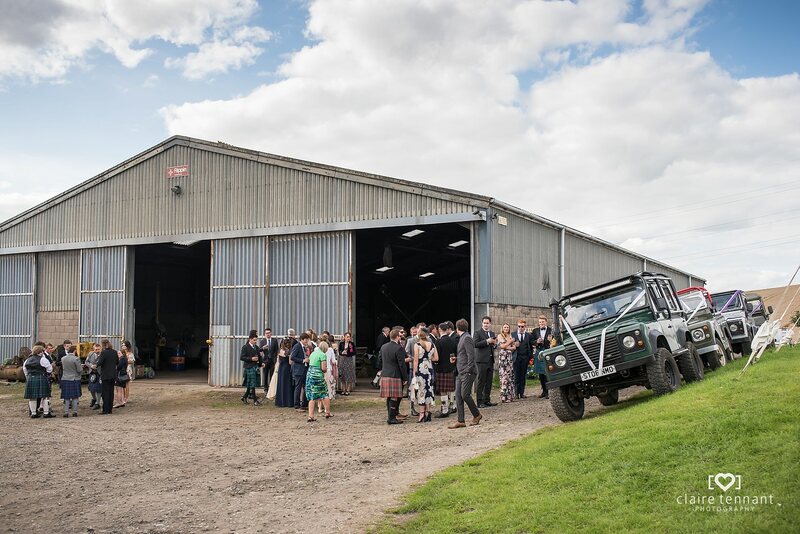 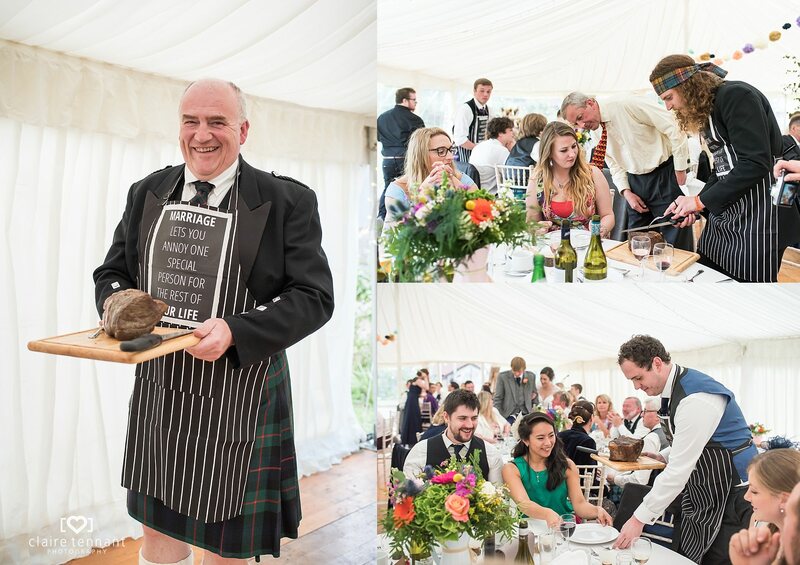 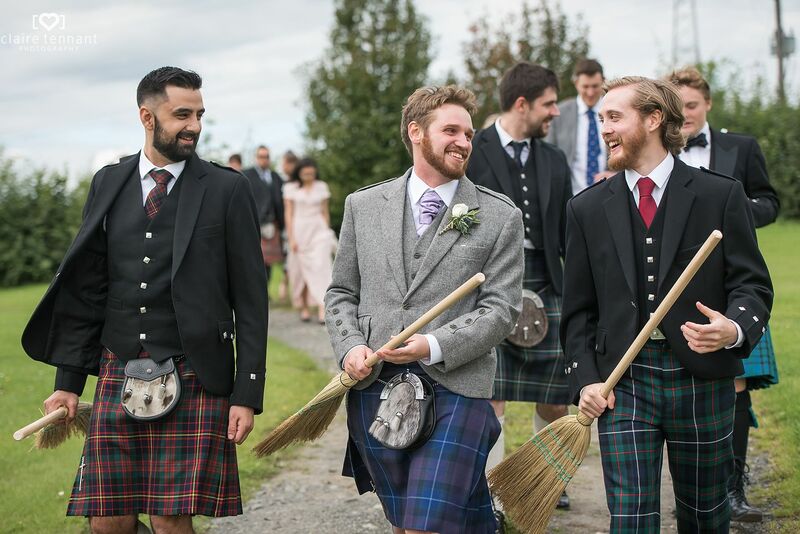 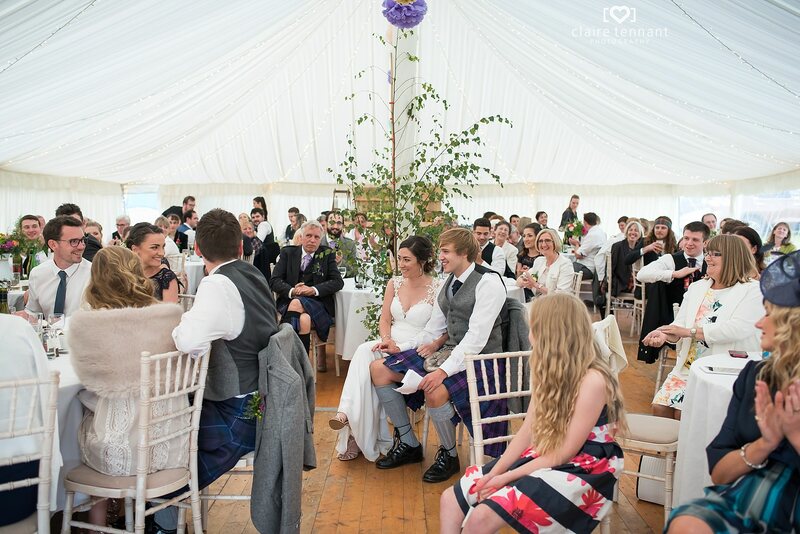 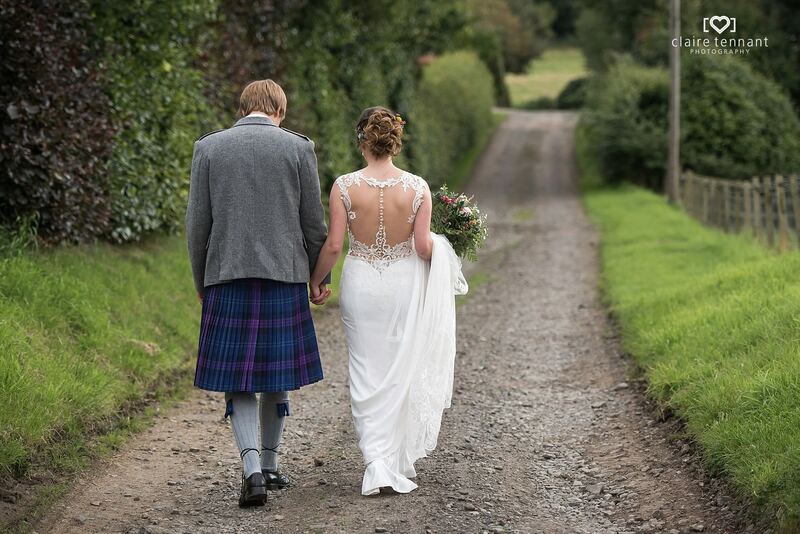 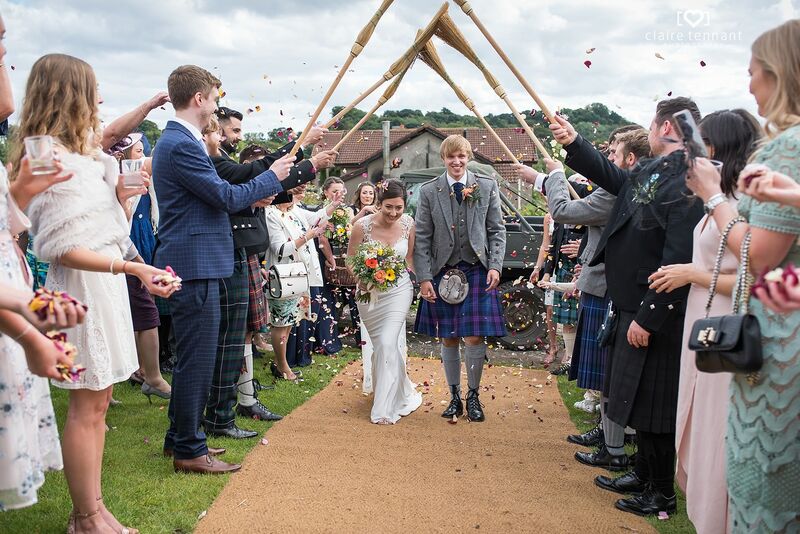 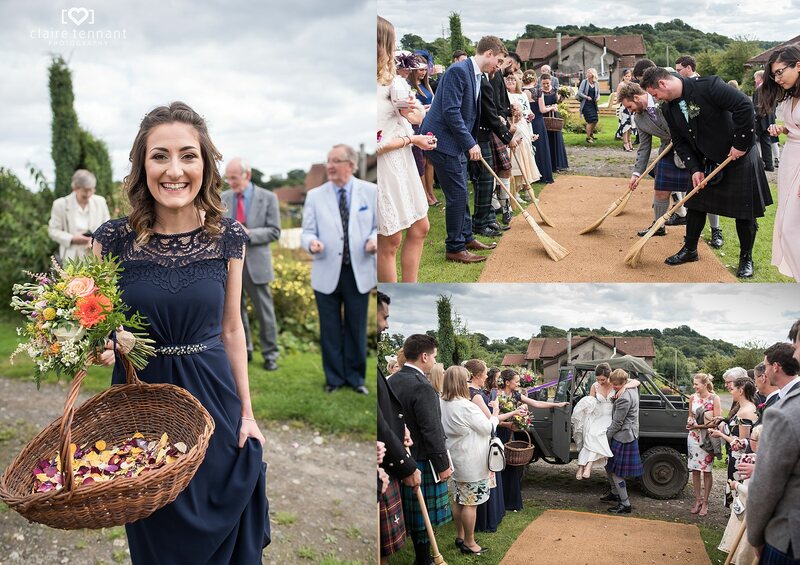 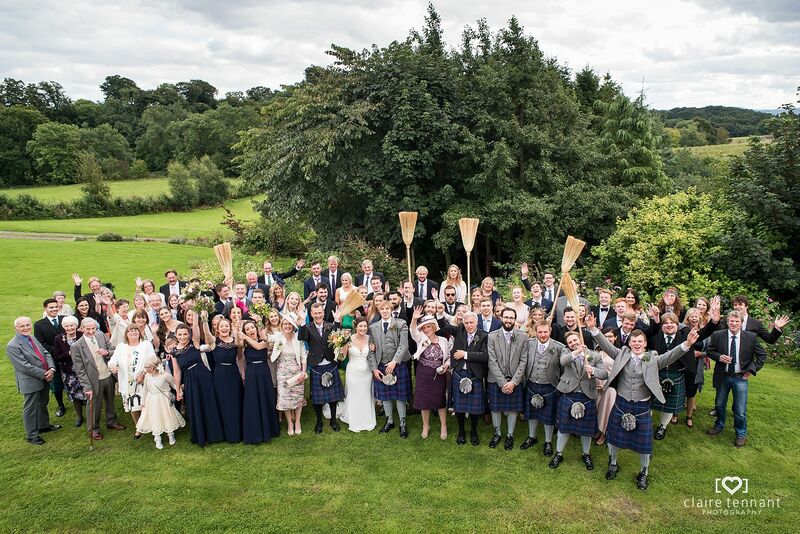 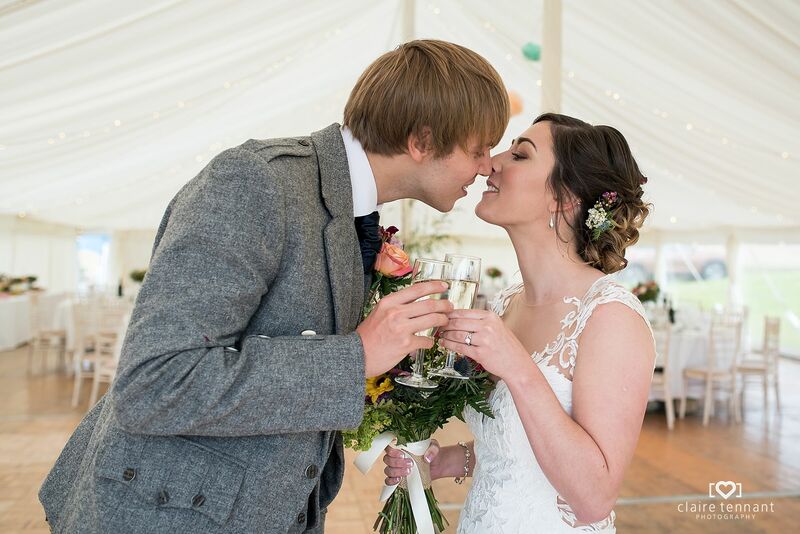 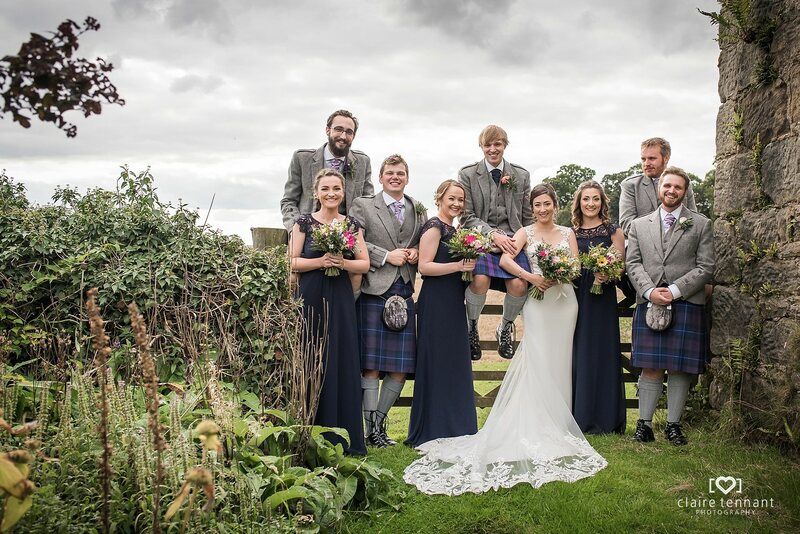 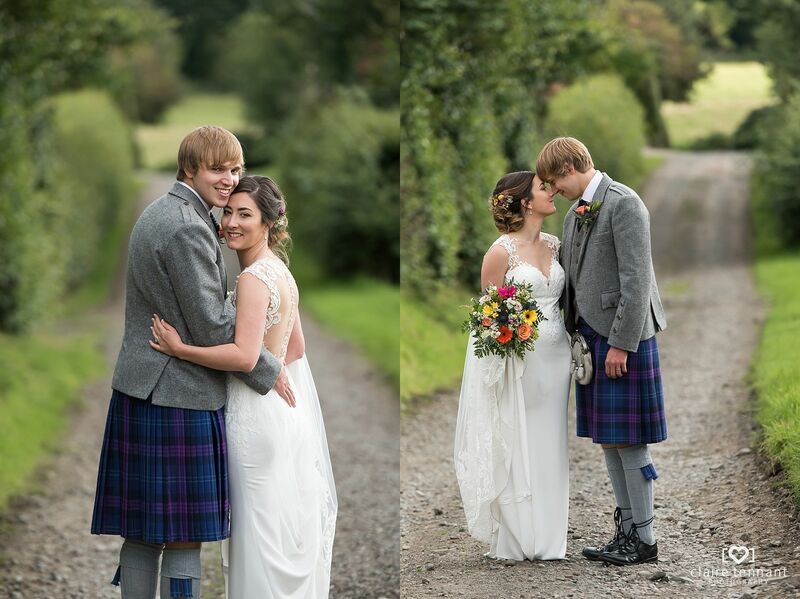 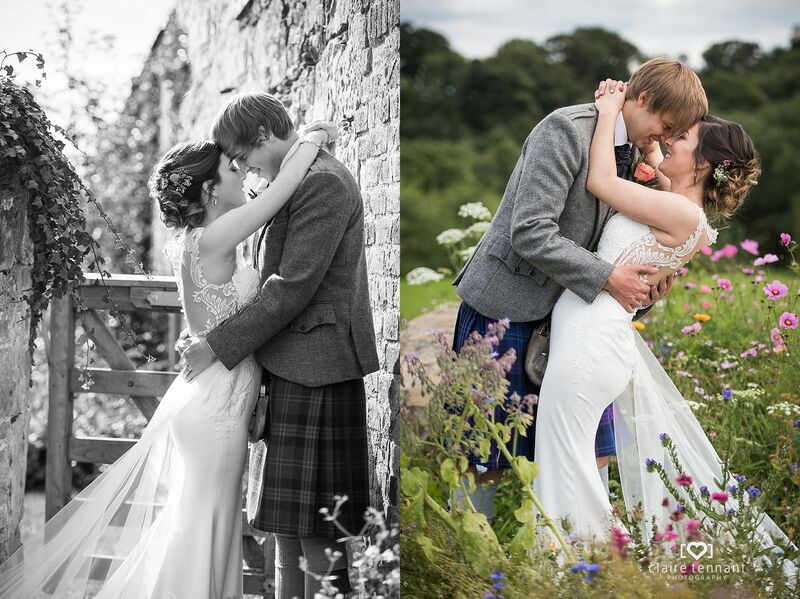 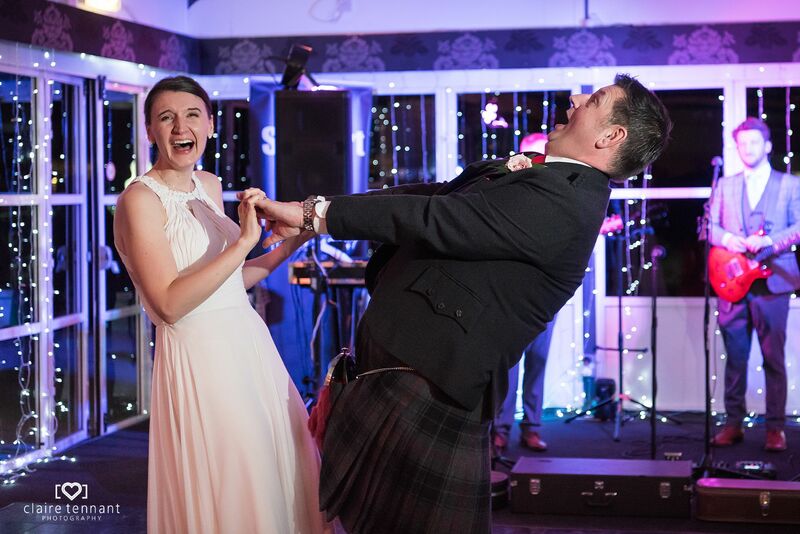 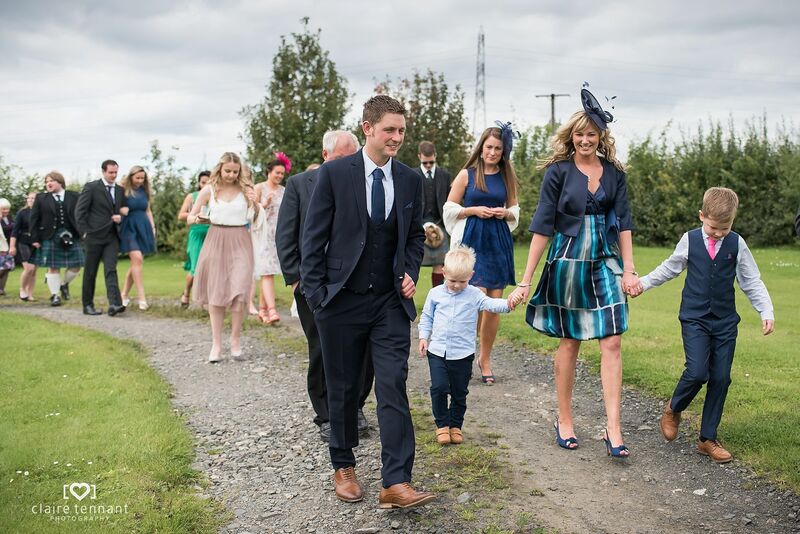 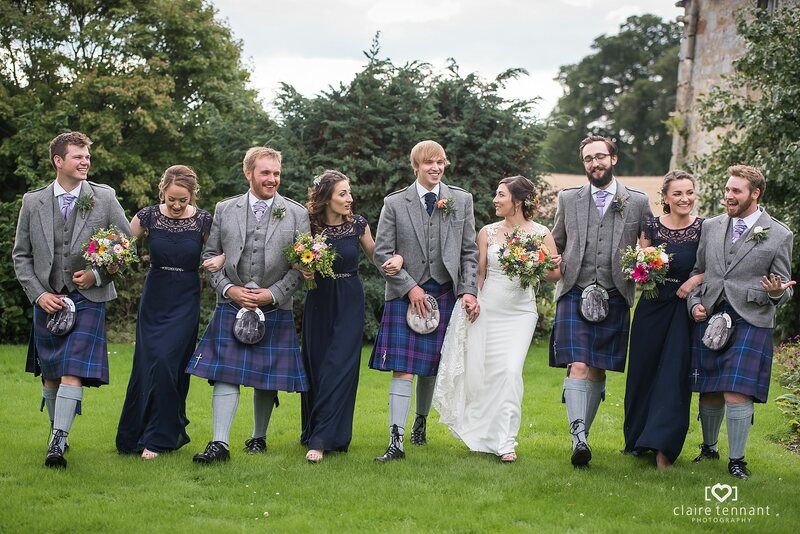 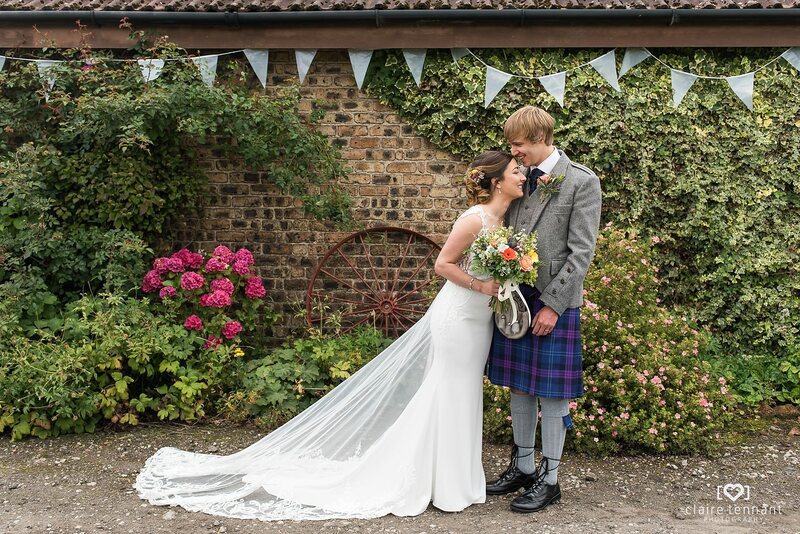 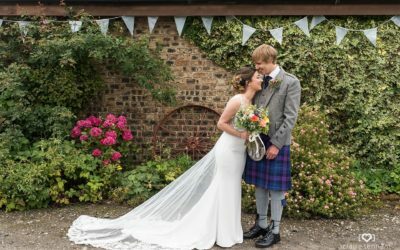 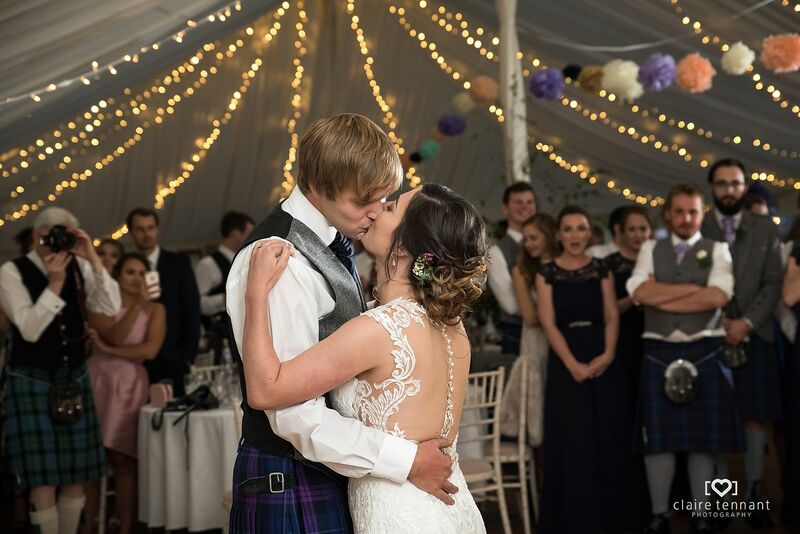 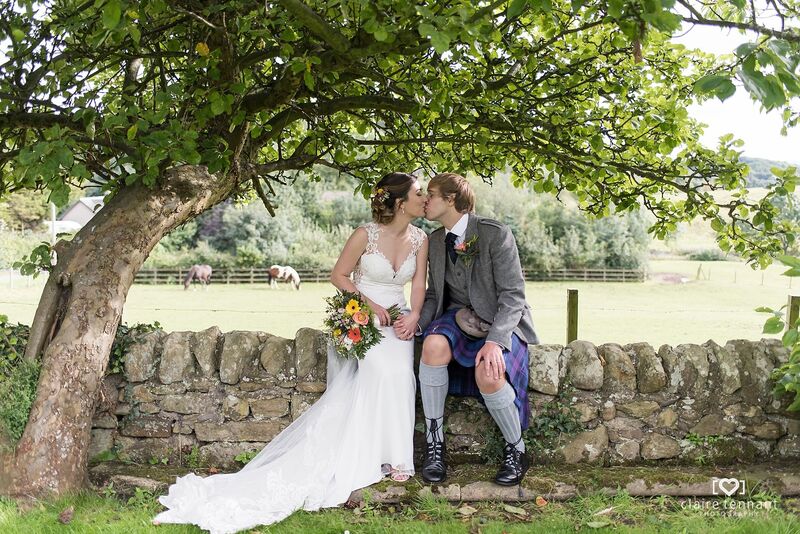 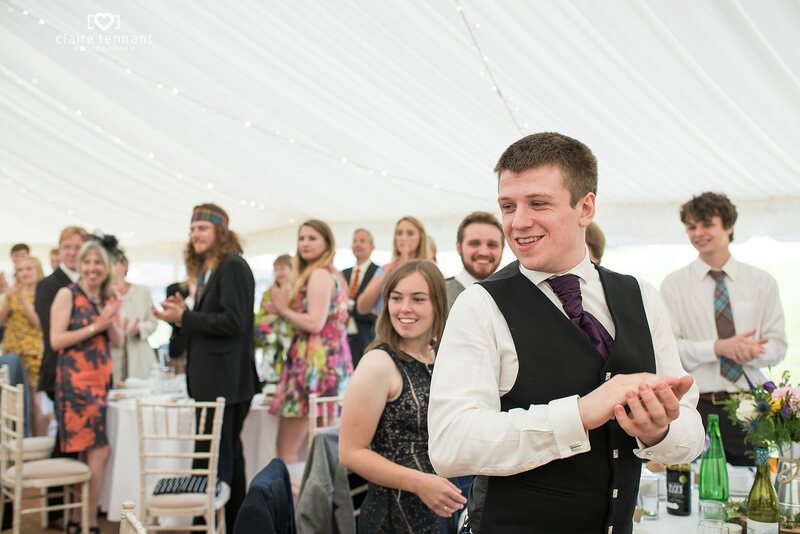 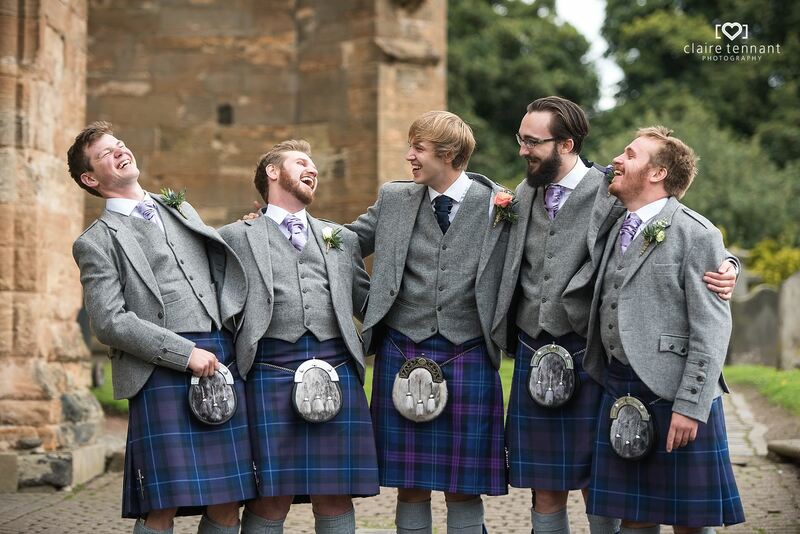 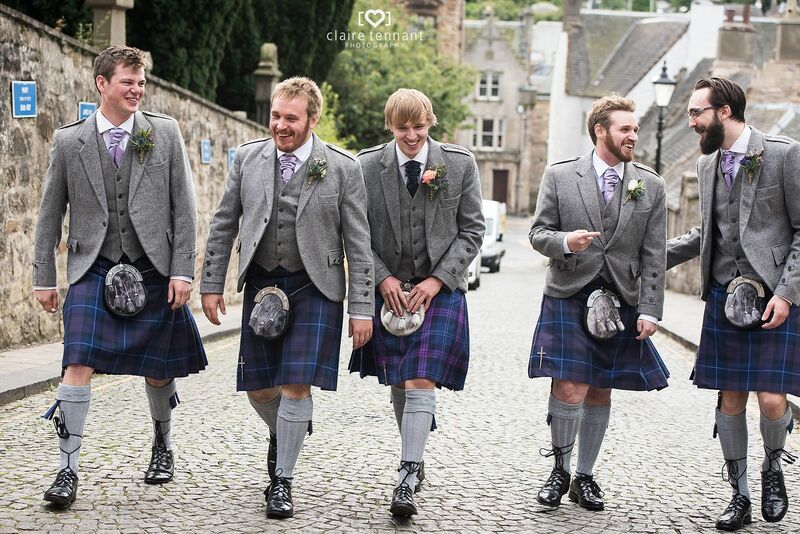 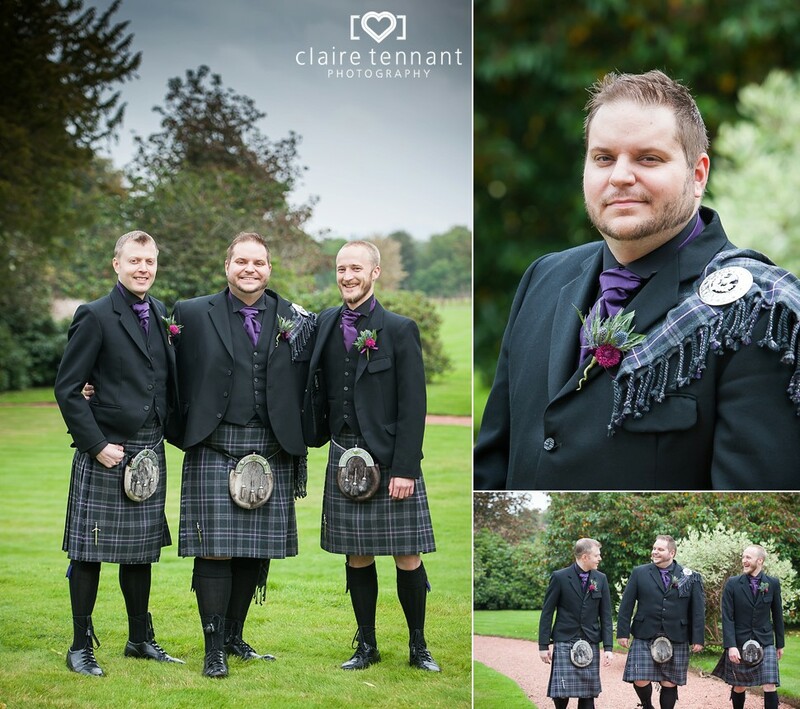 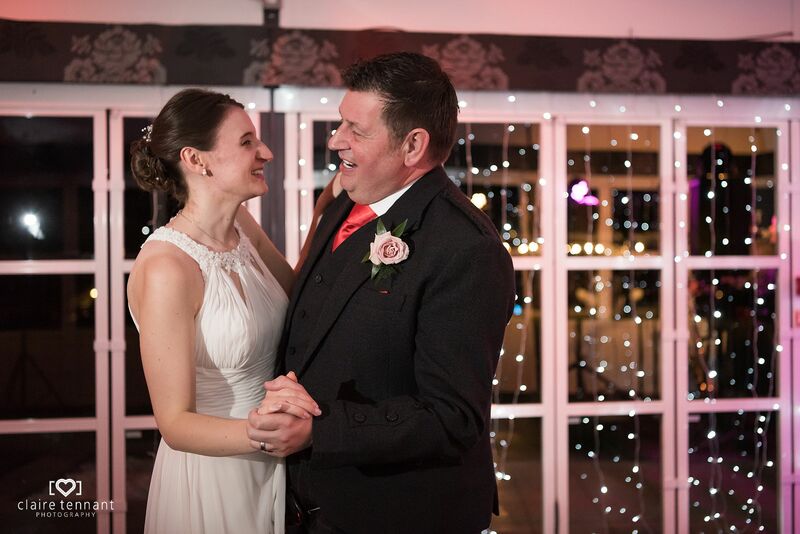 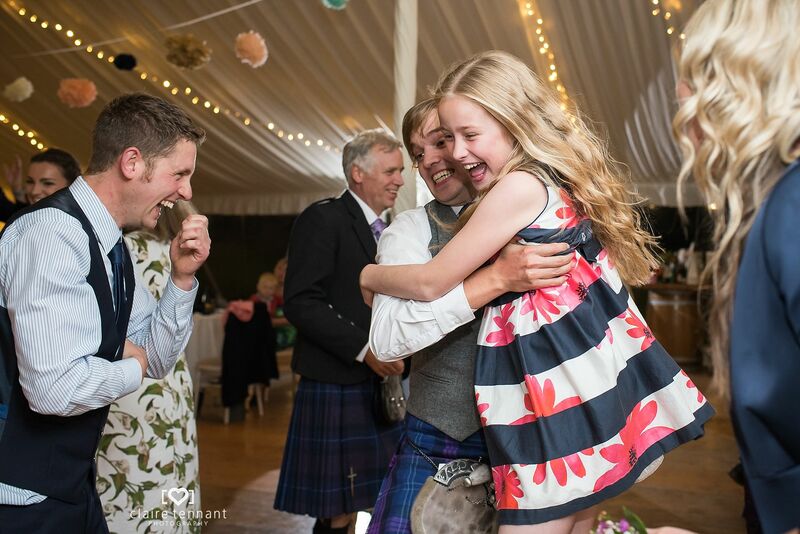 They chose to have a relaxed Scottish farm wedding reception on Richard’s parent’s farm in Fife near Edinburgh. 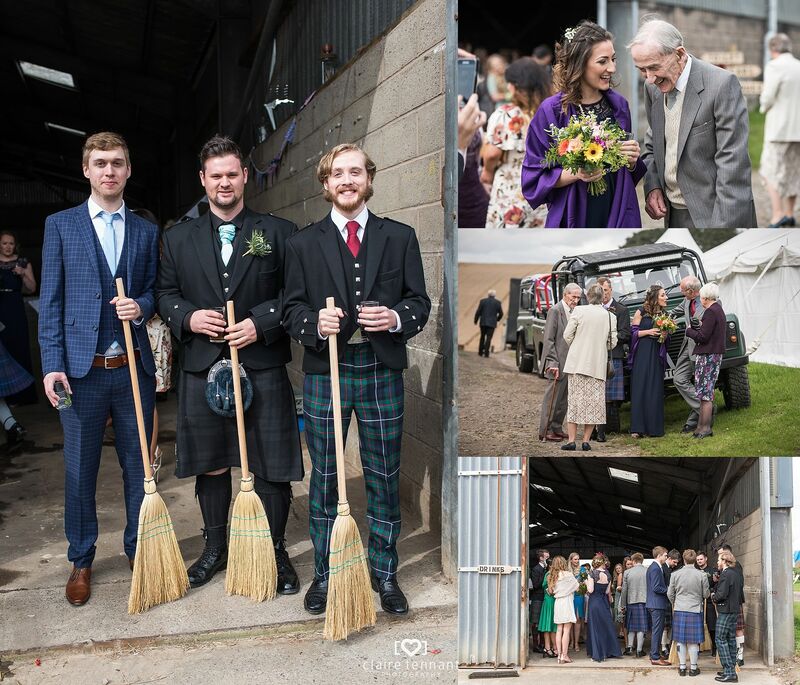 It was a dream come true to photograph a wedding on farm and it has to be one of my favourite weddings ever! 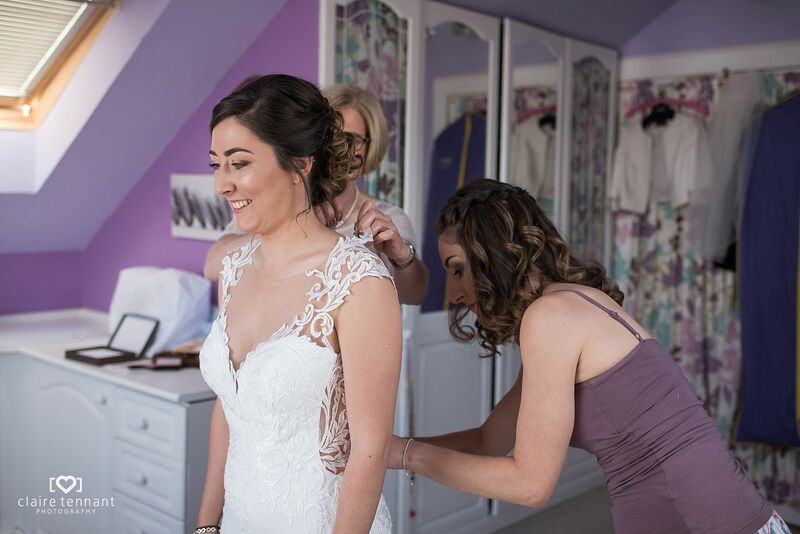 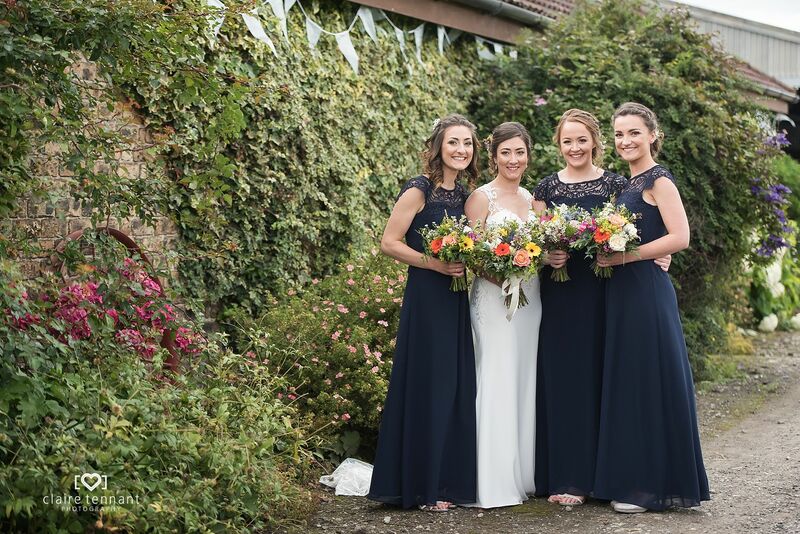 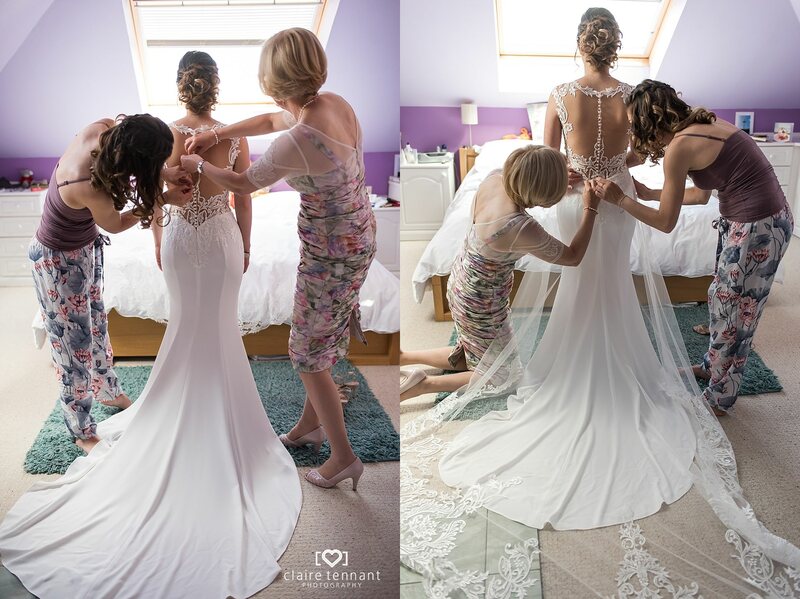 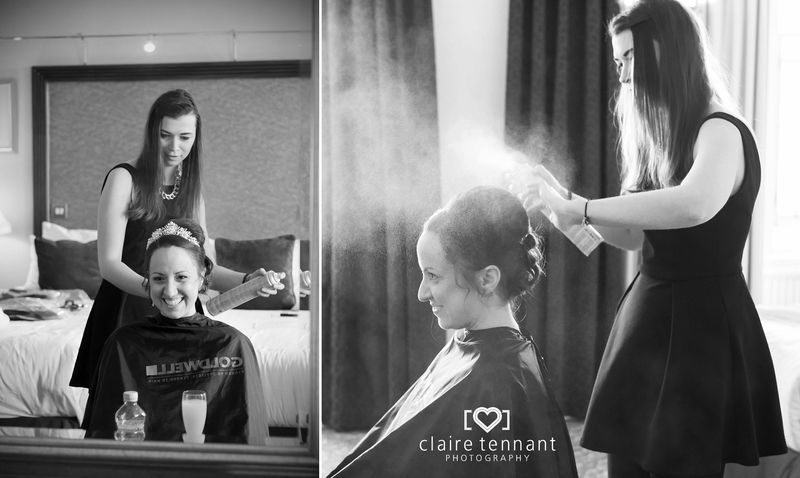 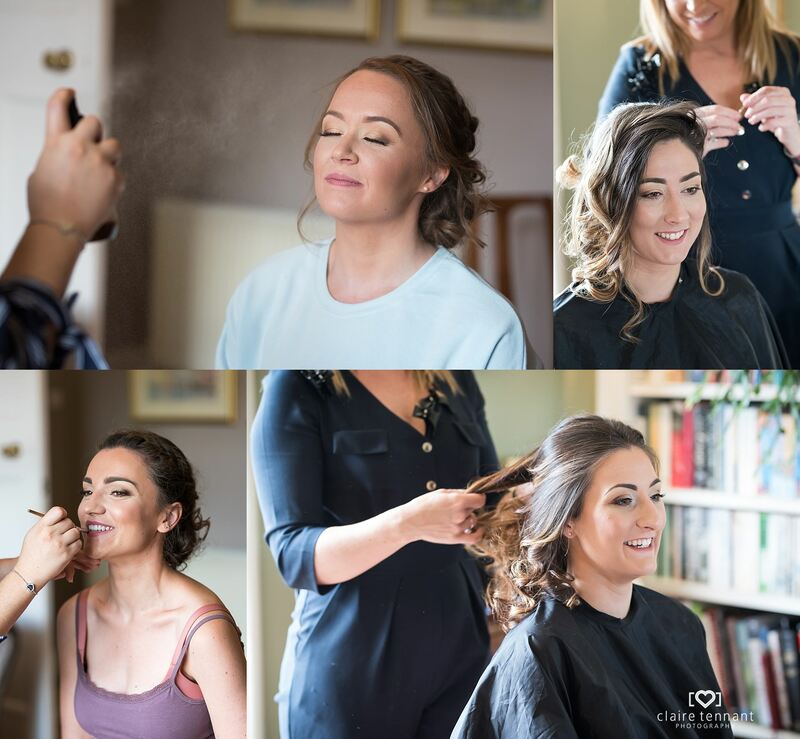 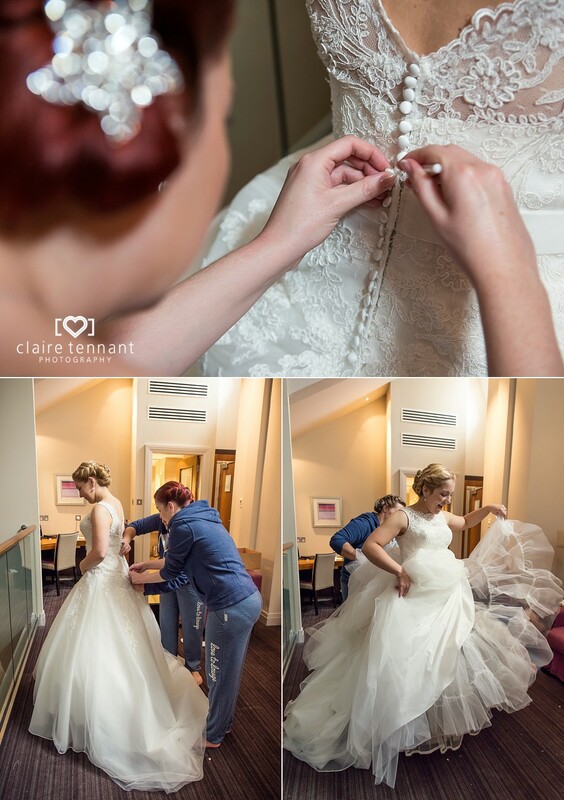 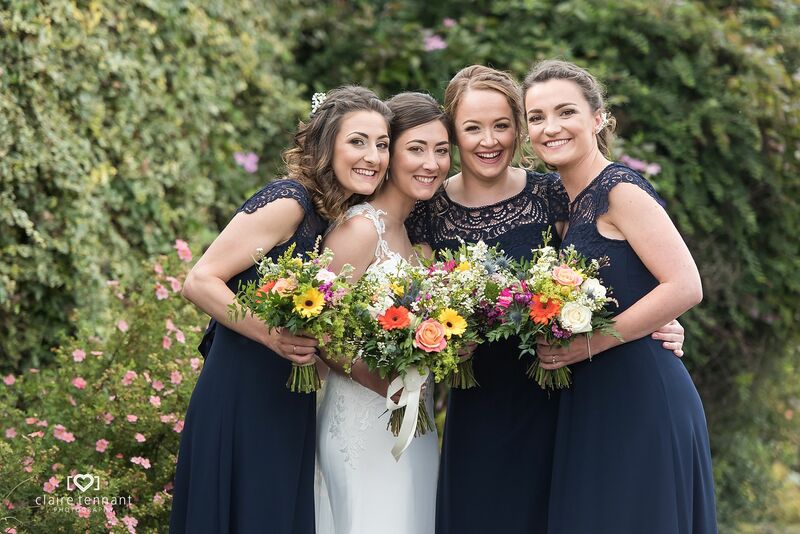 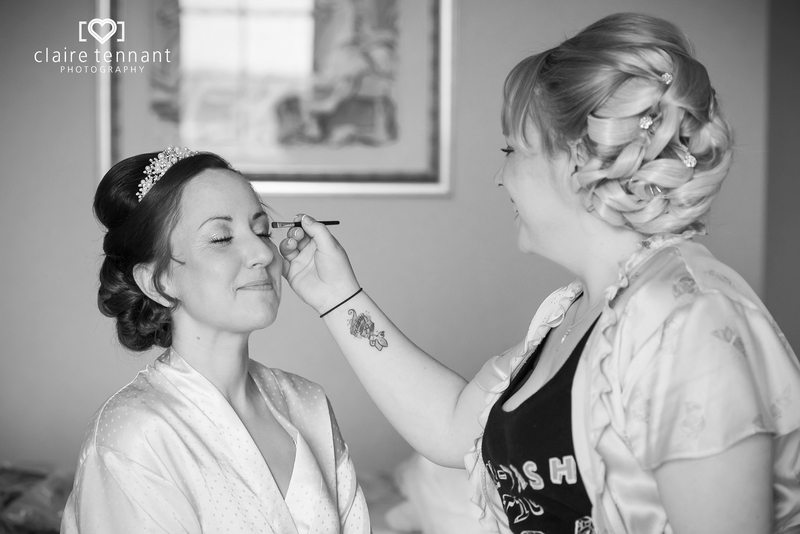 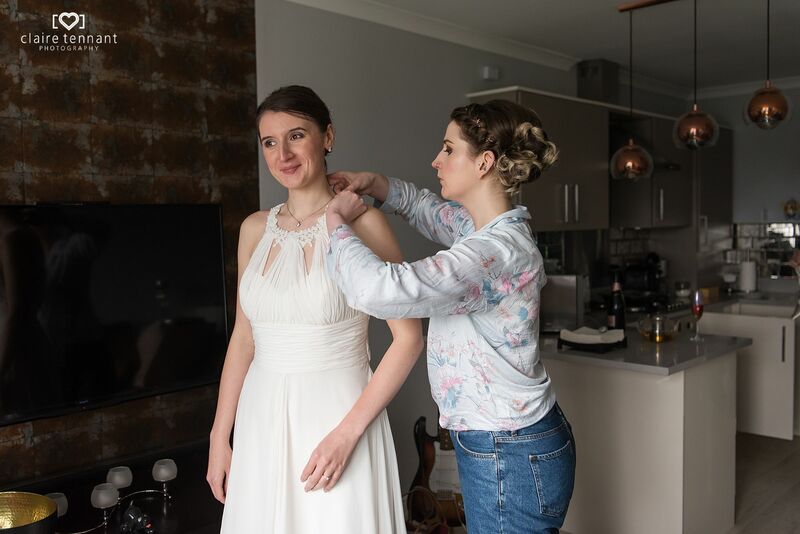 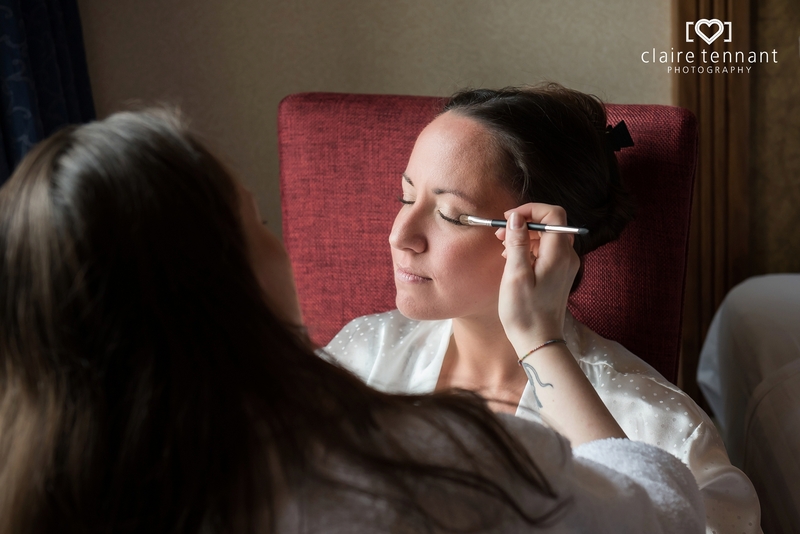 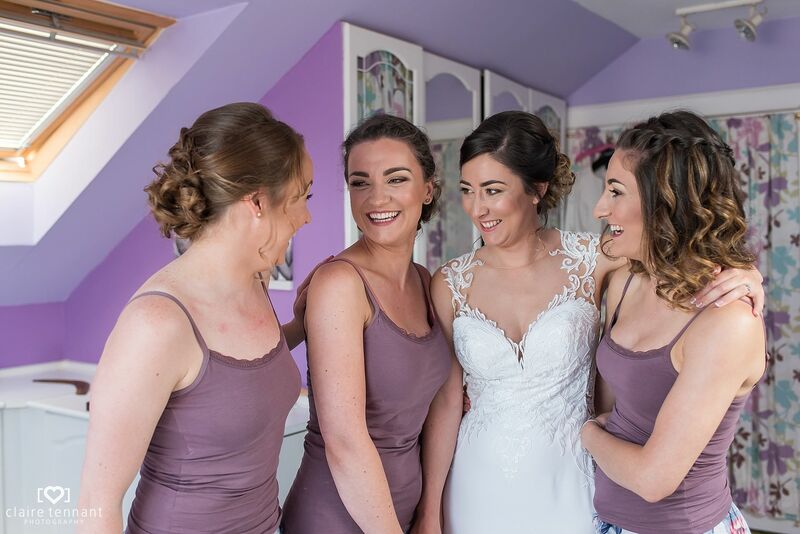 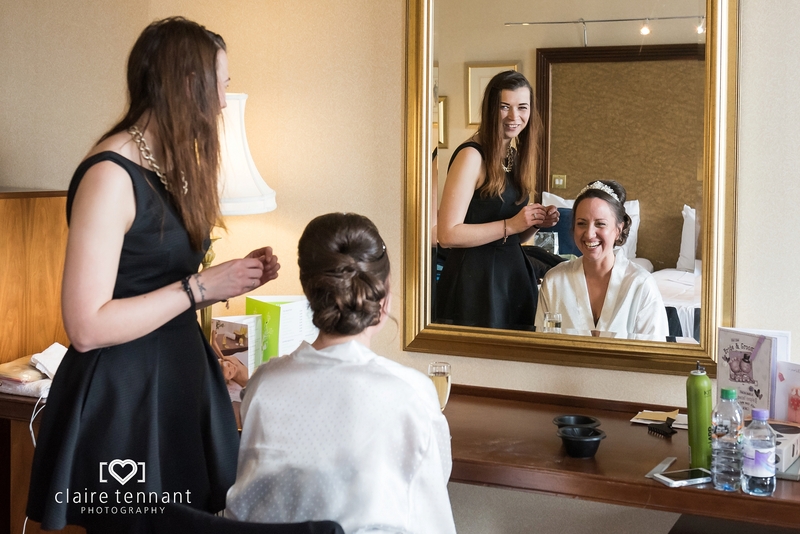 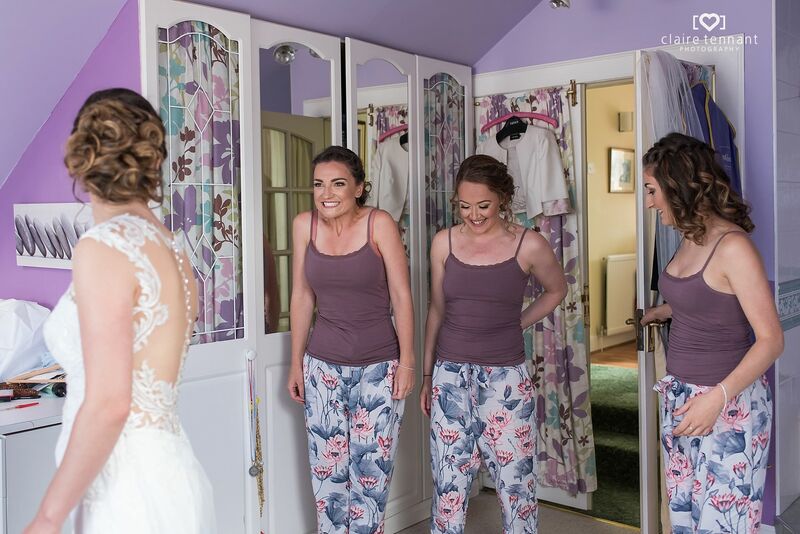 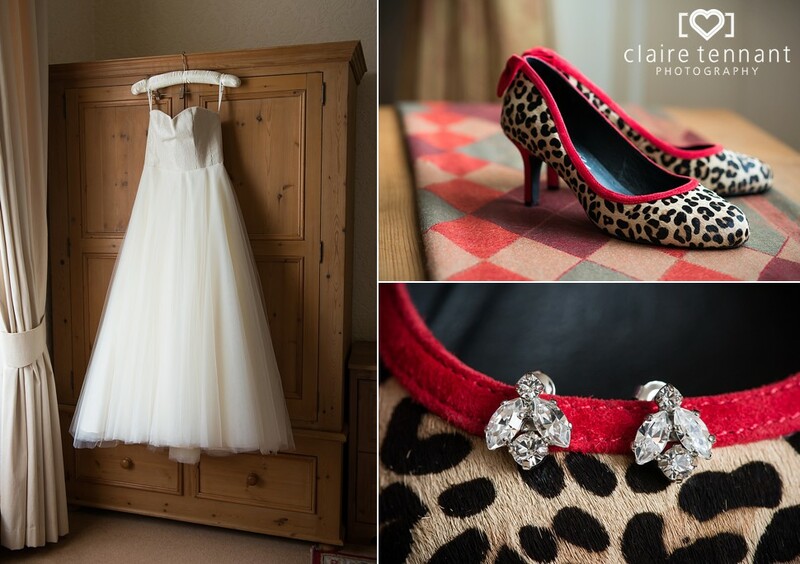 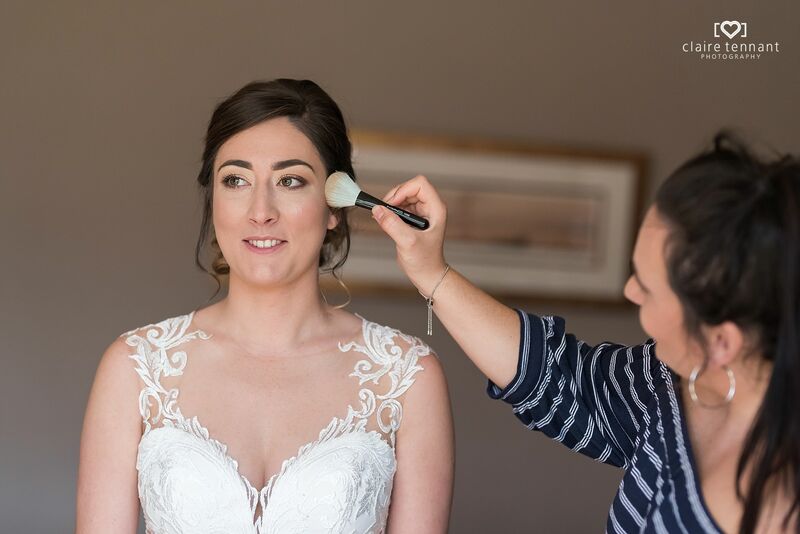 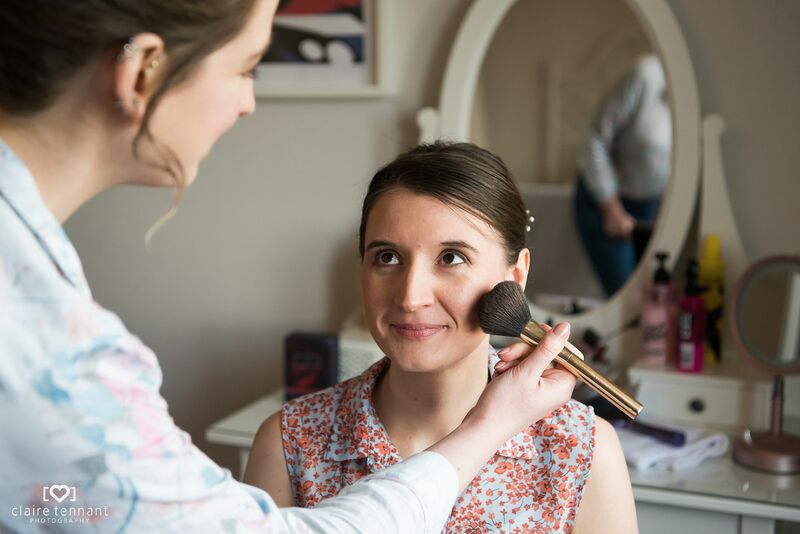 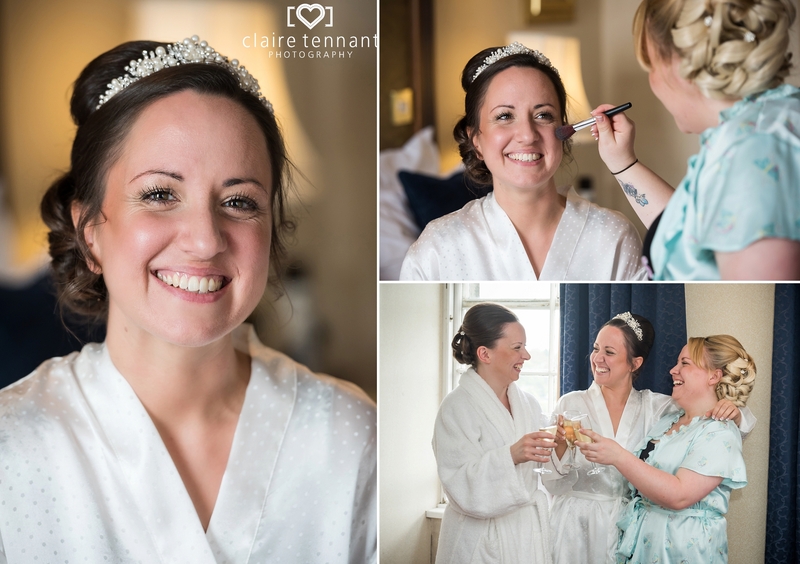 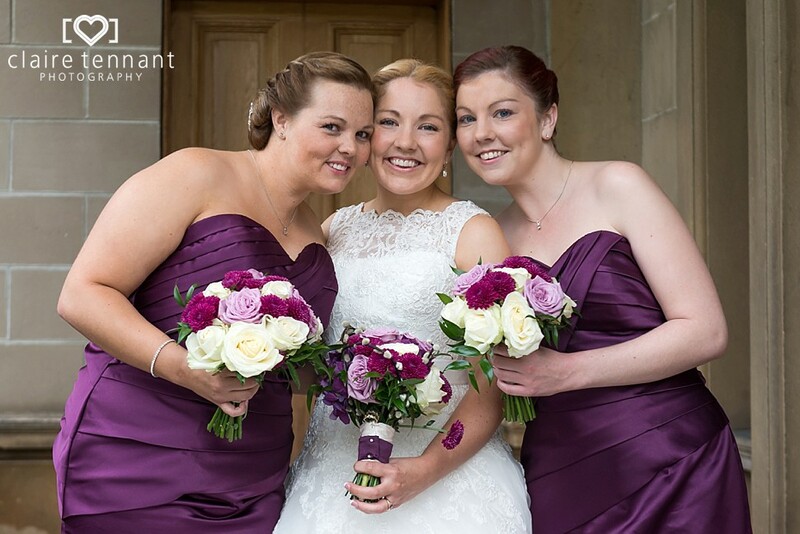 Catriona got ready at her parent’s house with her bridesmaids on the morning of her wedding. 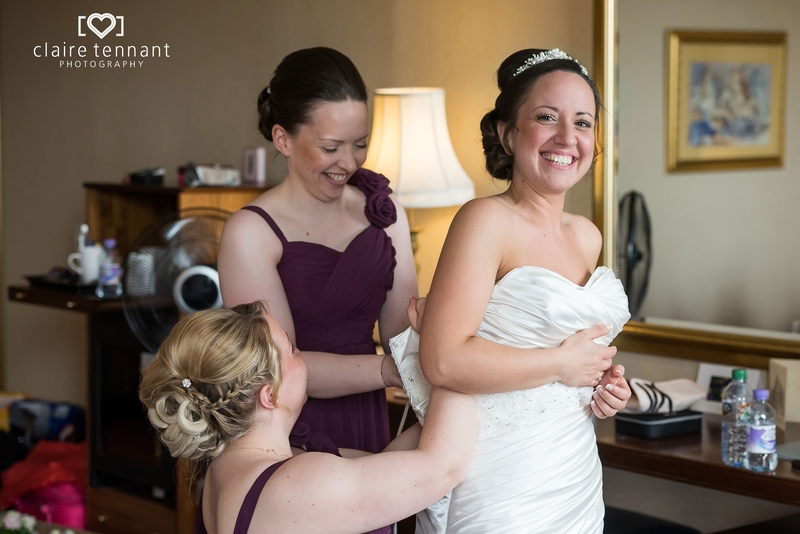 There were lovely moments as the bridal party interacted during preparations. 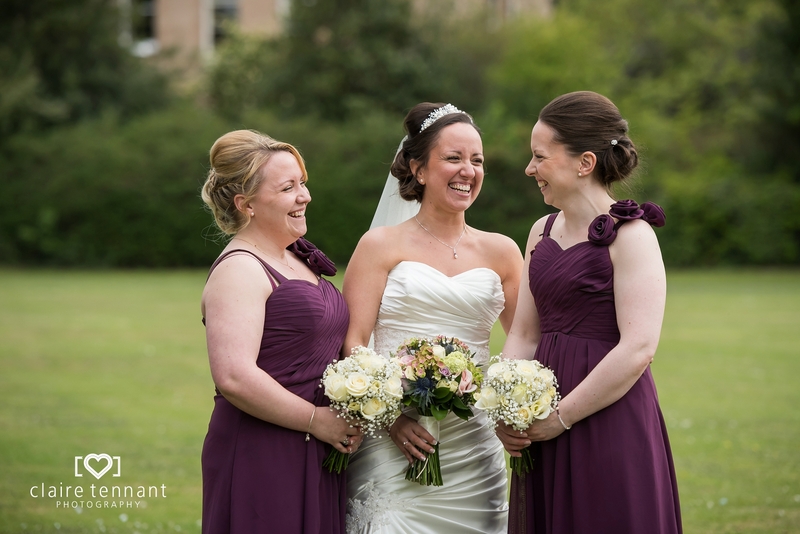 The girls were ready early so we were also able to capture some beautiful portraits in the garden. 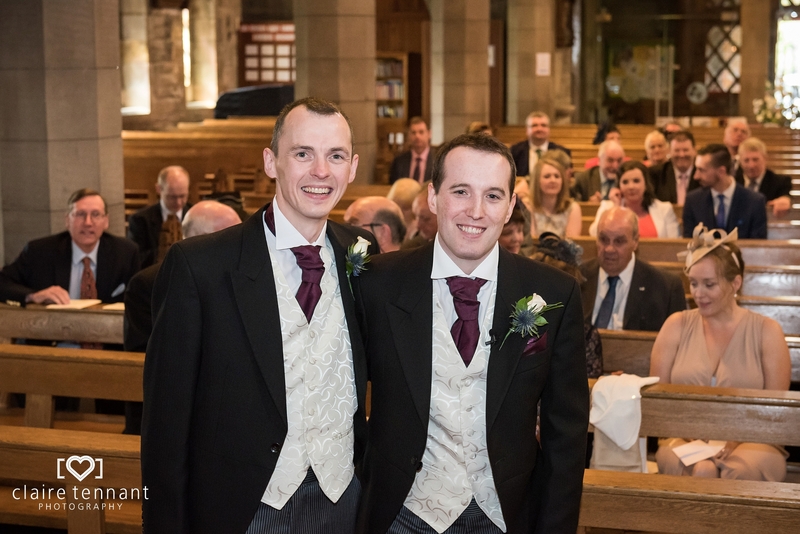 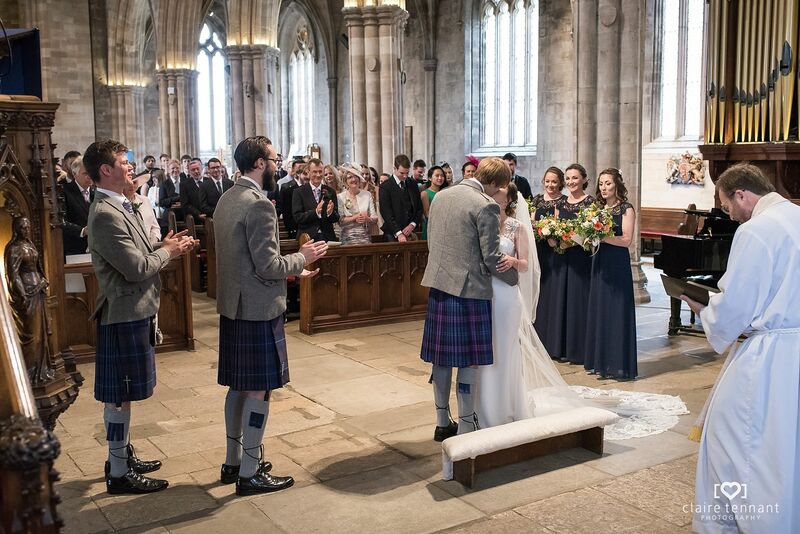 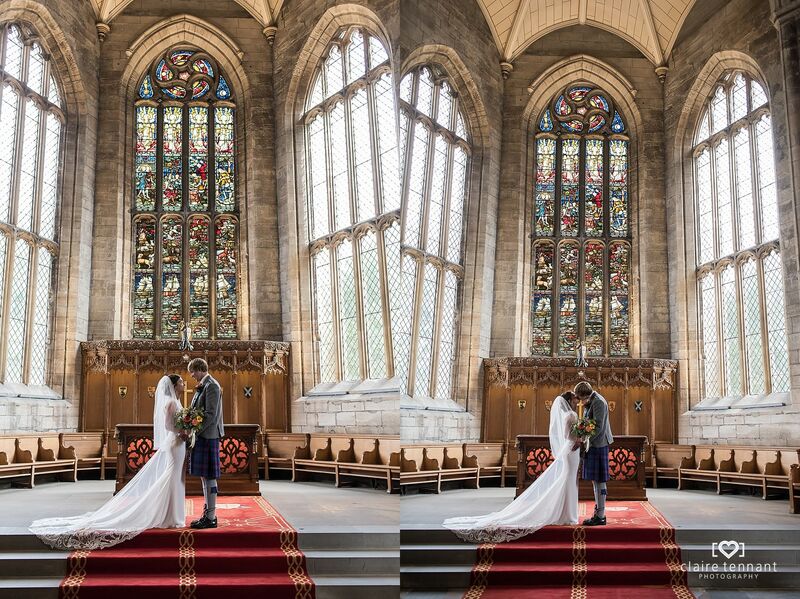 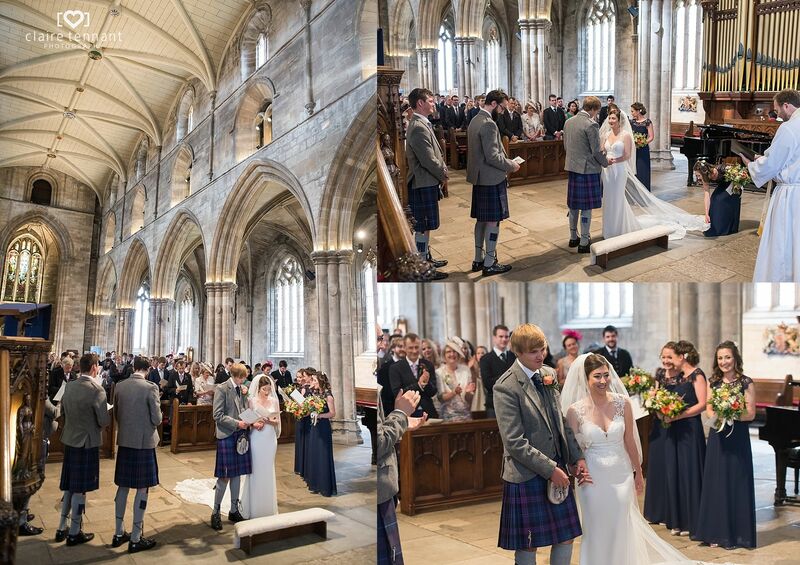 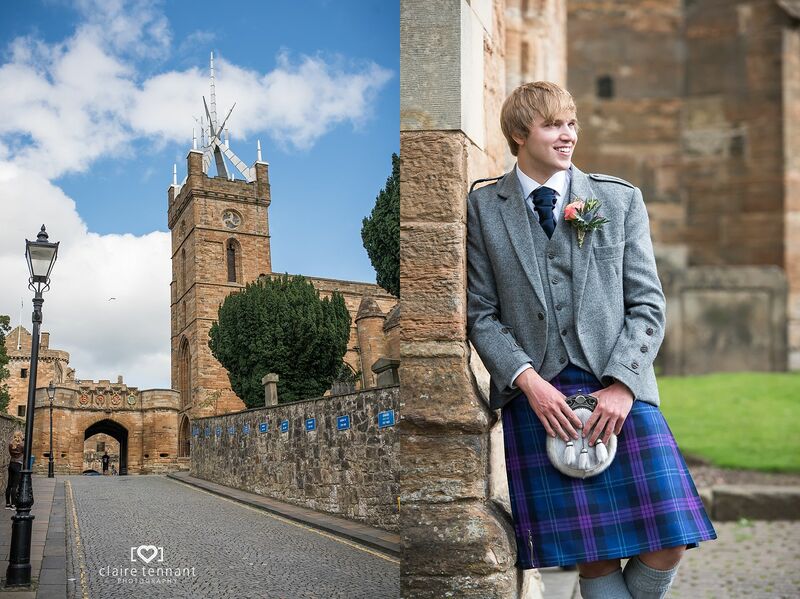 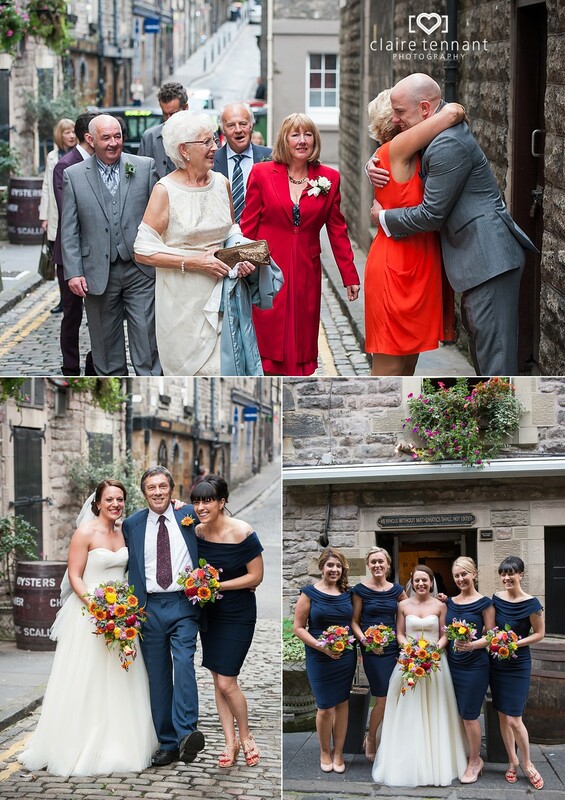 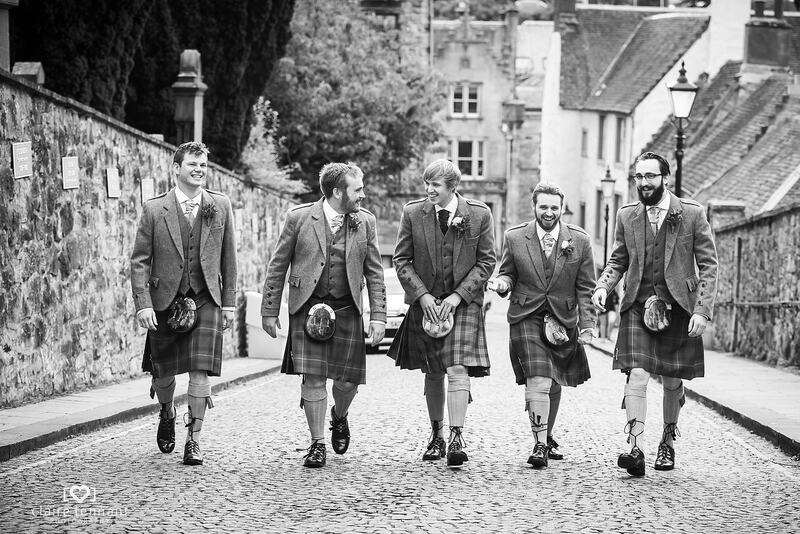 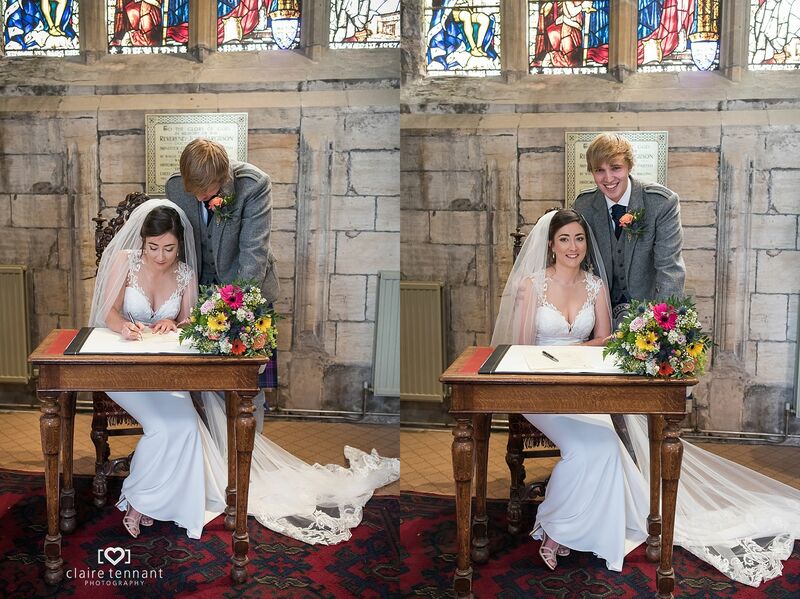 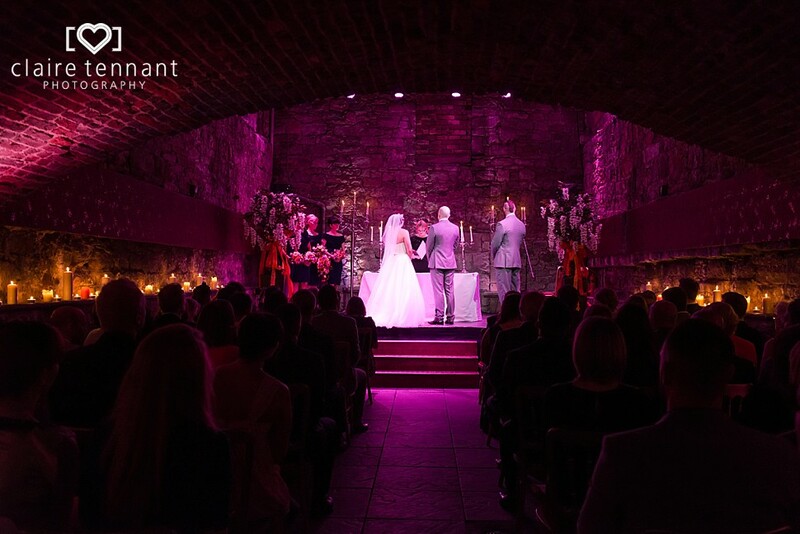 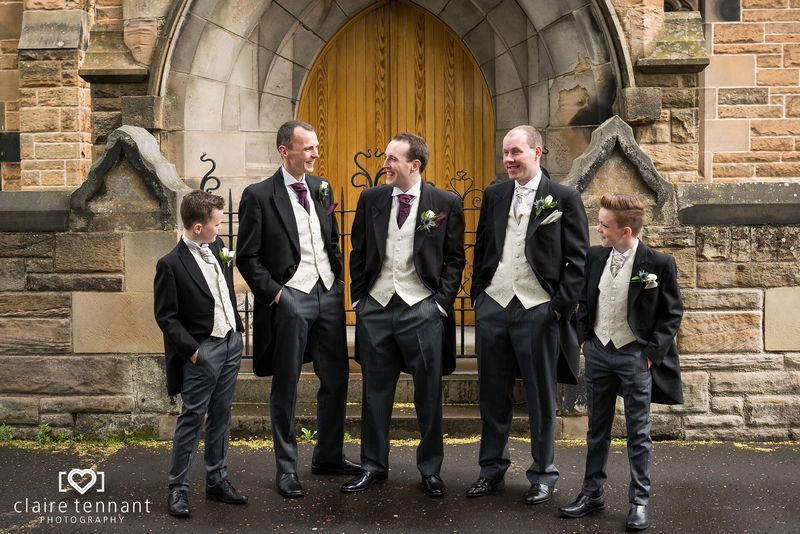 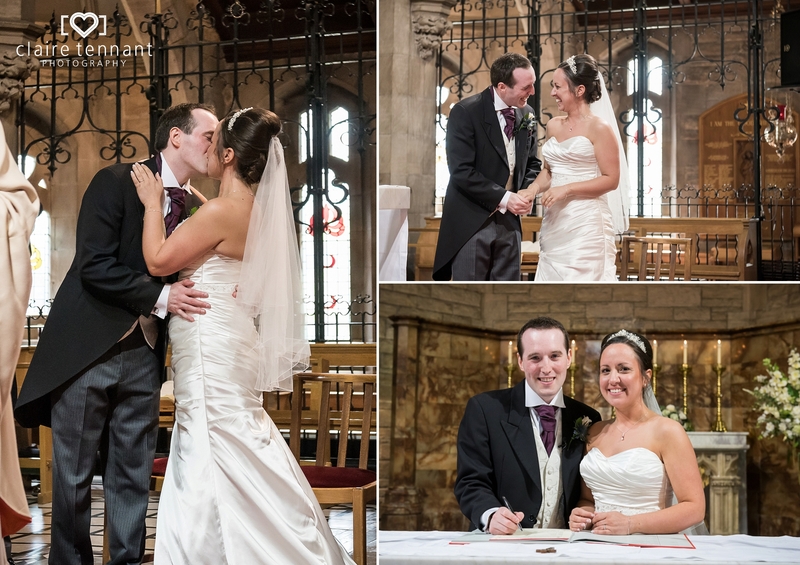 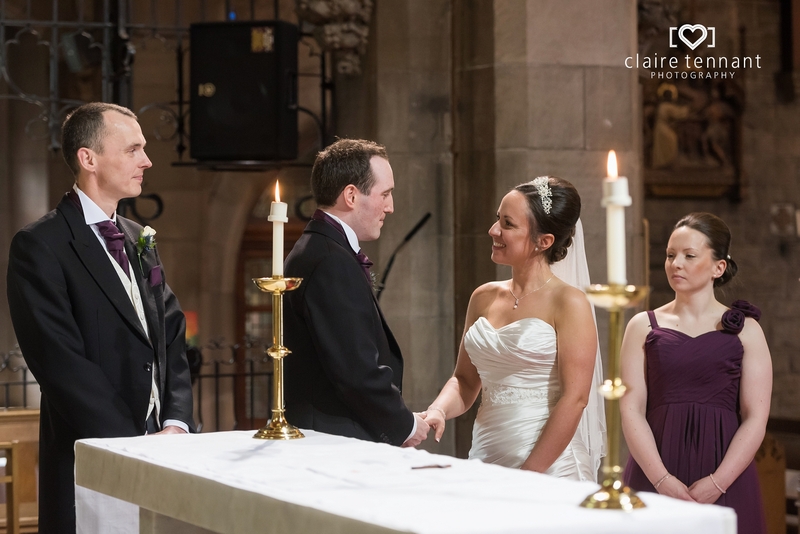 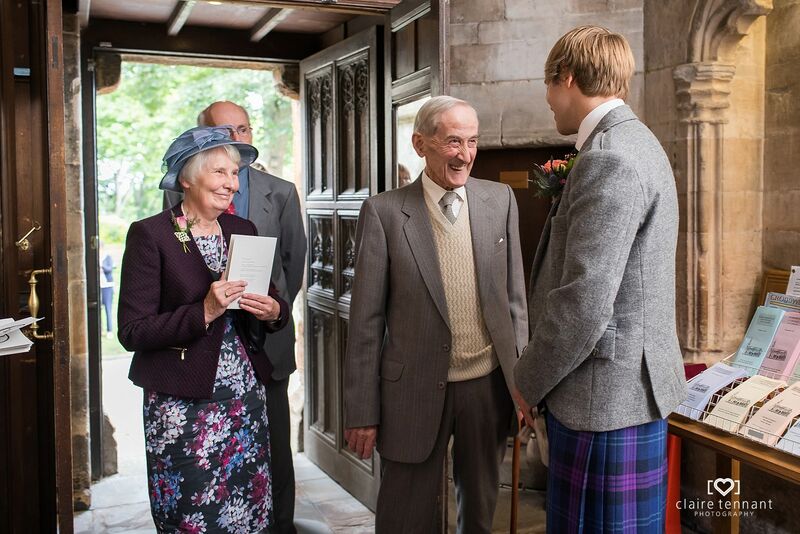 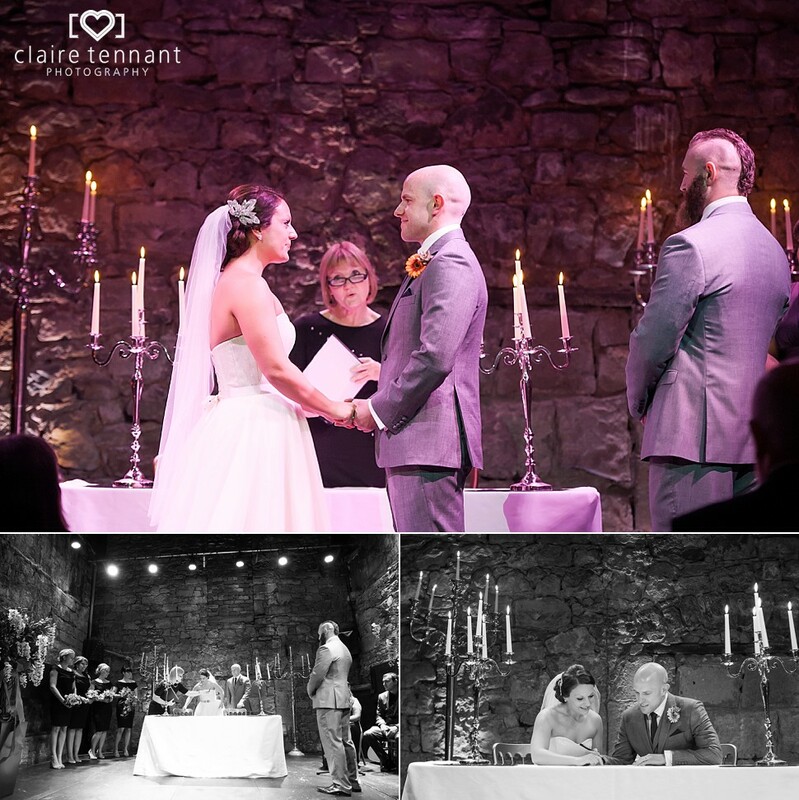 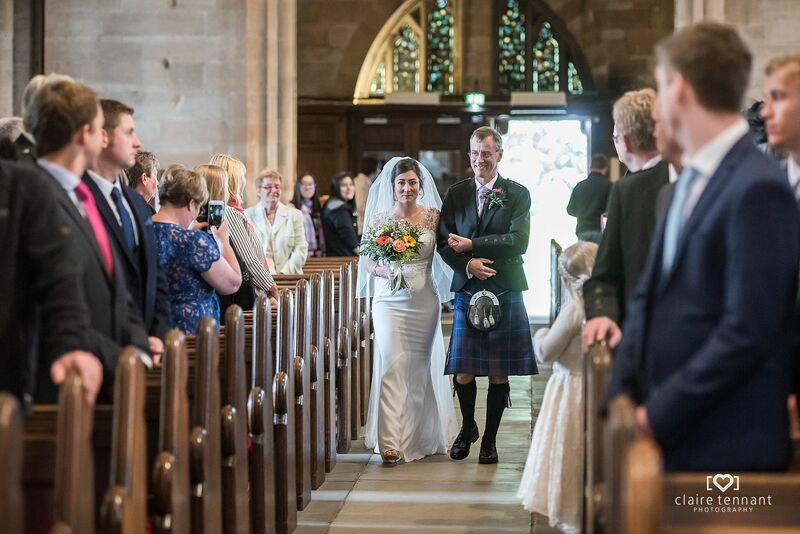 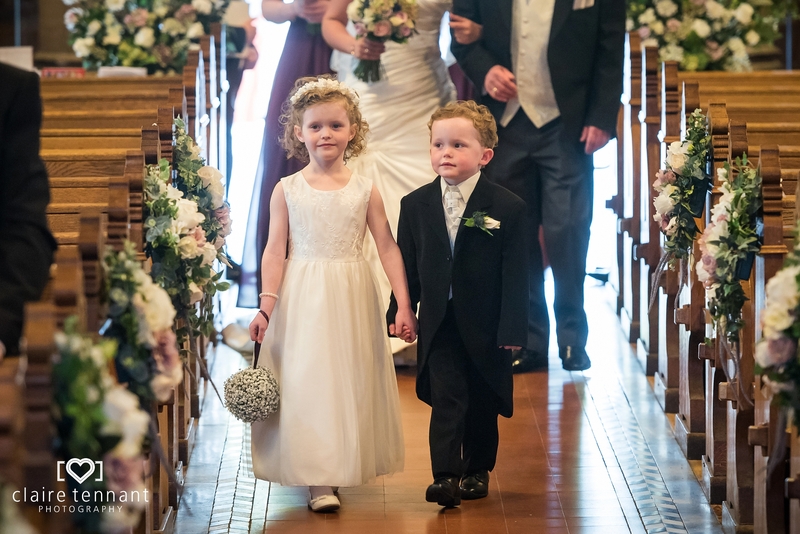 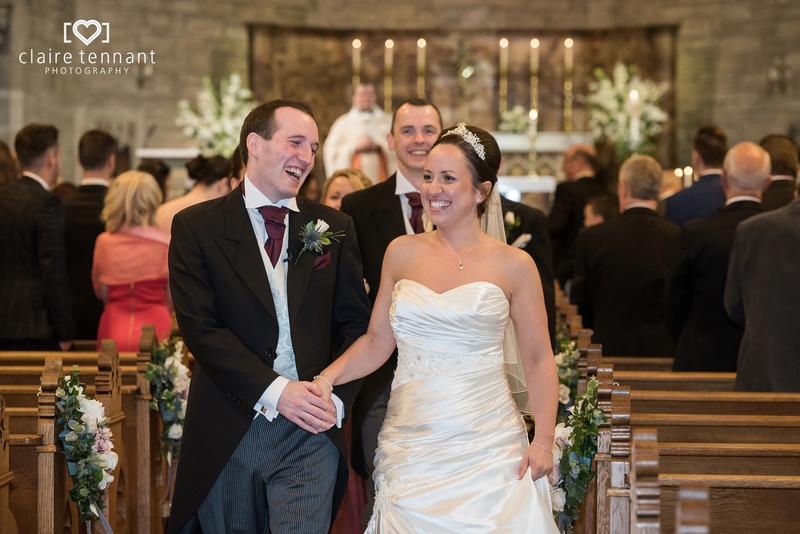 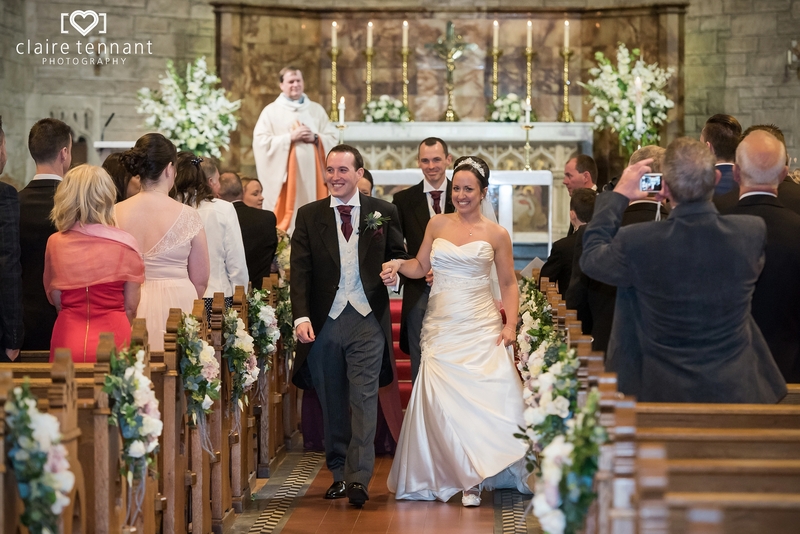 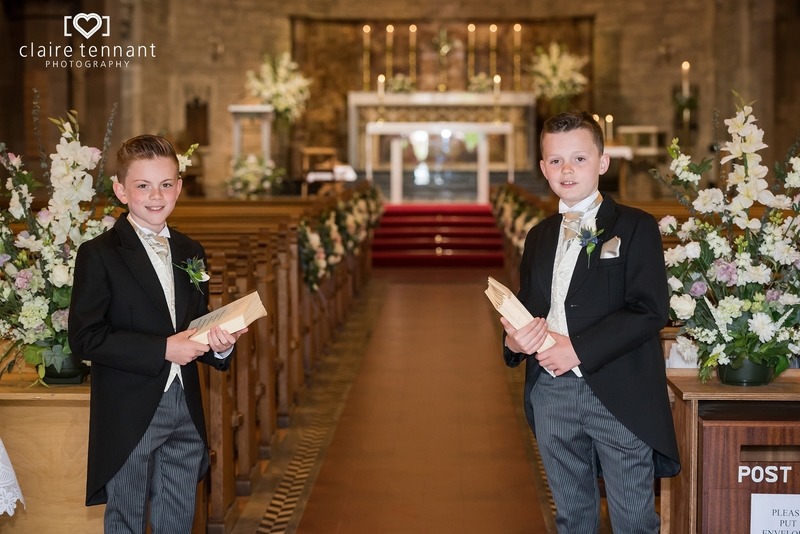 The ceremony which took place at stunning St Michael’s Church in Linlithgow. 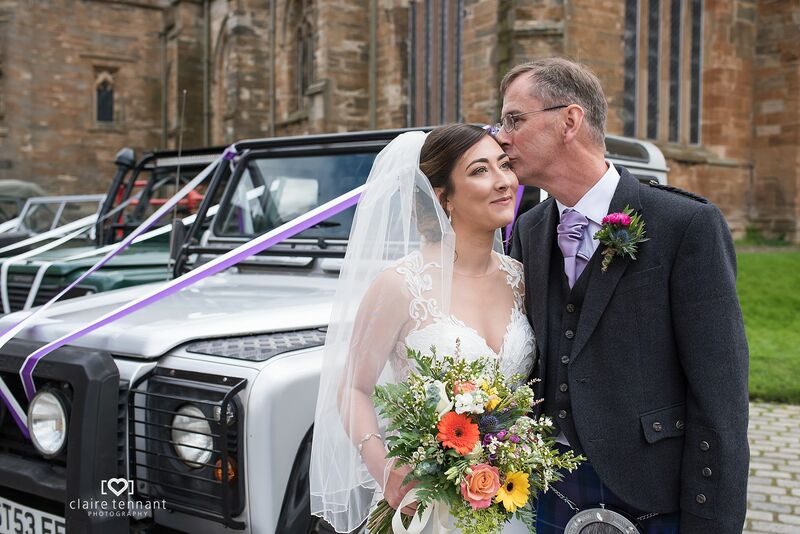 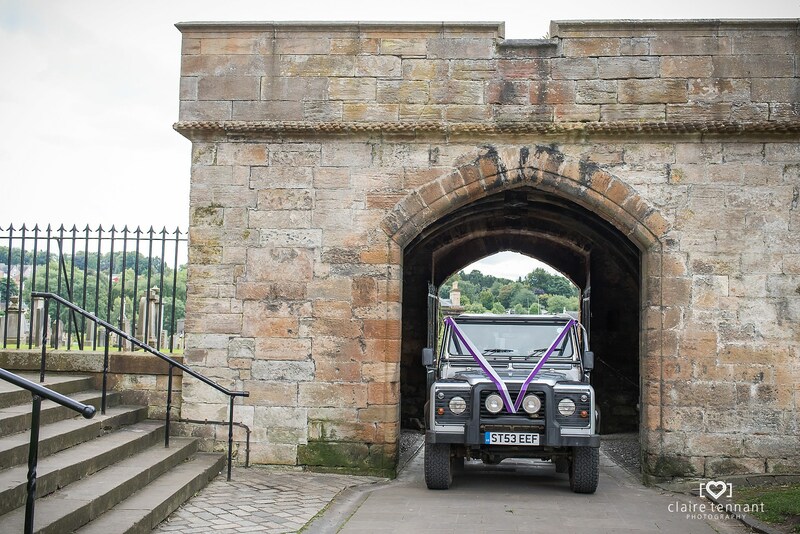 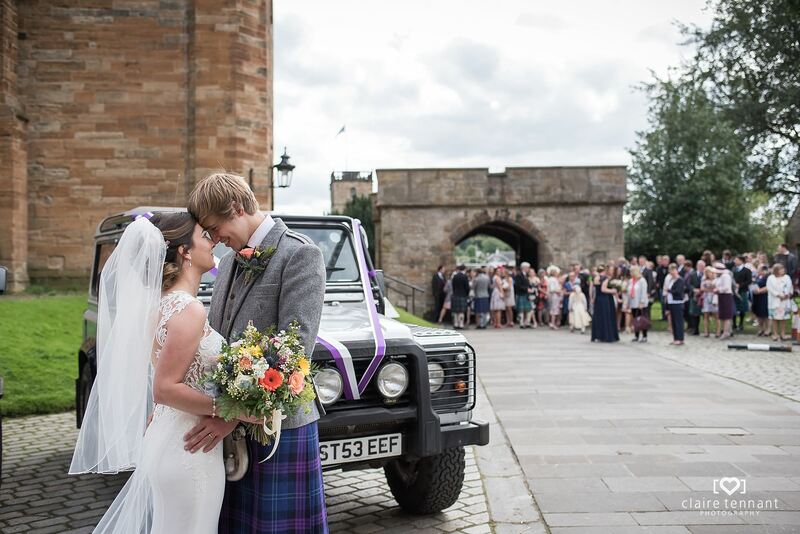 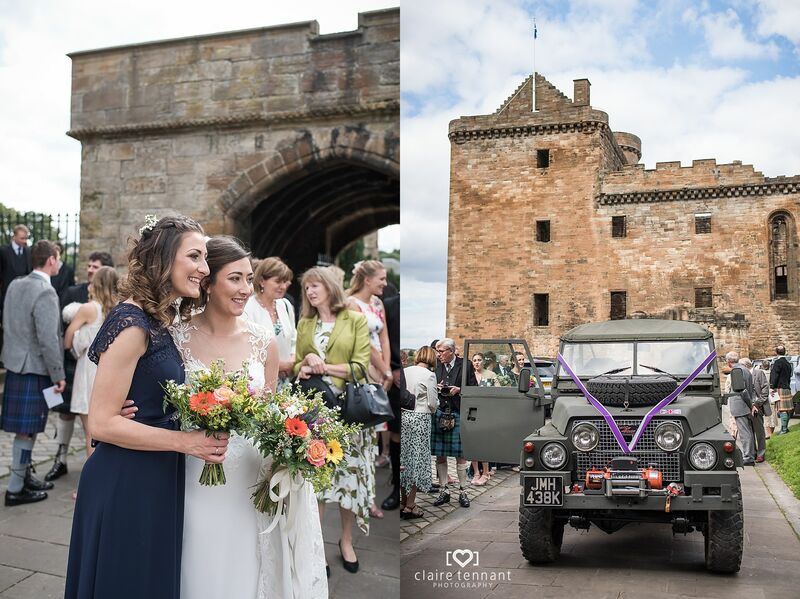 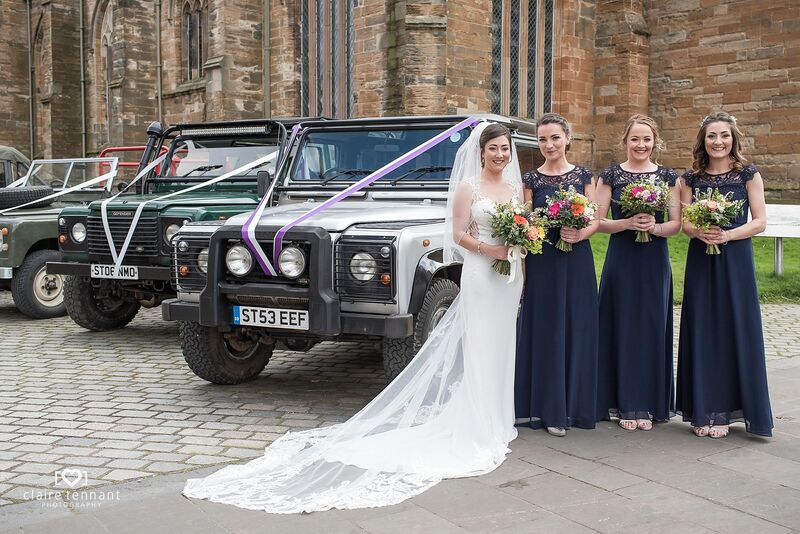 Catriona made a dramatic appearance at the church by arriving in an old cleaned up farm Land Rover! 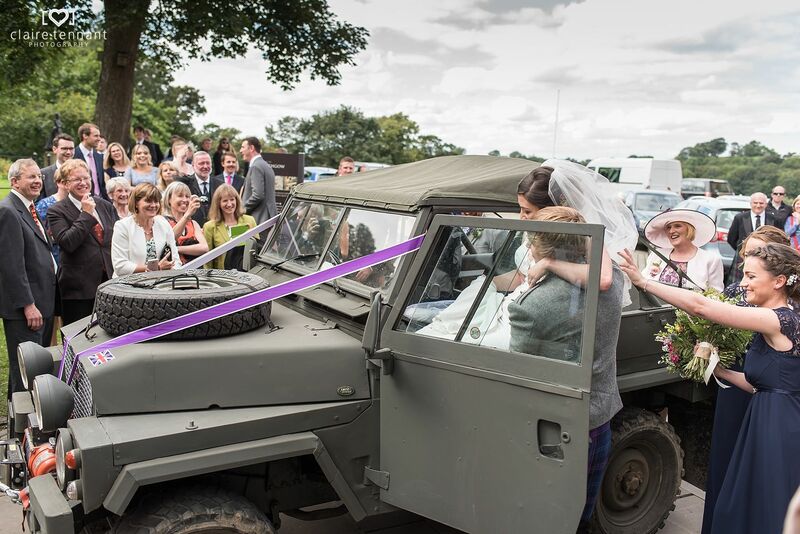 In fact there were several of them which were used to transport the bridal party – very cool! 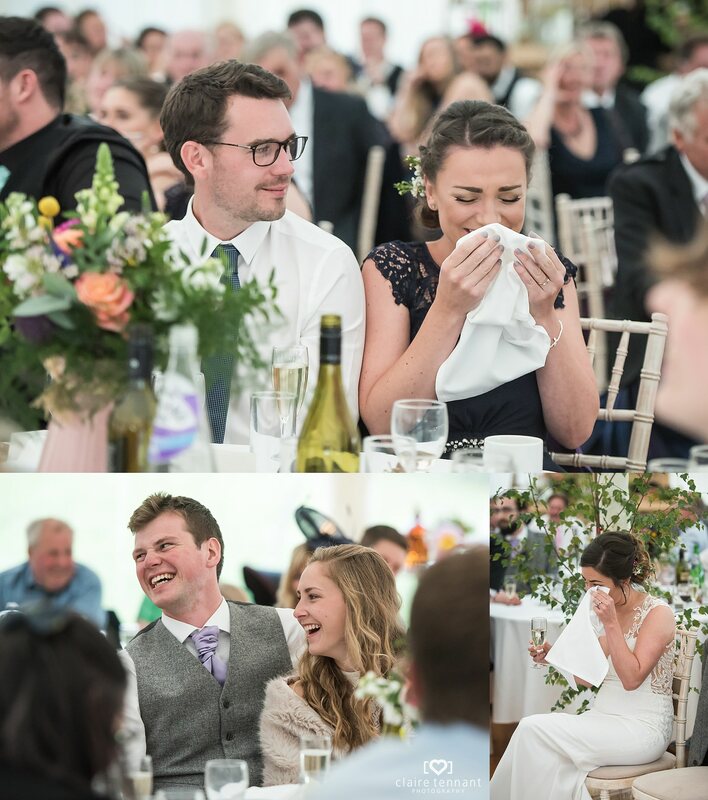 It was an emotional and heartfelt ceremony. 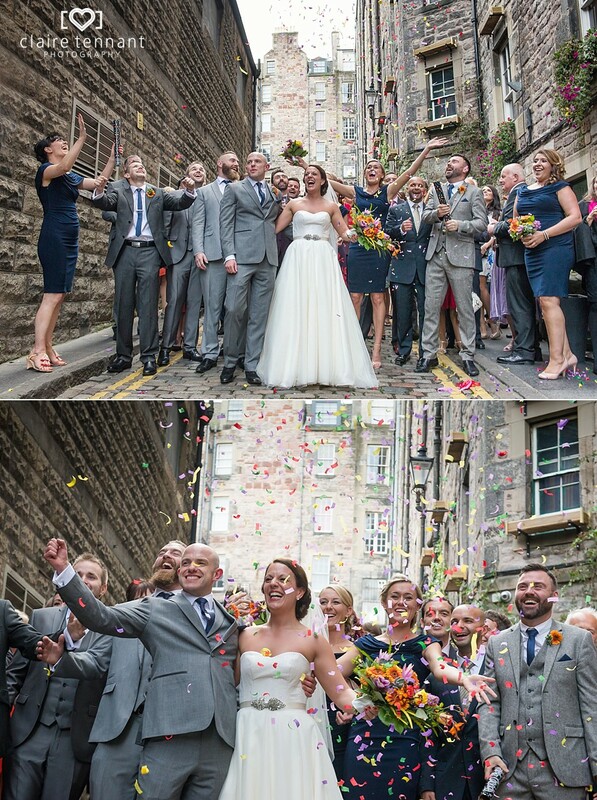 After some photos around St Michaels we set off for the farm reception where Richard and Catriona were greeted with confetti. 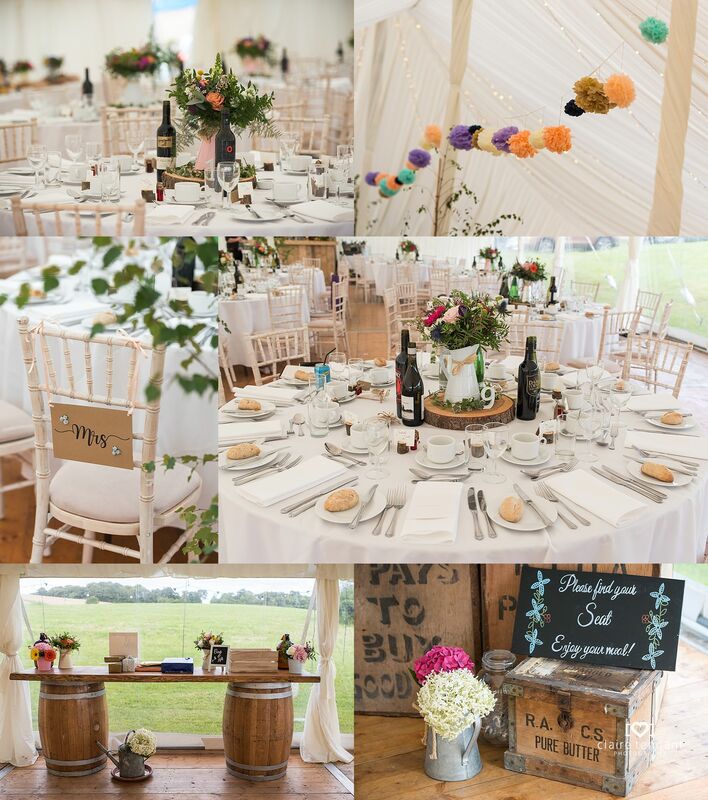 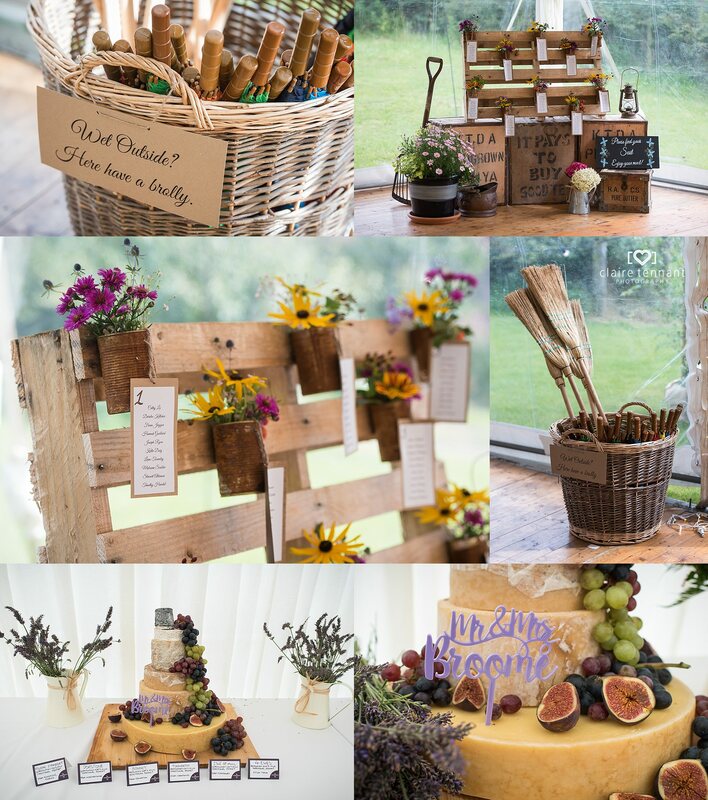 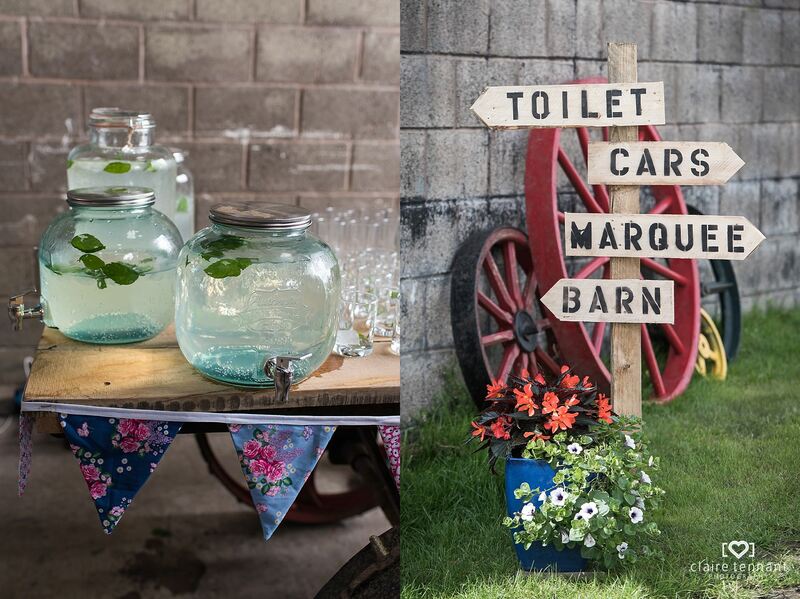 There was a lovely, relaxed atmosphere at the farm with so many personalised touches. 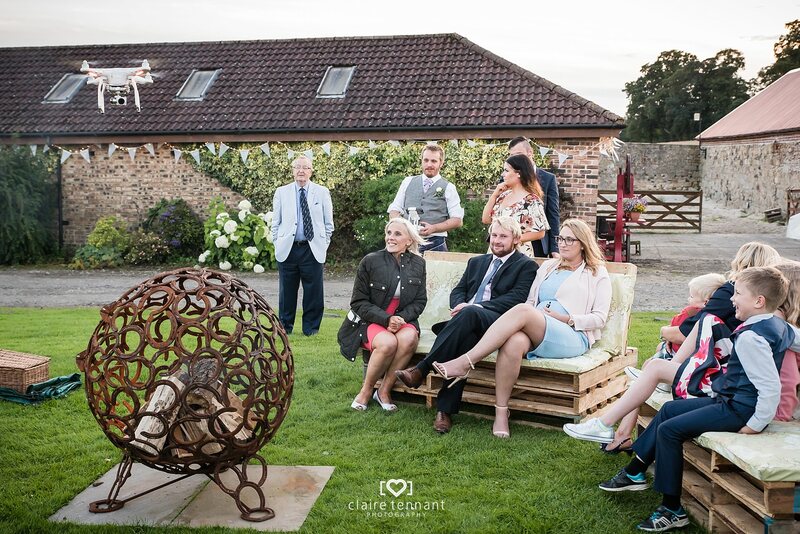 They had made their own fire pits from horseshoes and made many of the decorations around the venue themselves. 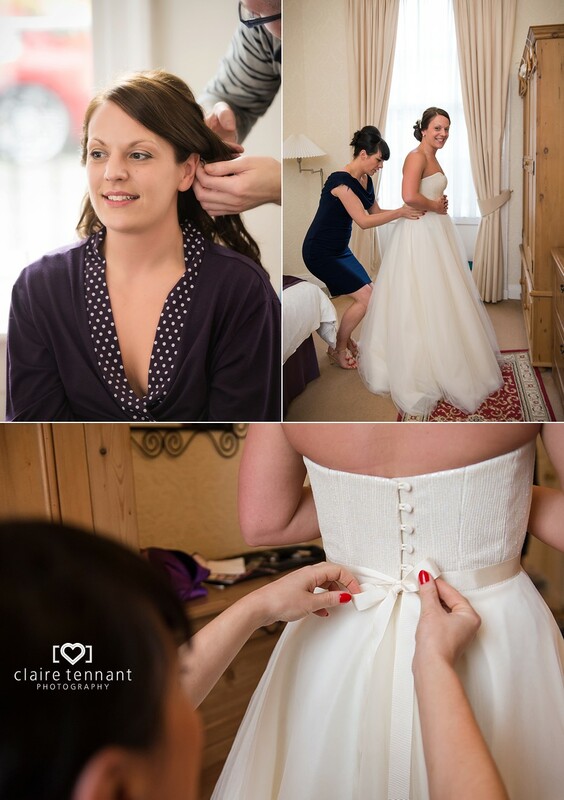 I really enjoyed photographing all of the personal details. 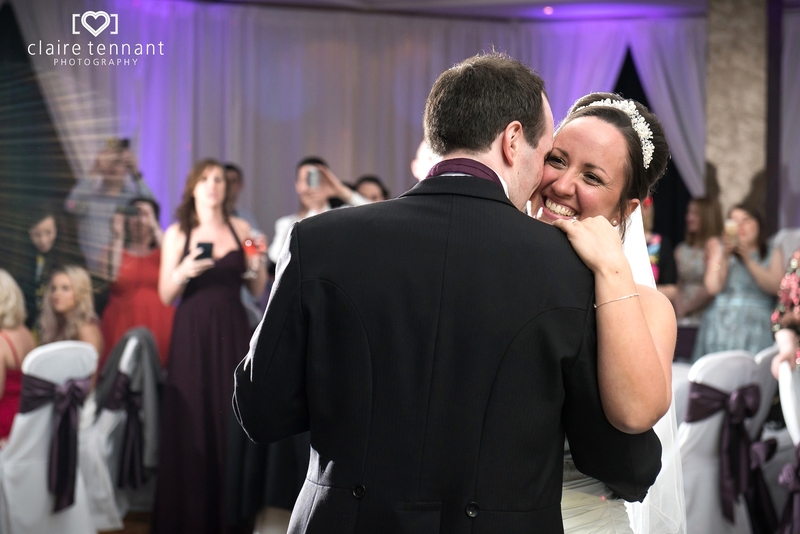 As I began searching for moments that would help to tell the story of the day I could tell everyone was having a great time. 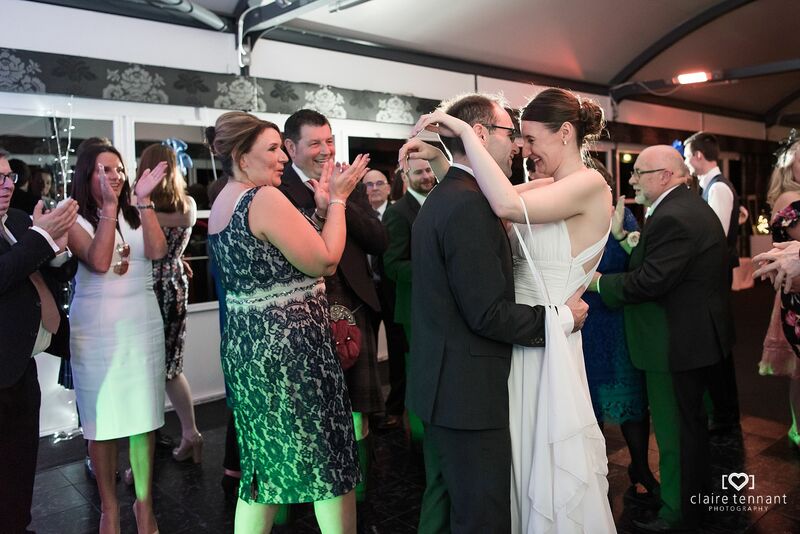 After some fantastic speeches in the marquee it was time to begin the evening celebrations. 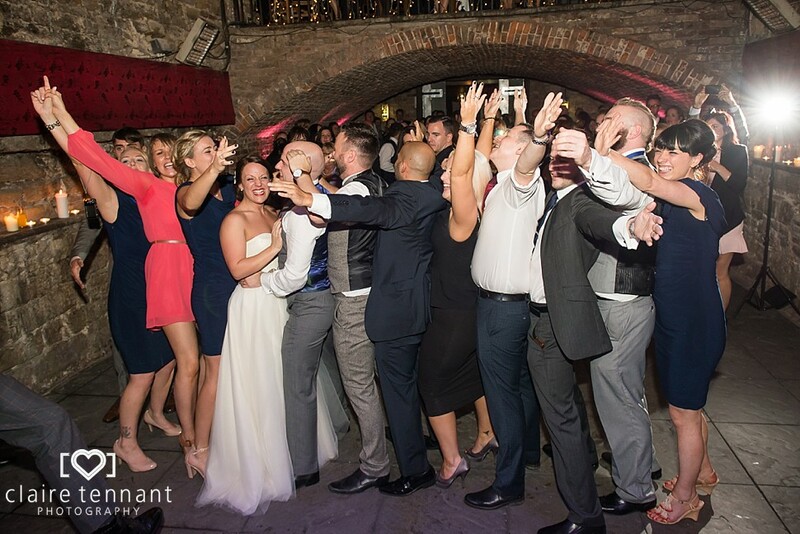 Everyone brought the day to an end by demonstrating their best dance moves! 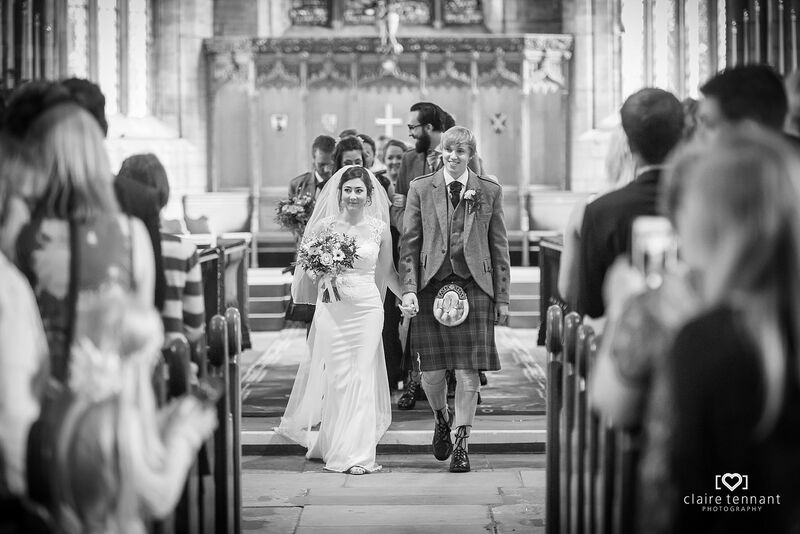 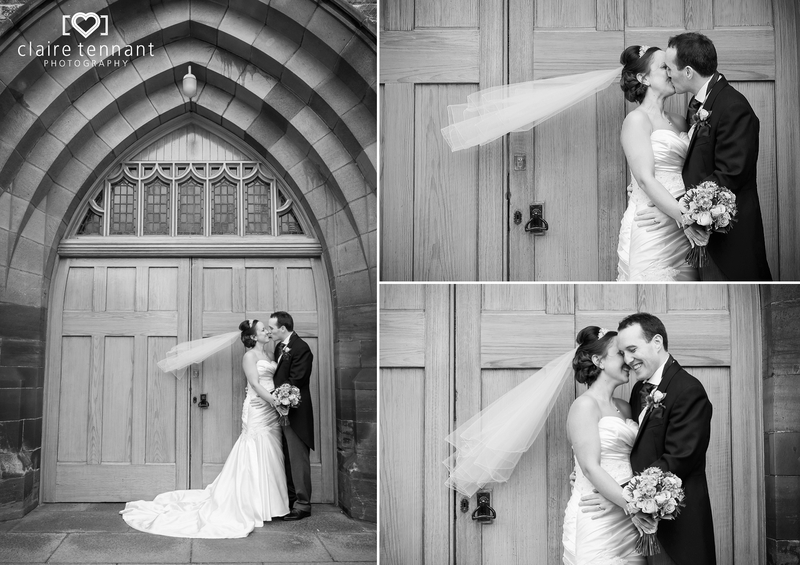 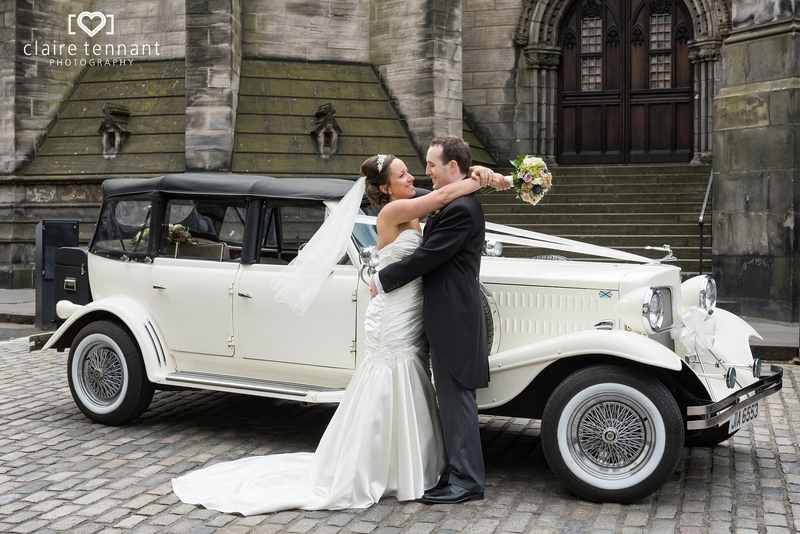 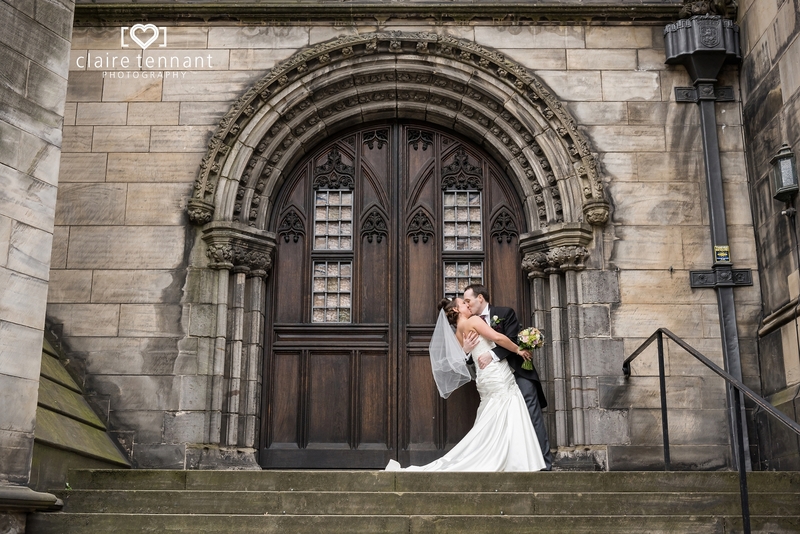 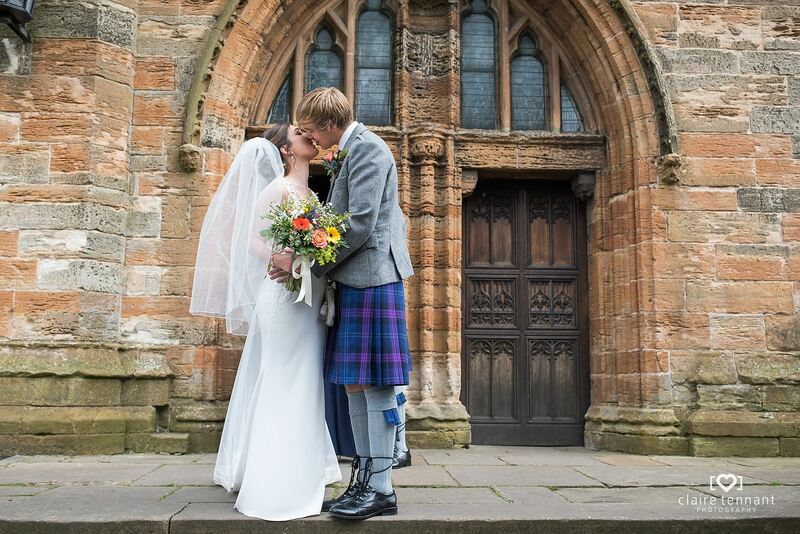 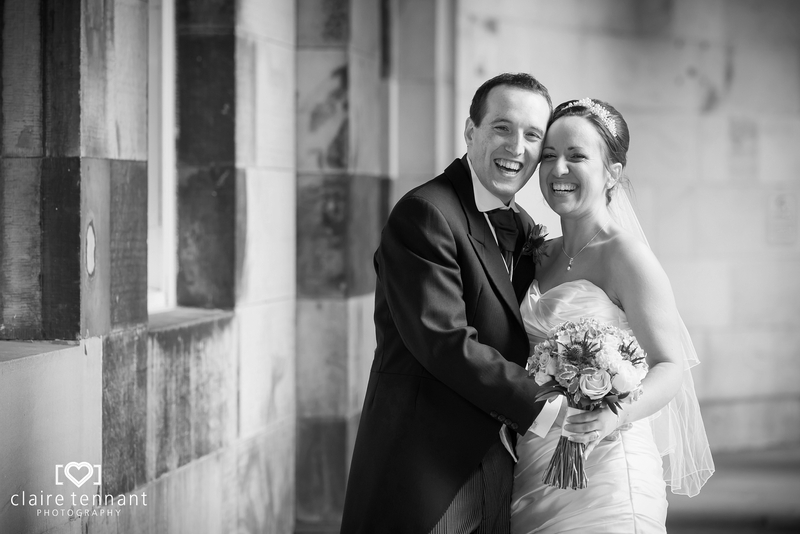 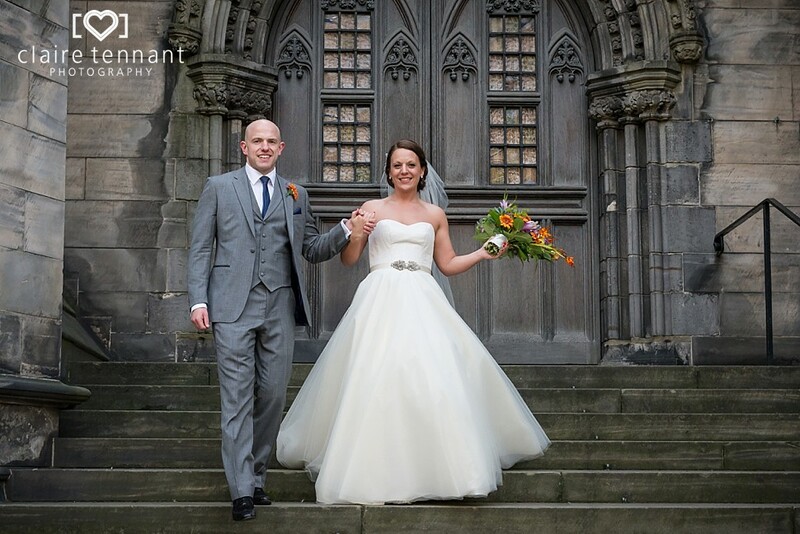 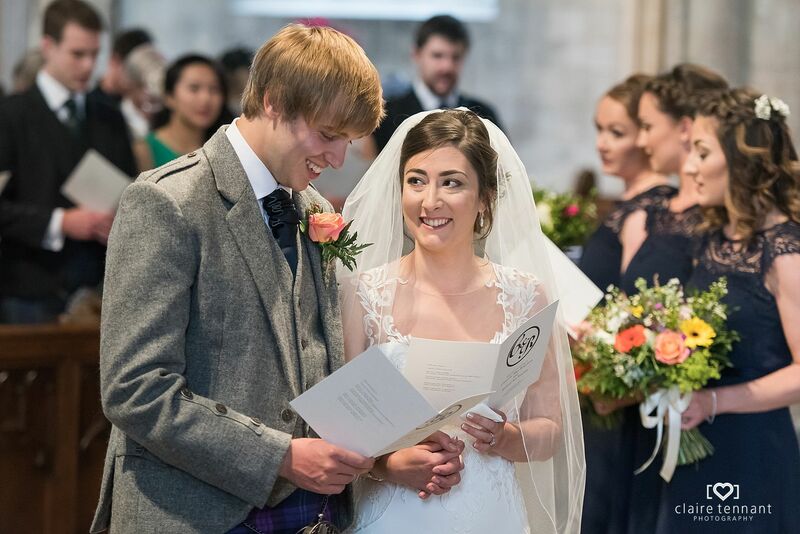 Theresa and Moray tied the knot at the beautiful St John’s Church in Portobello. 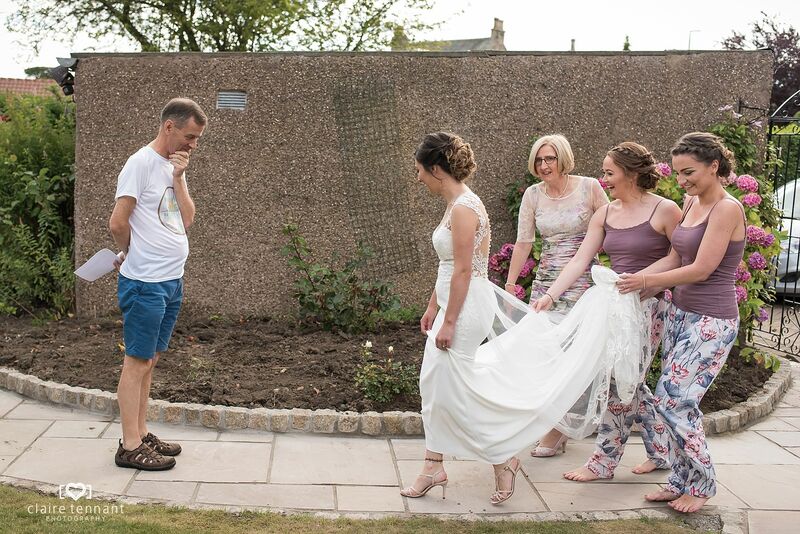 The park across the road from the church was perfect for the family and bridal party group photos. 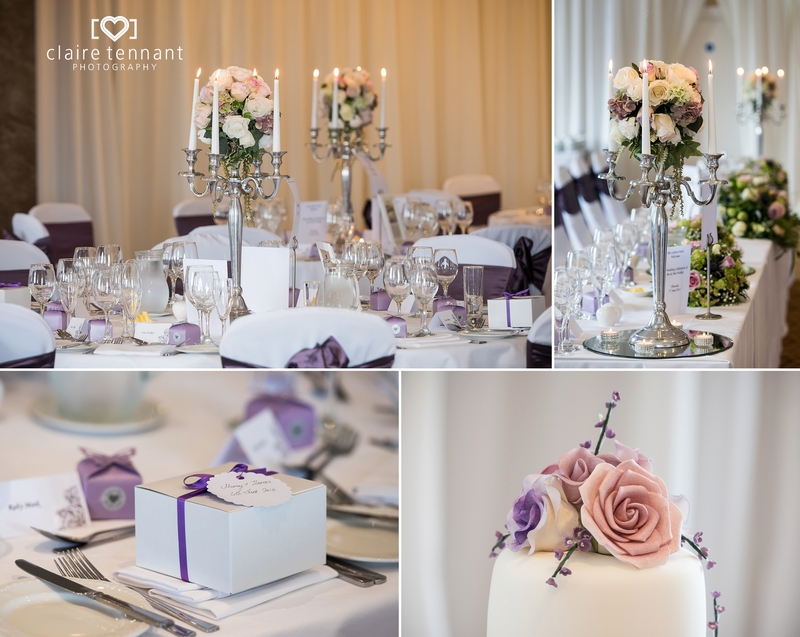 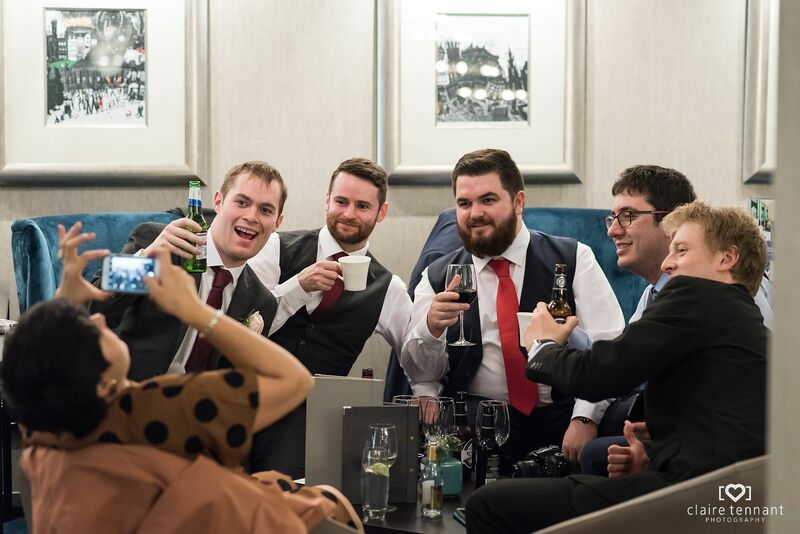 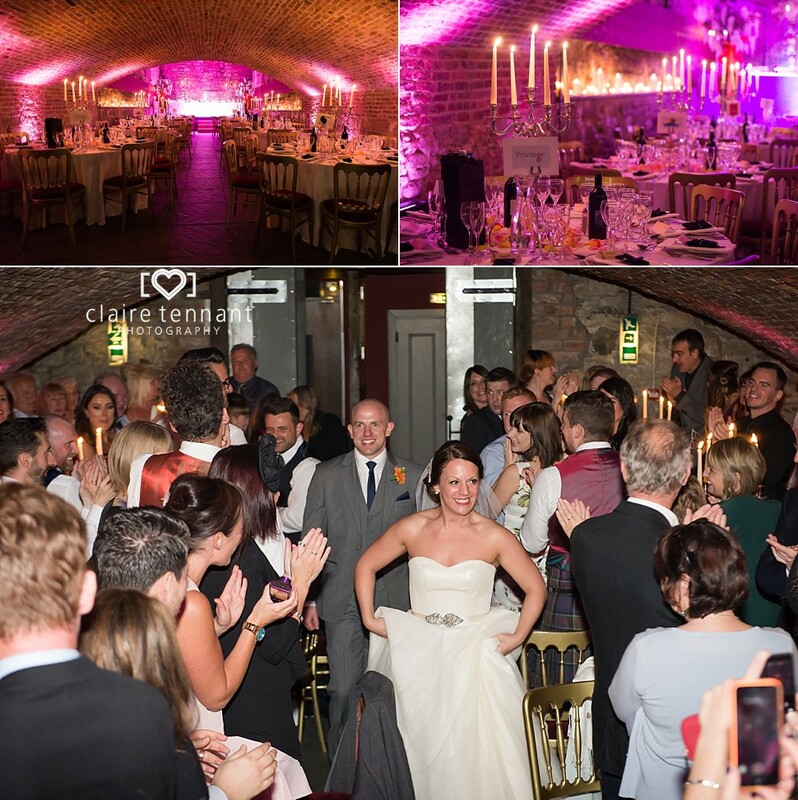 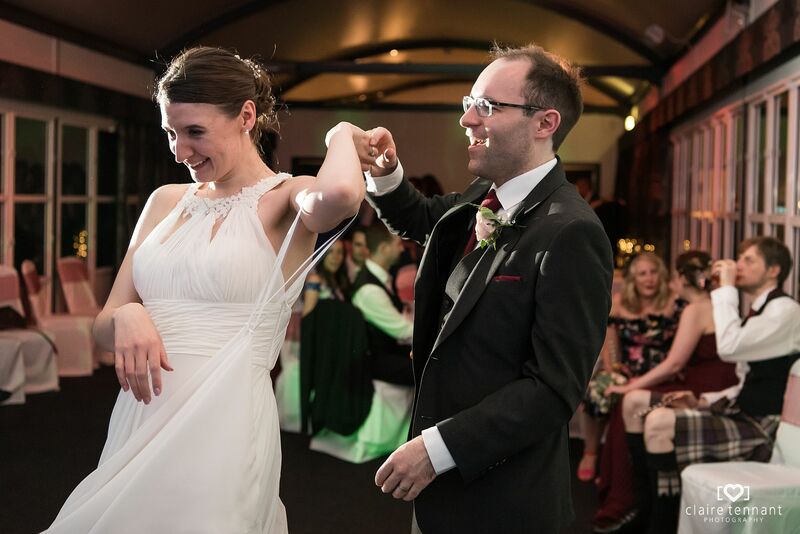 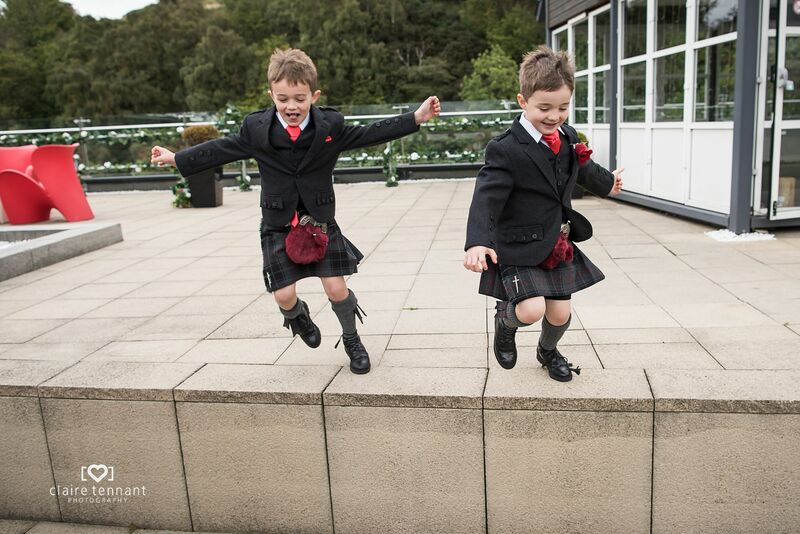 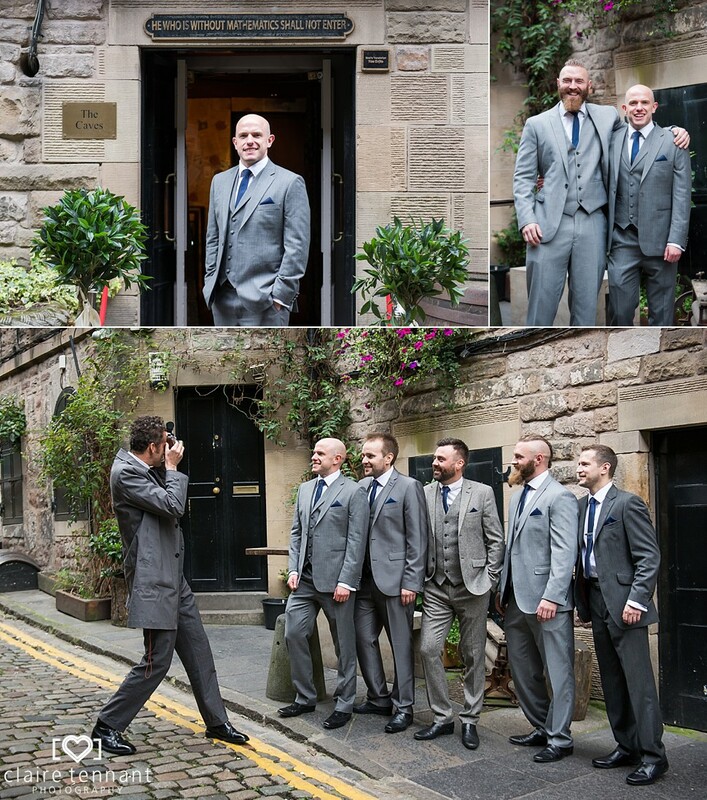 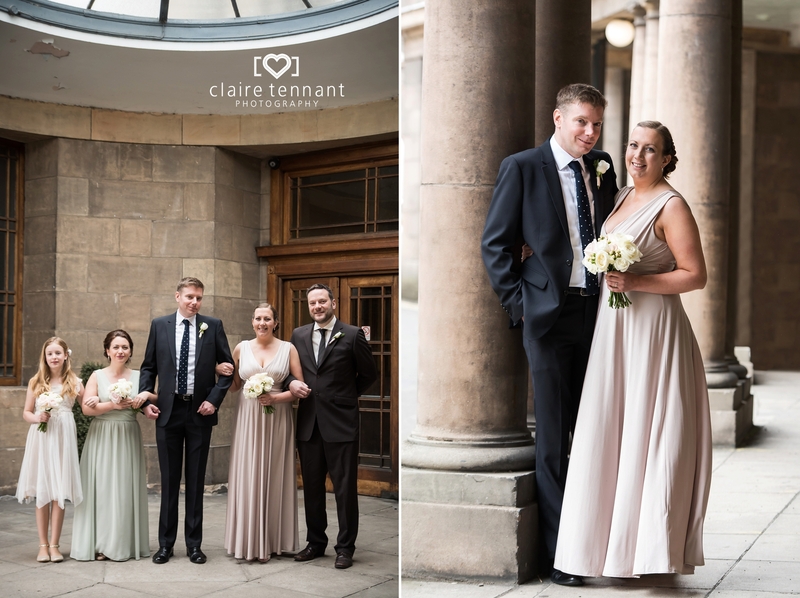 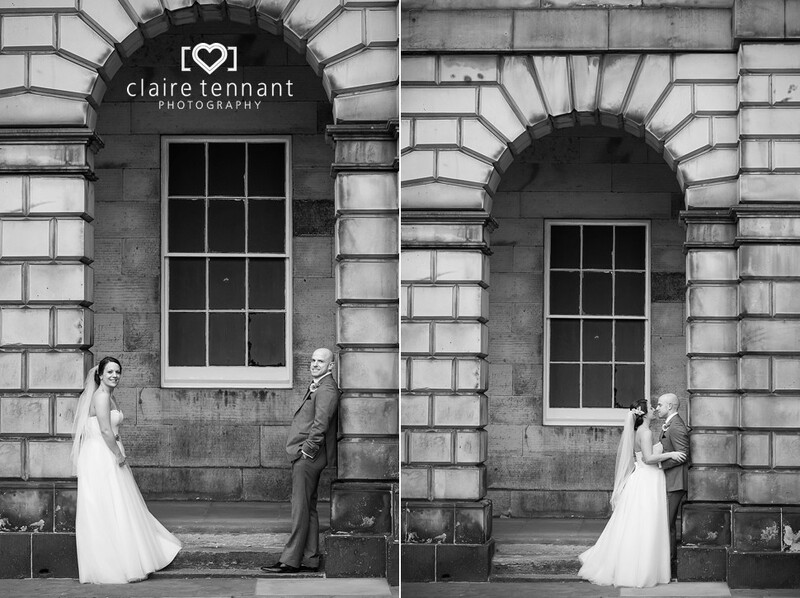 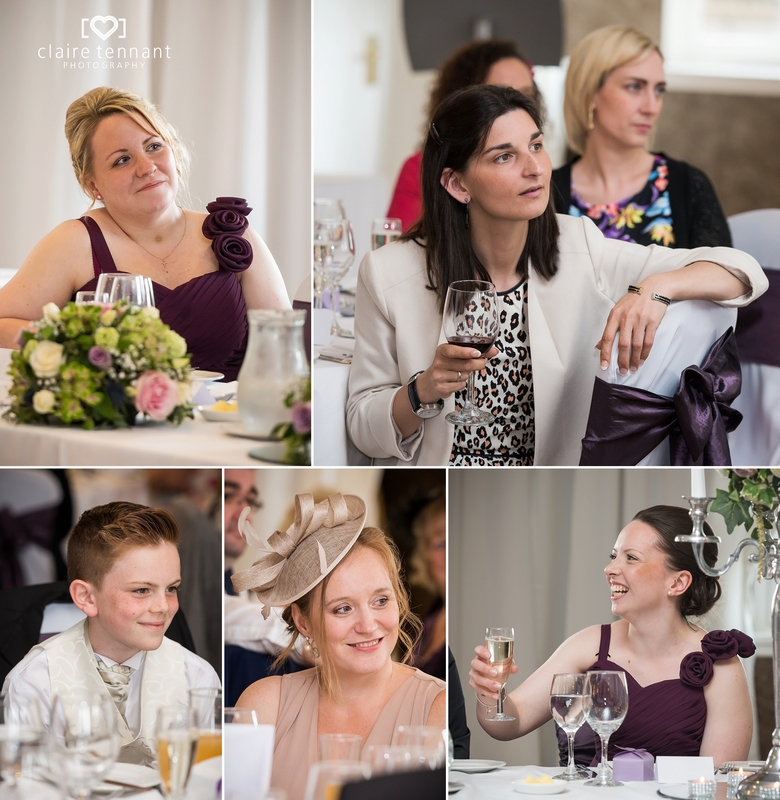 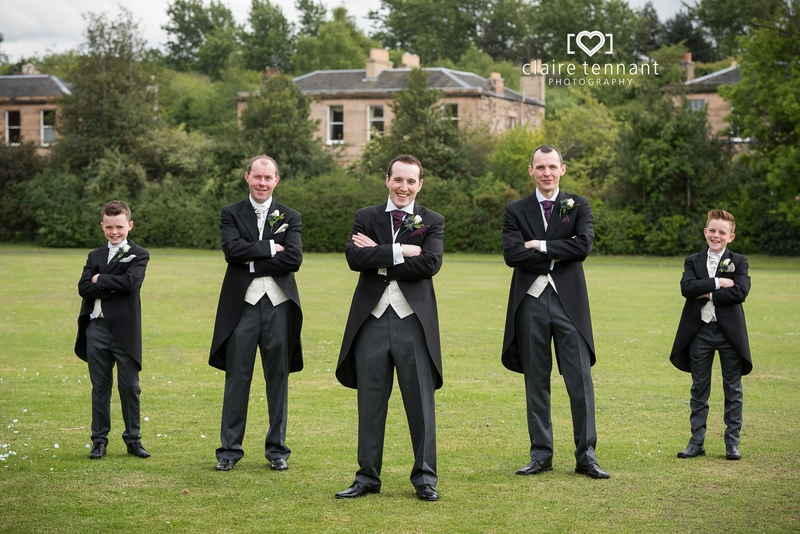 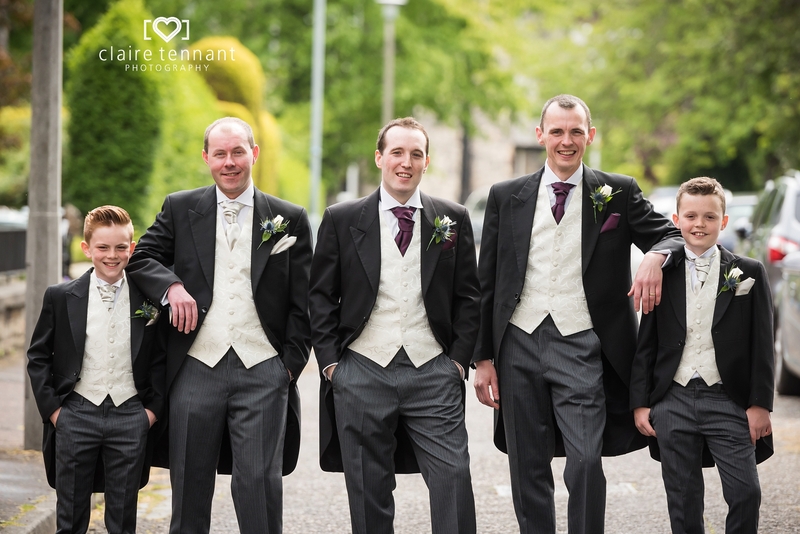 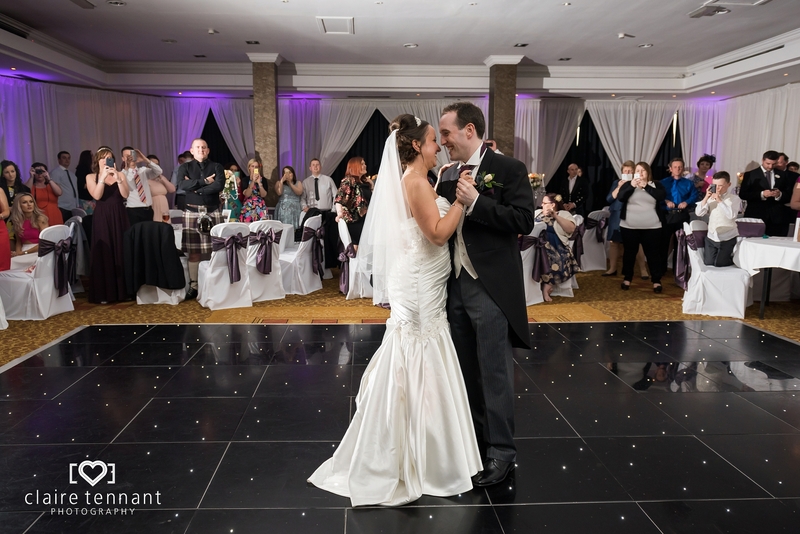 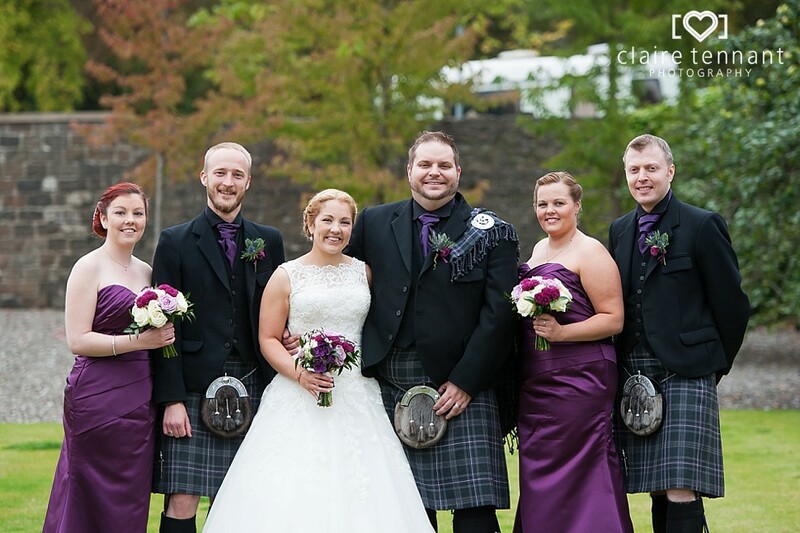 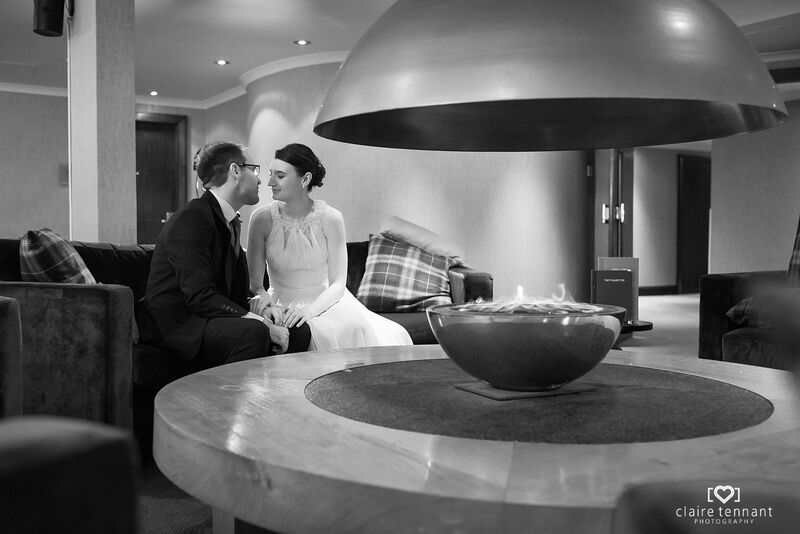 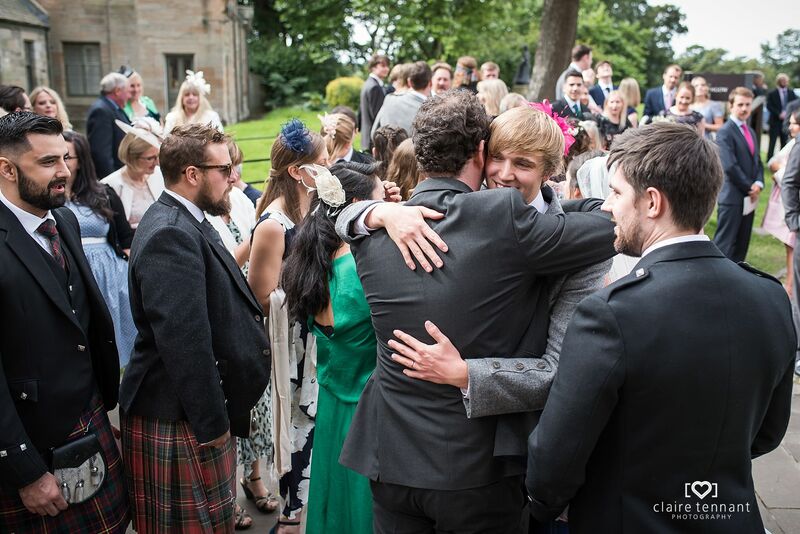 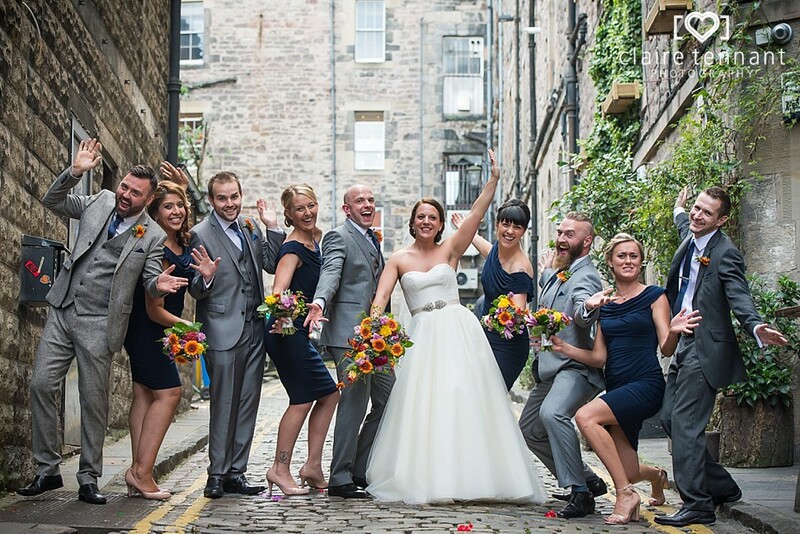 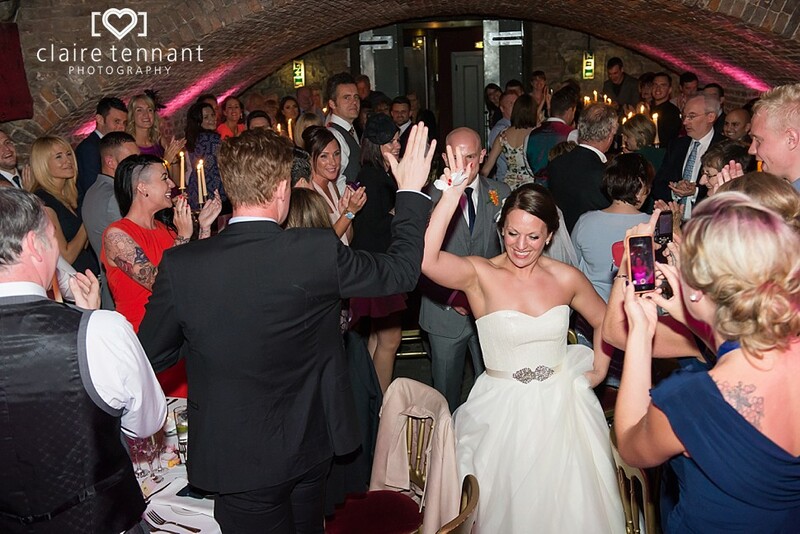 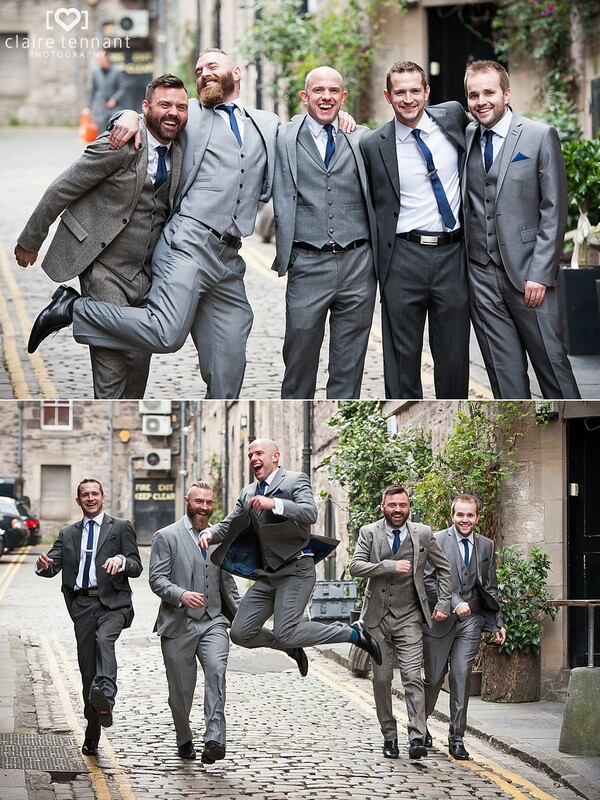 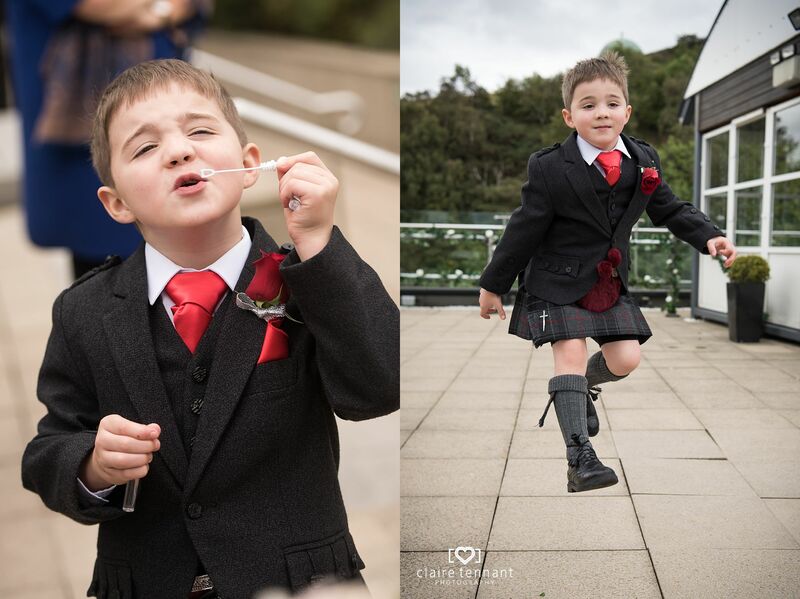 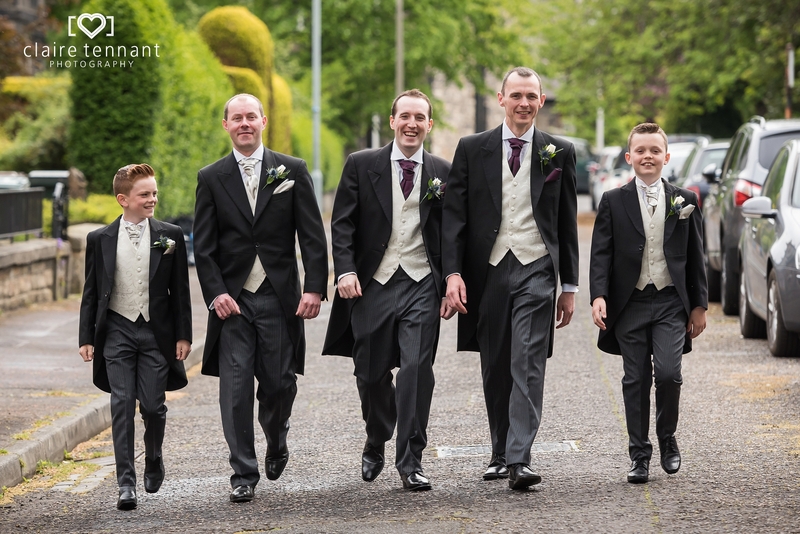 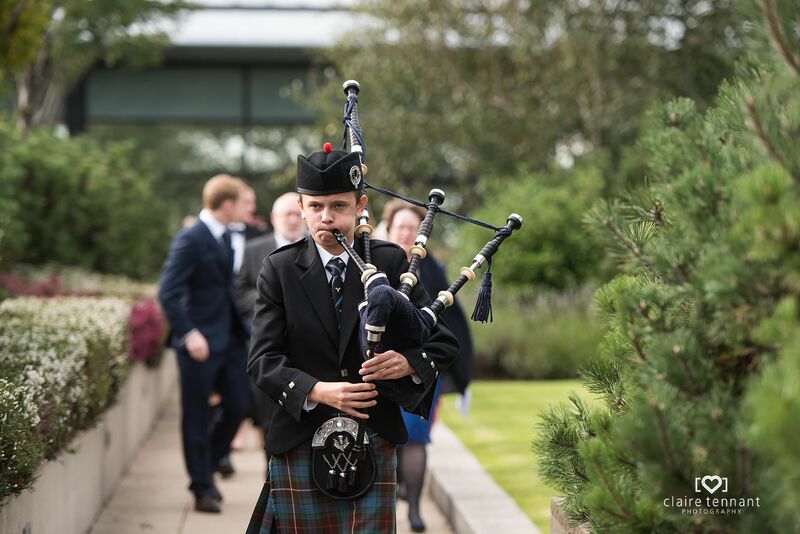 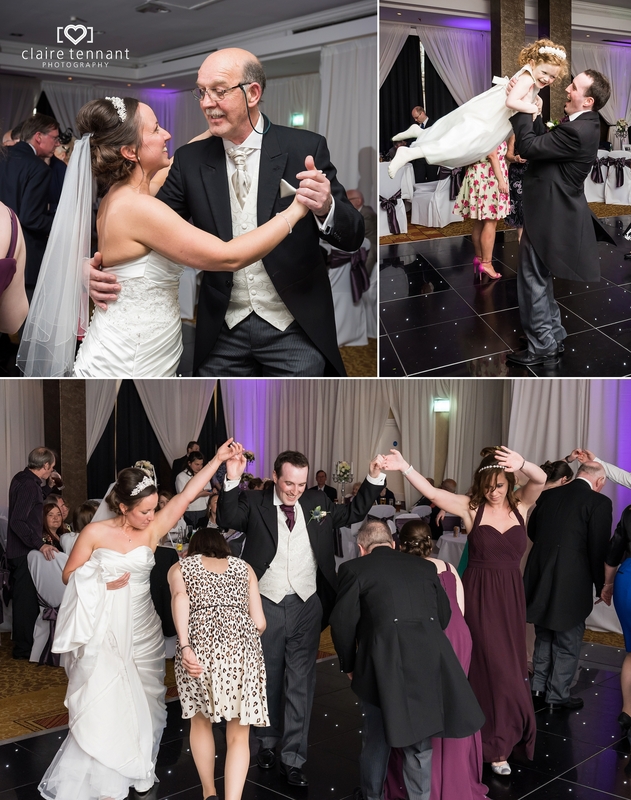 Everyone then travelled into Edinburgh to the Carlton Hotel for the stylish wedding reception. 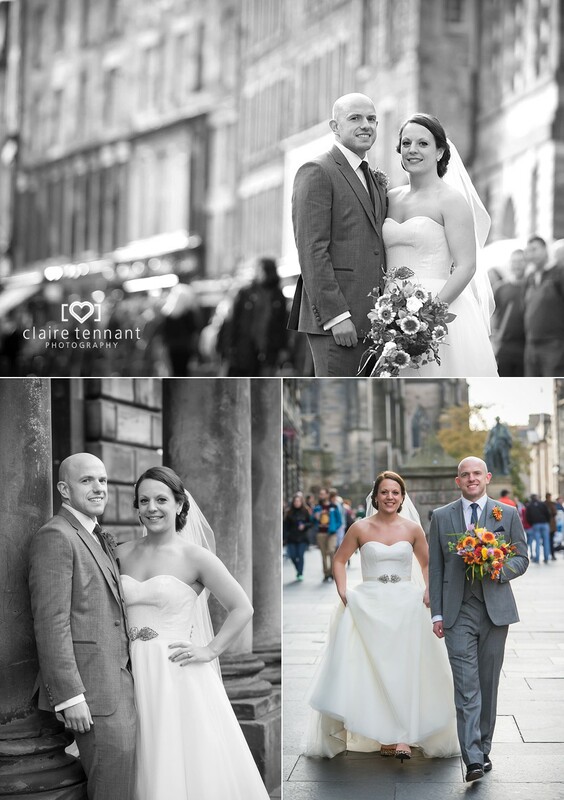 Meanwhile Theresa, Moray and I went to Edinburgh’s Royal Mile to take some romantic couple photos before re-joining their guest at the hotel. 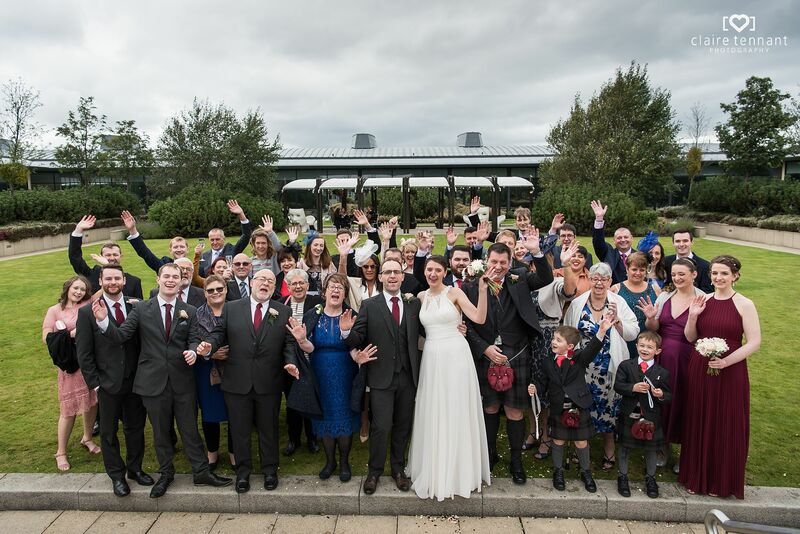 It was a fantastic happy day which was lovely to be a part of.